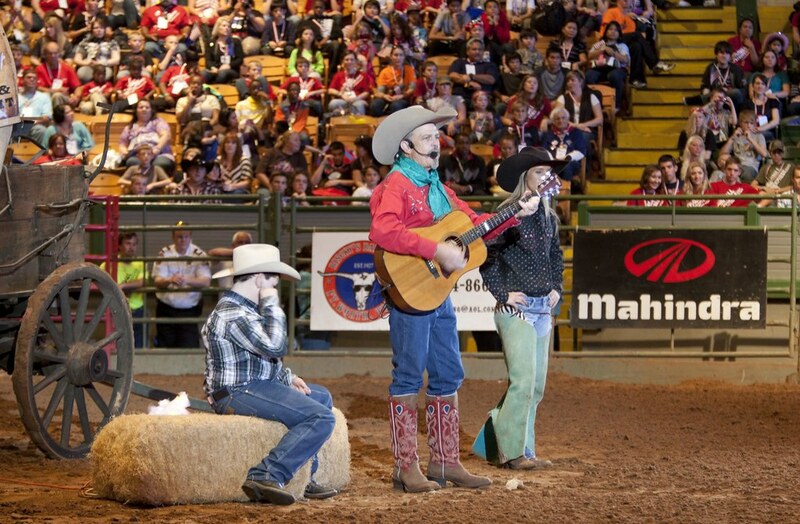 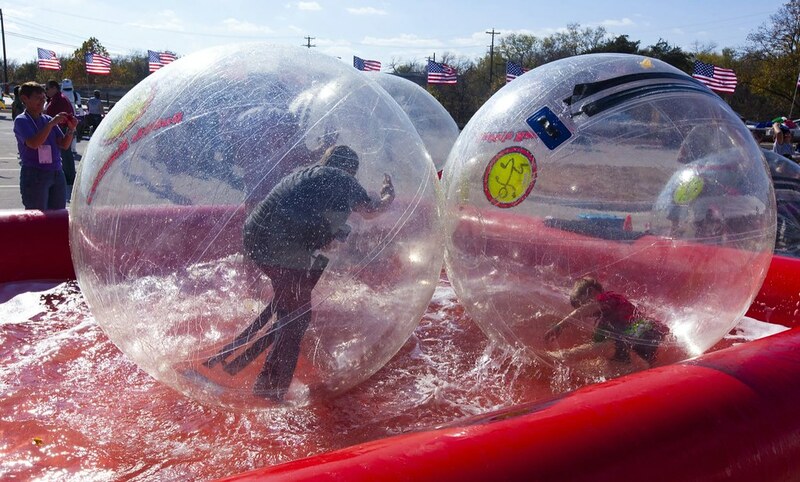 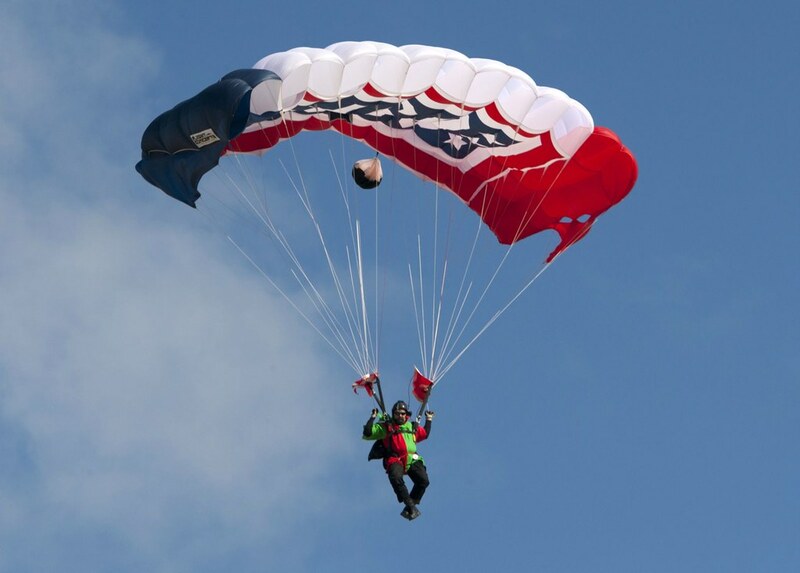 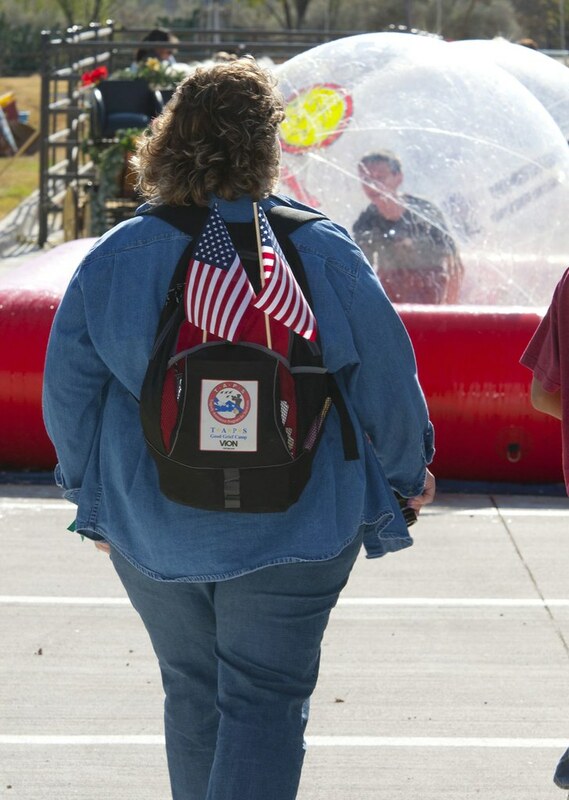 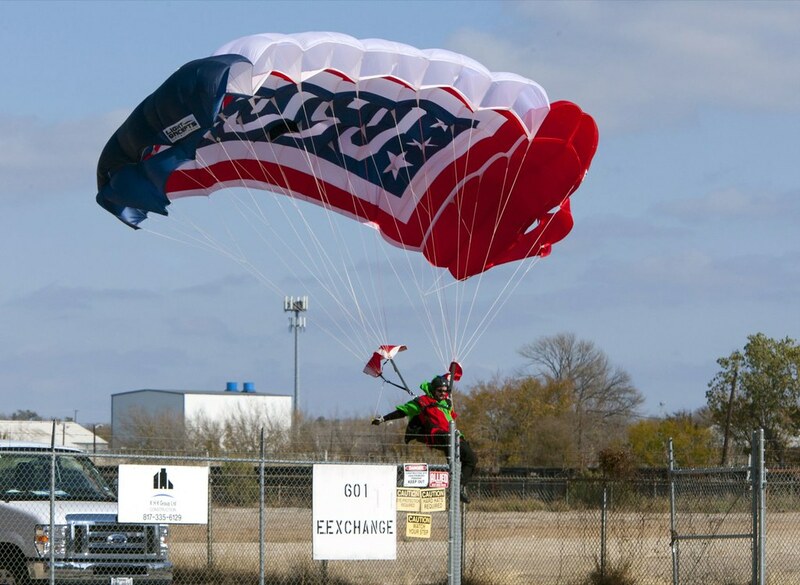 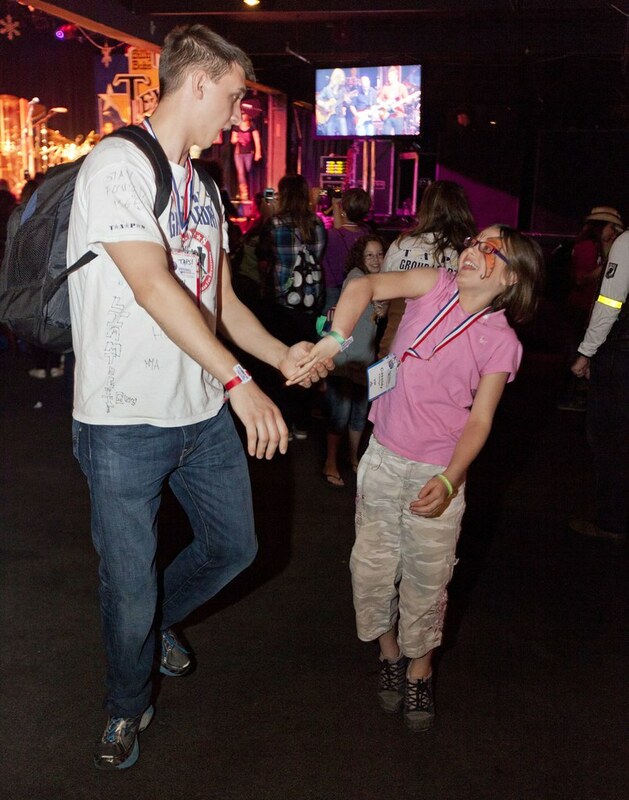 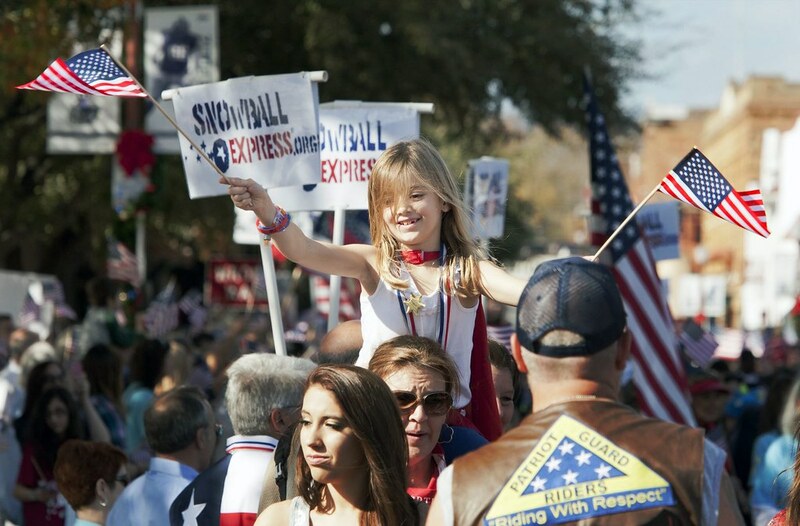 THE SNOWBALL EXPRESS MEETS COWTOWN!! 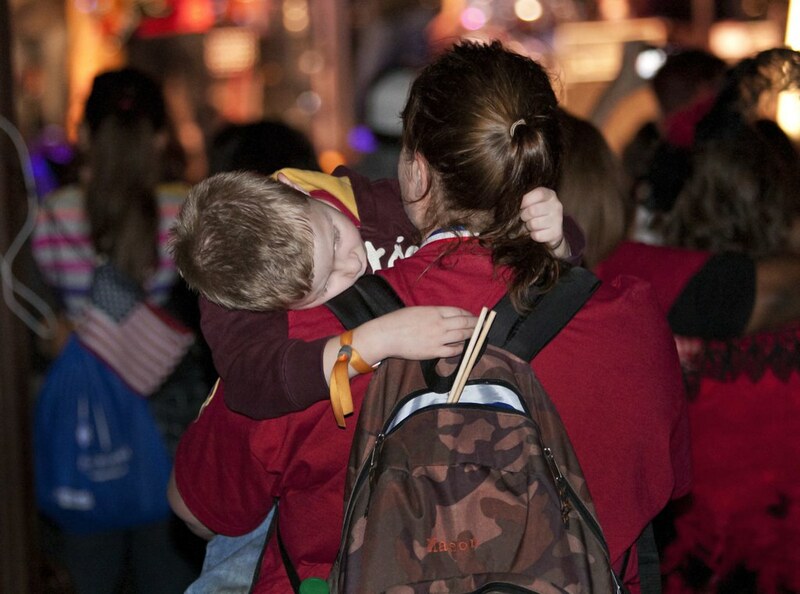 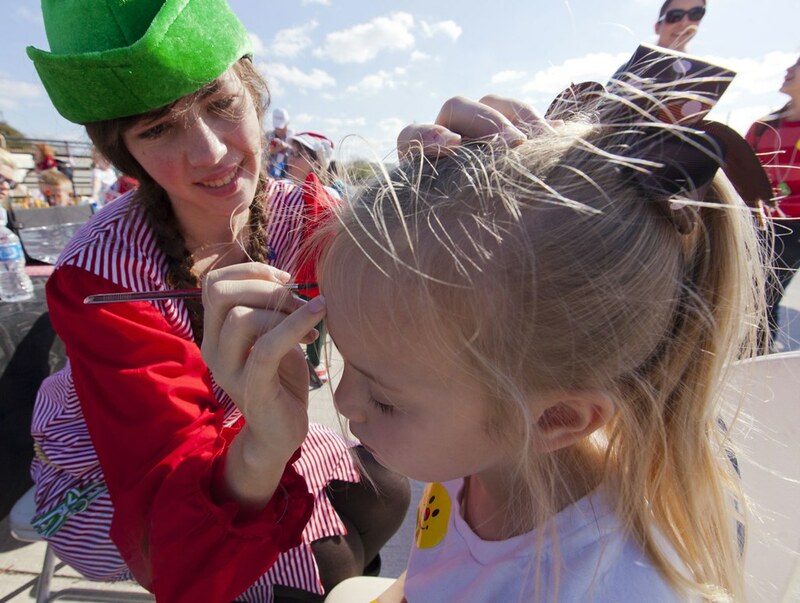 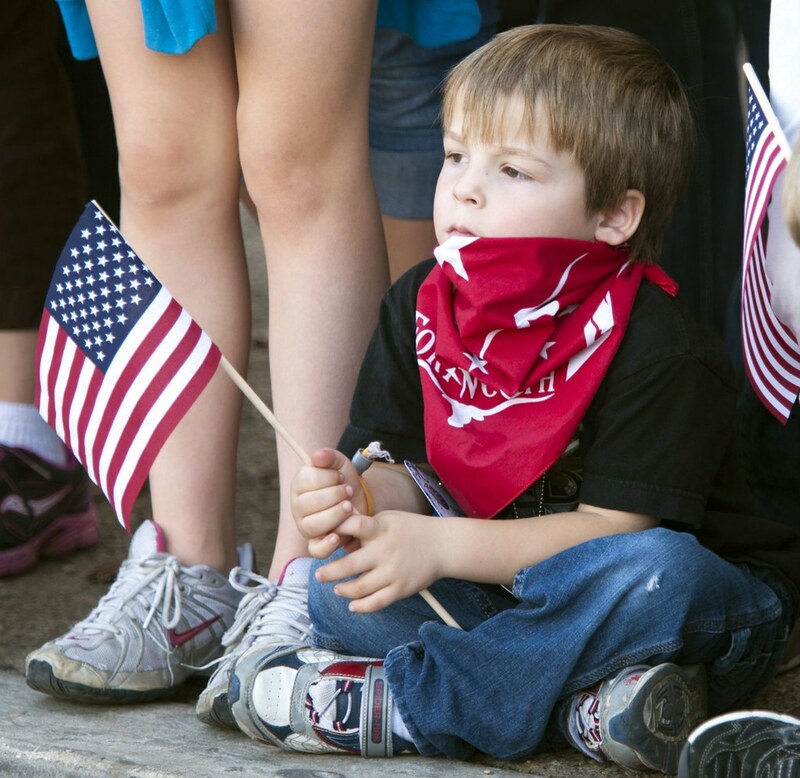 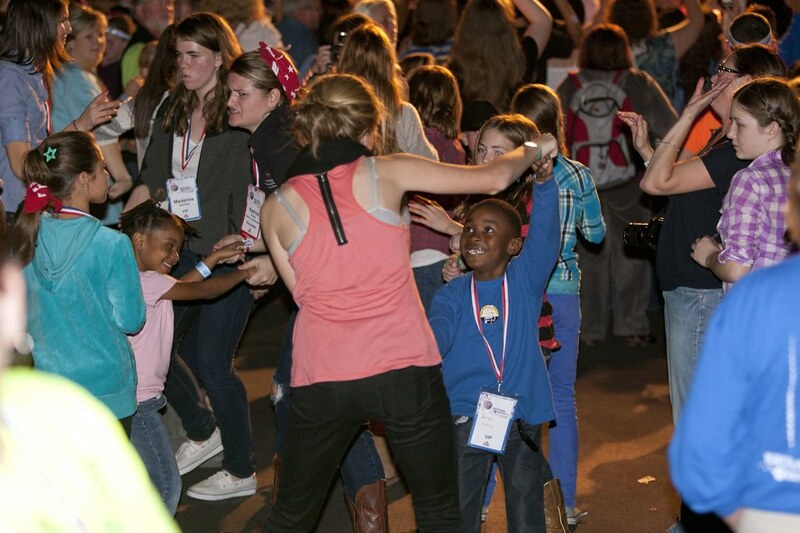 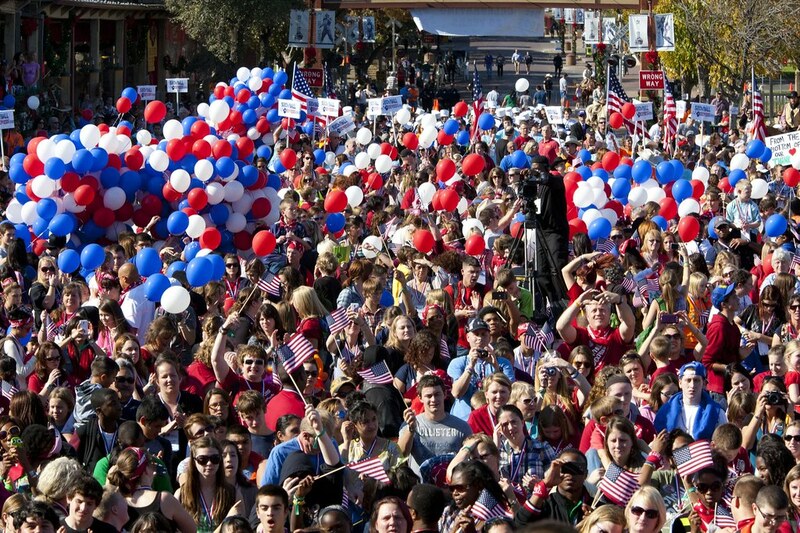 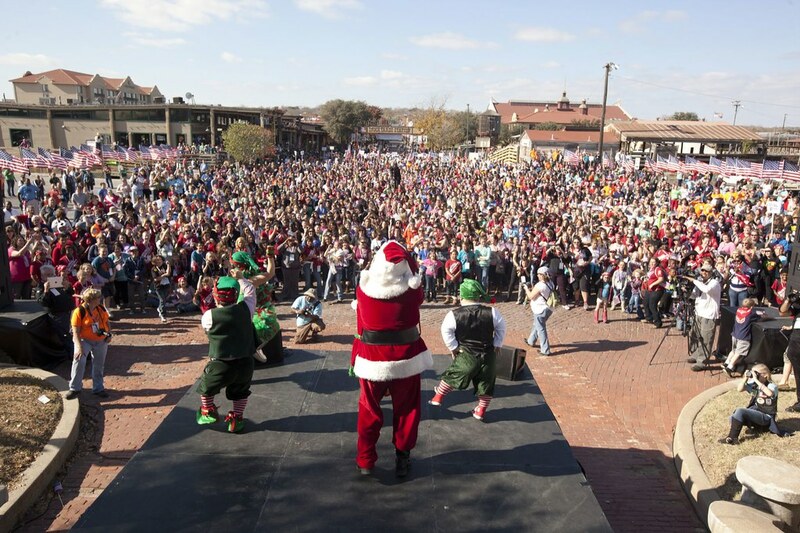 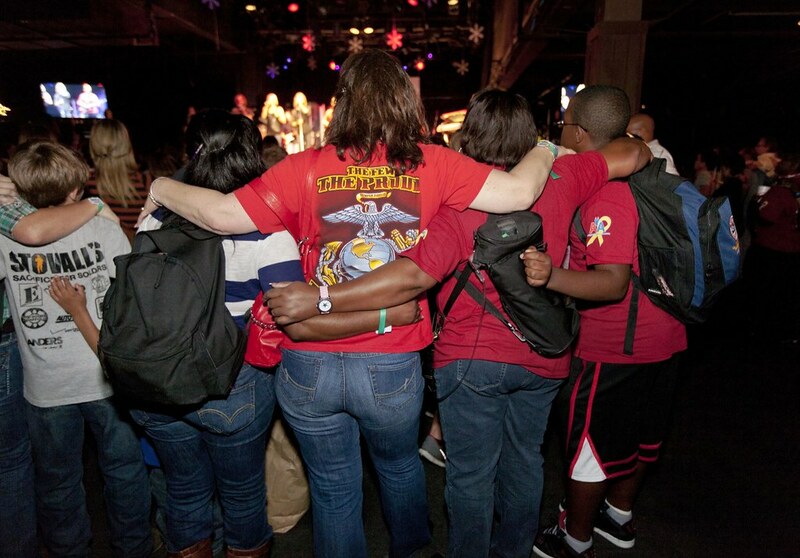 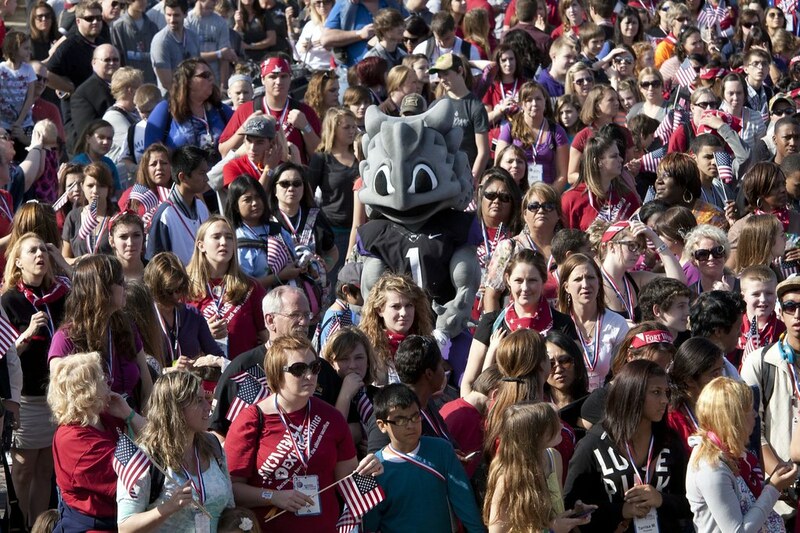 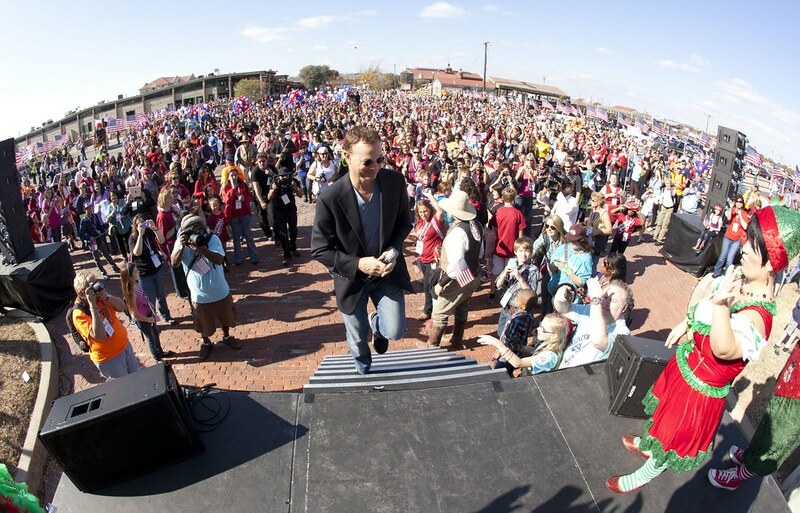 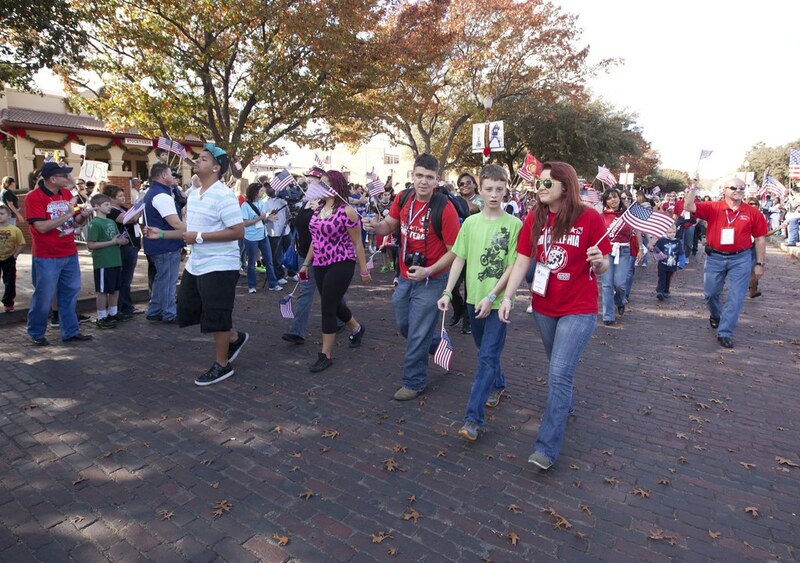 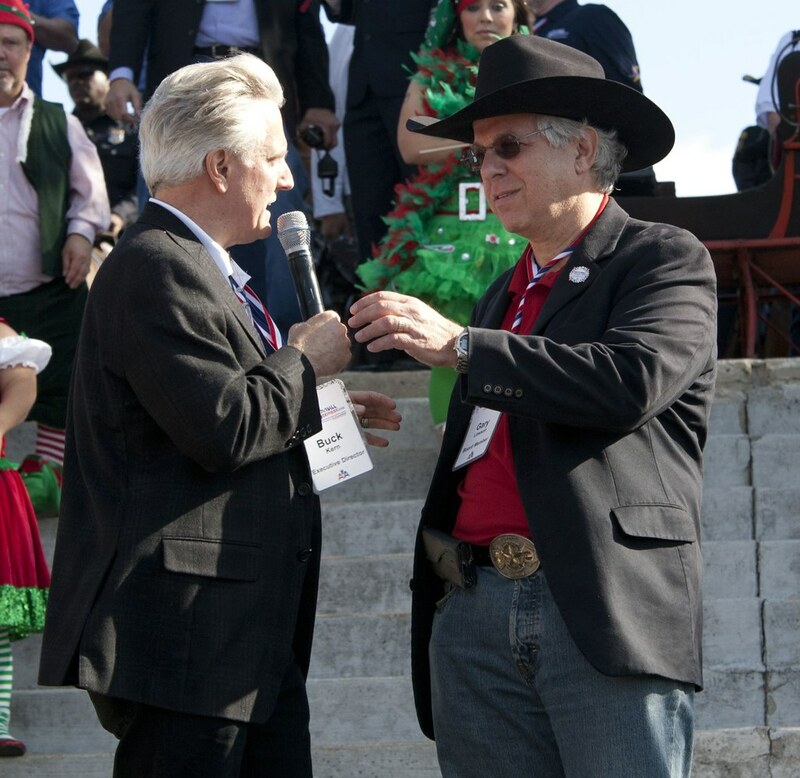 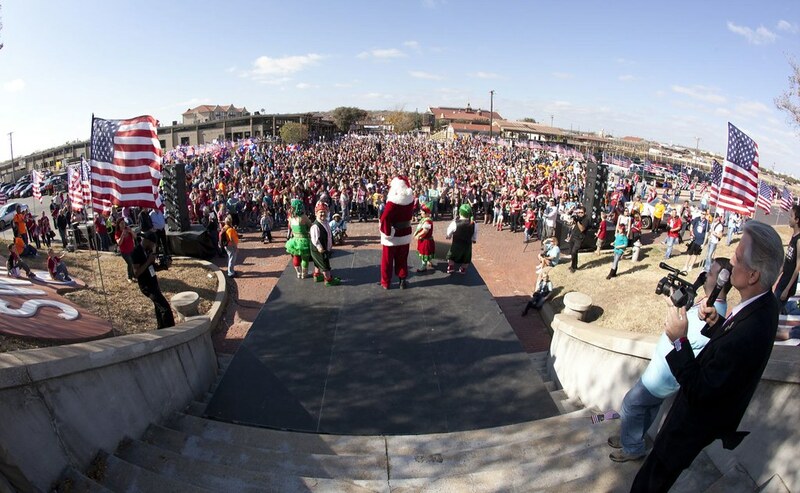 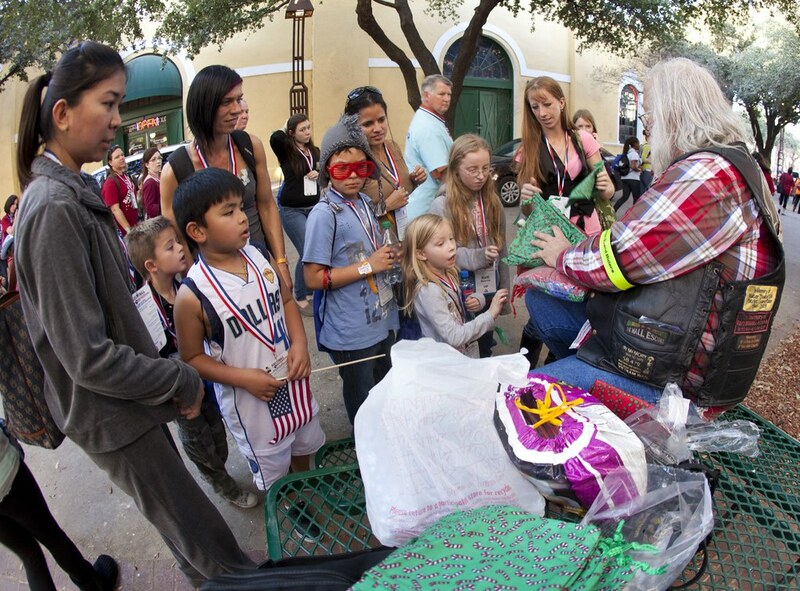 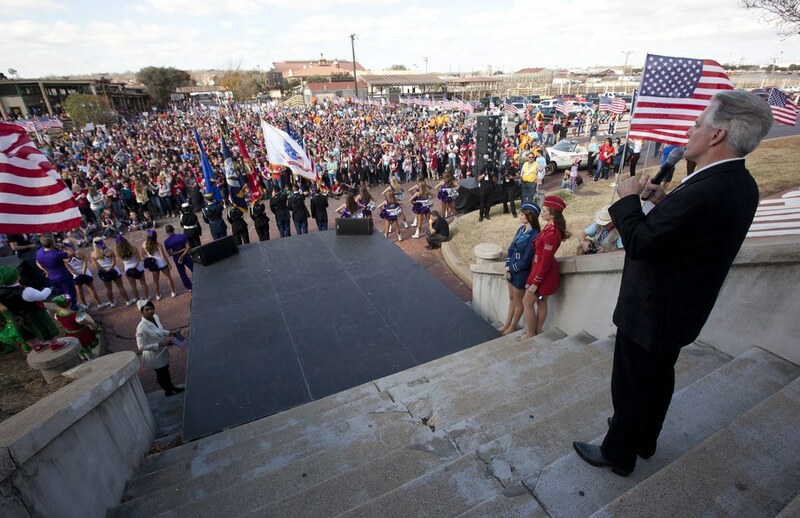 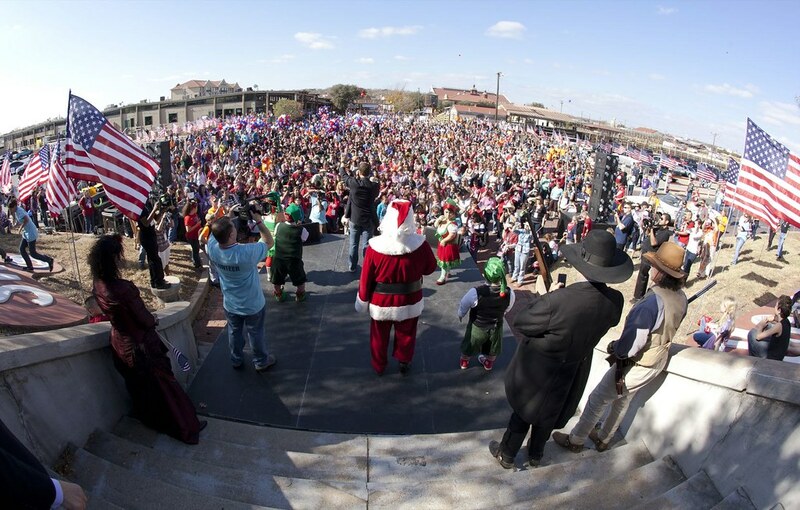 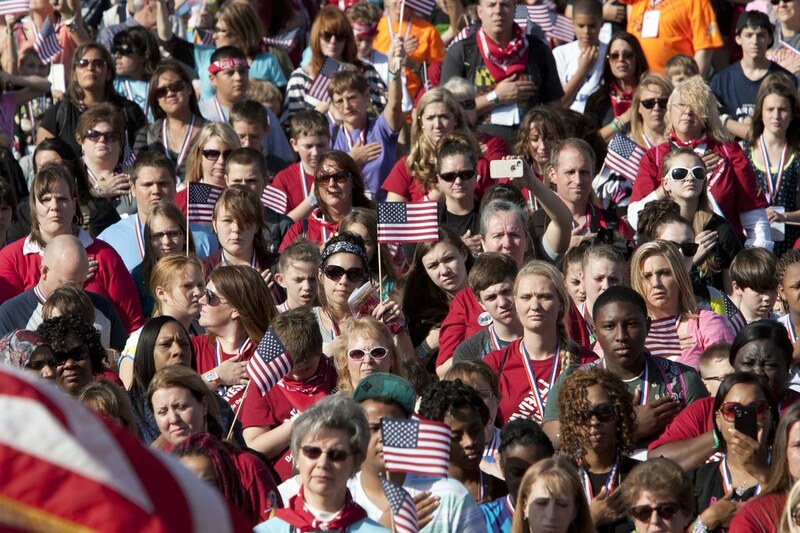 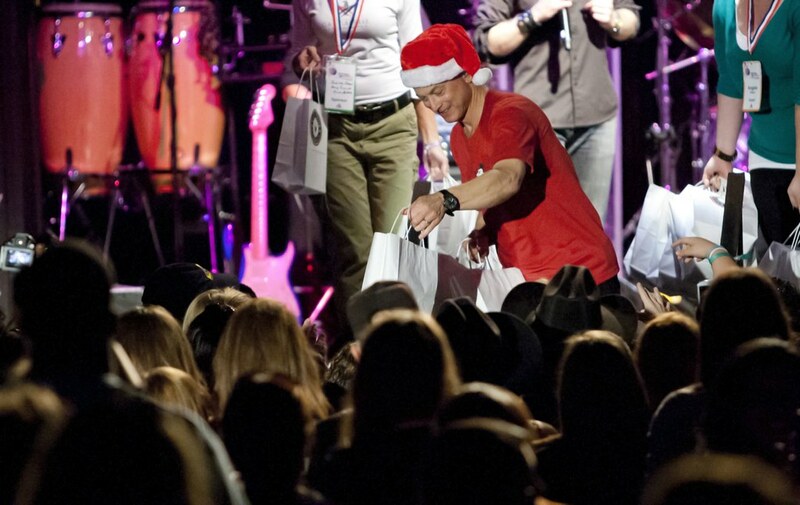 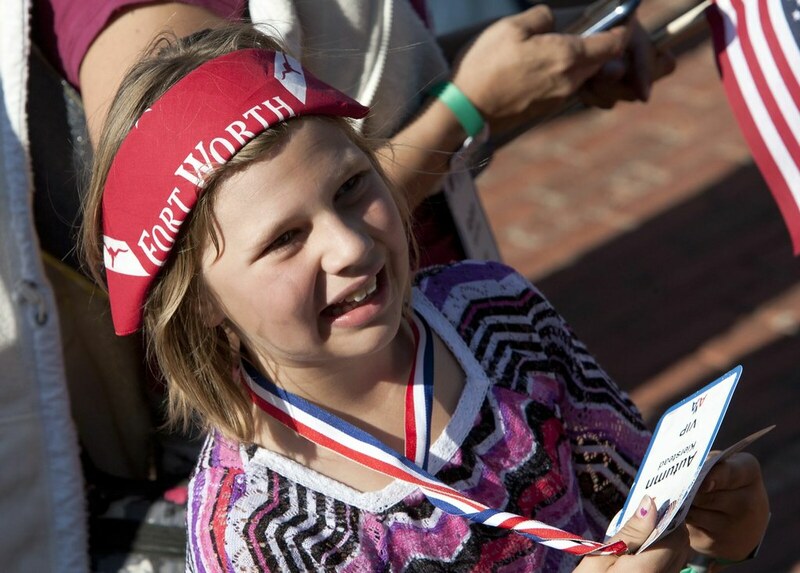 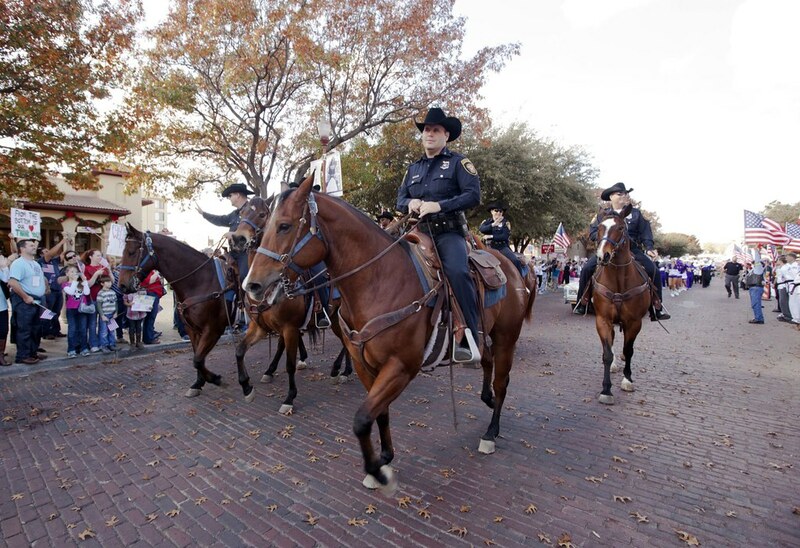 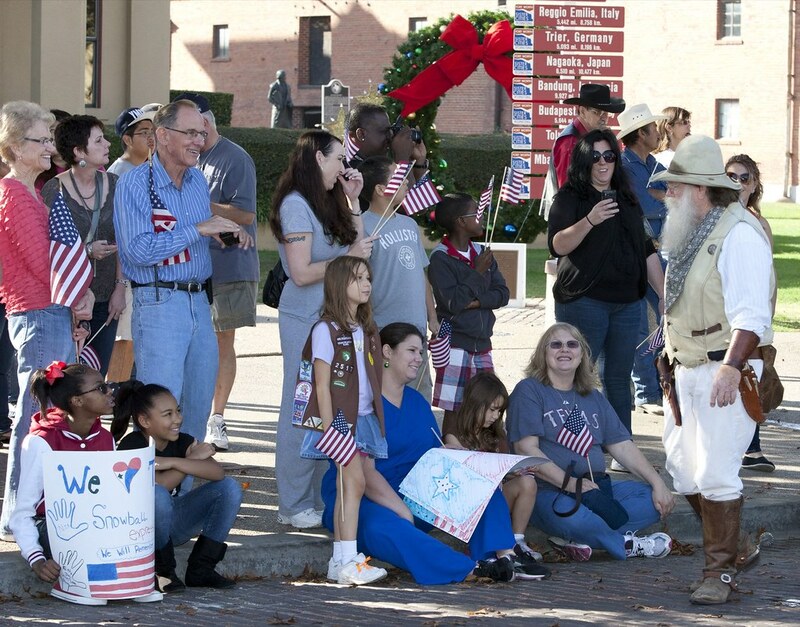 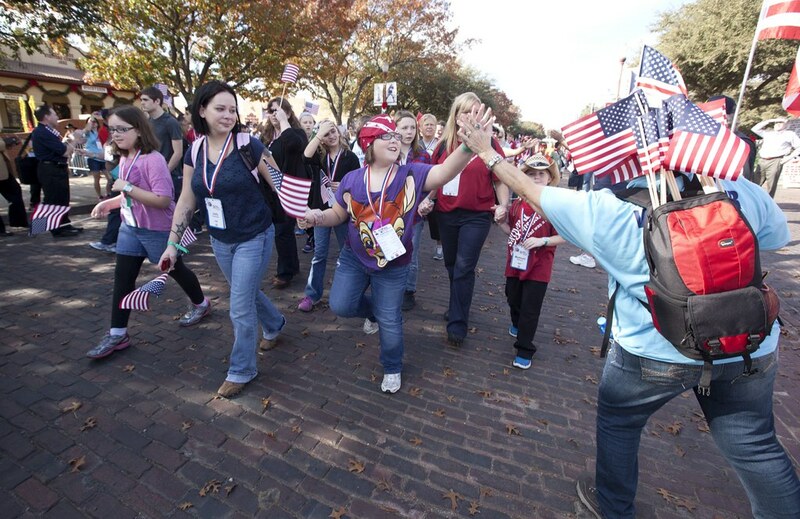 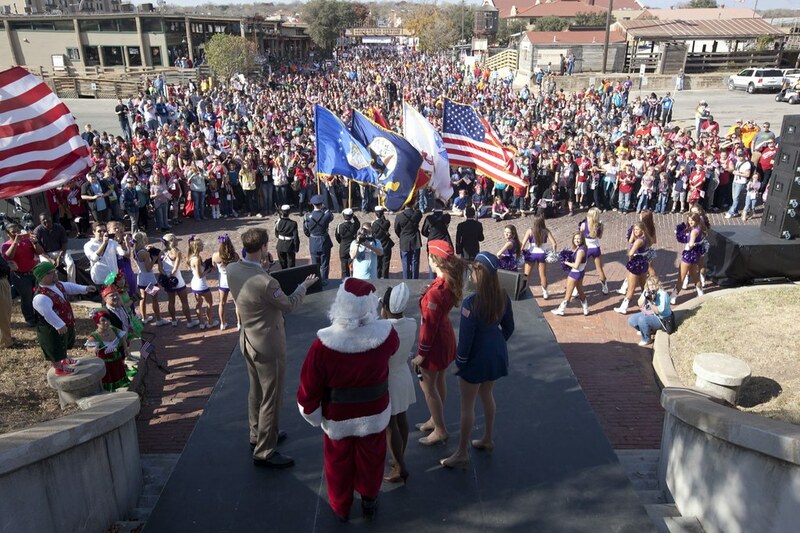 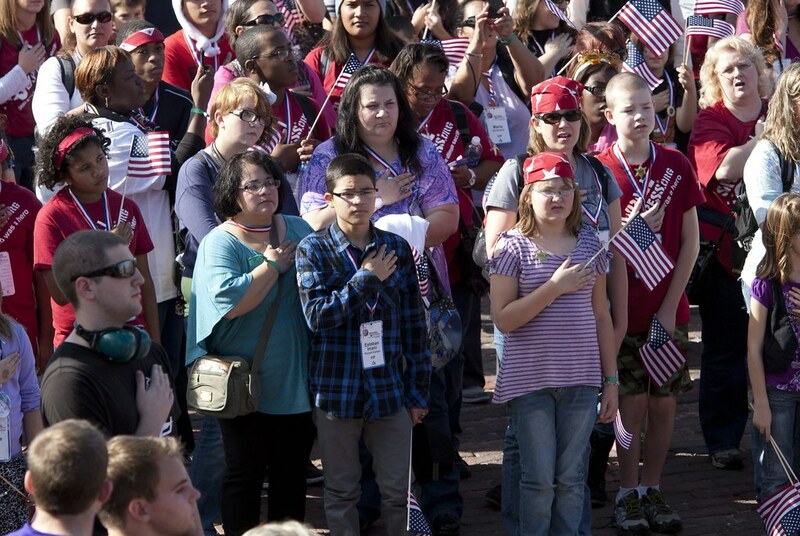 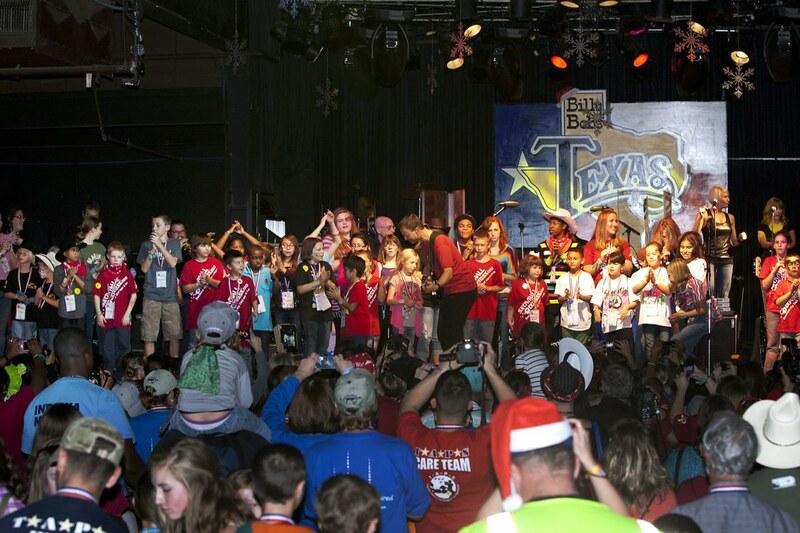 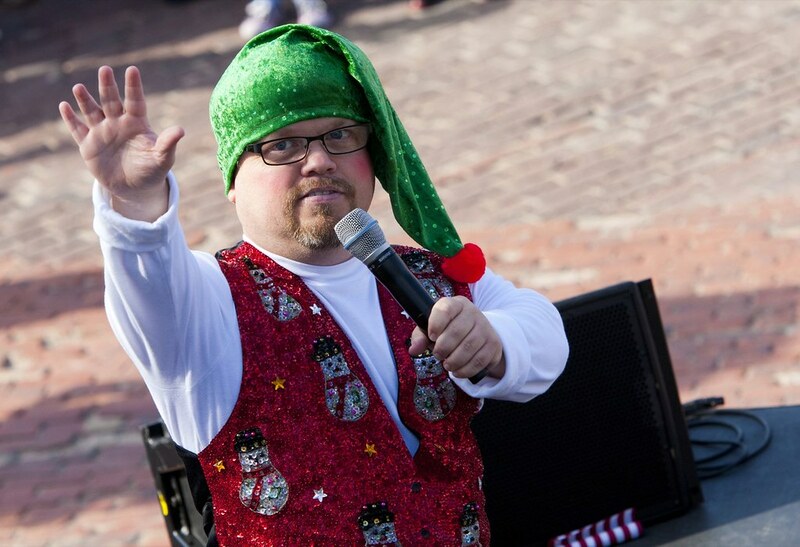 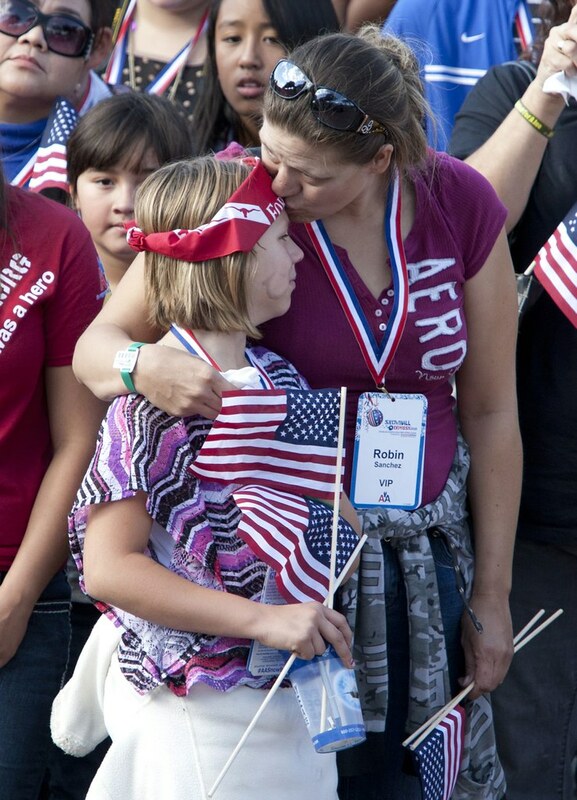 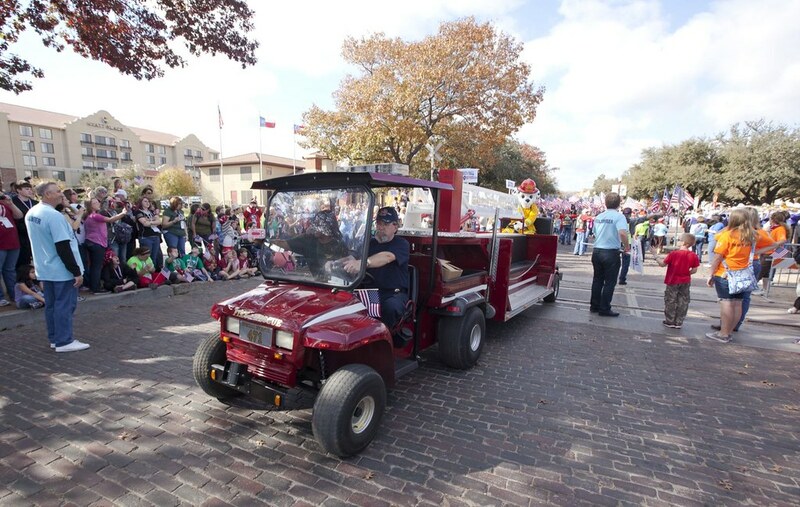 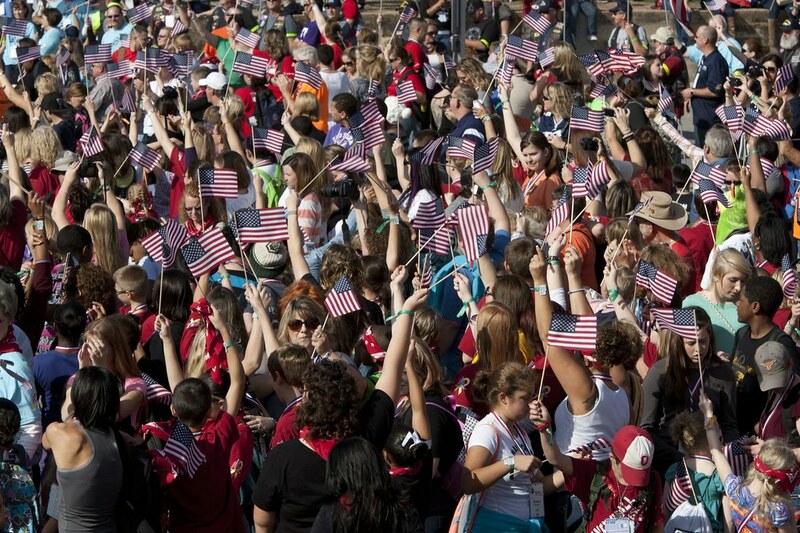 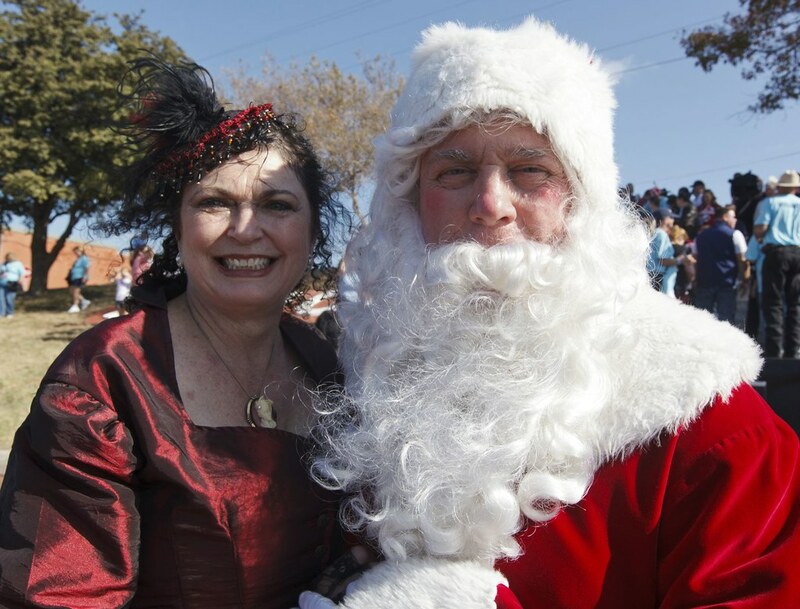 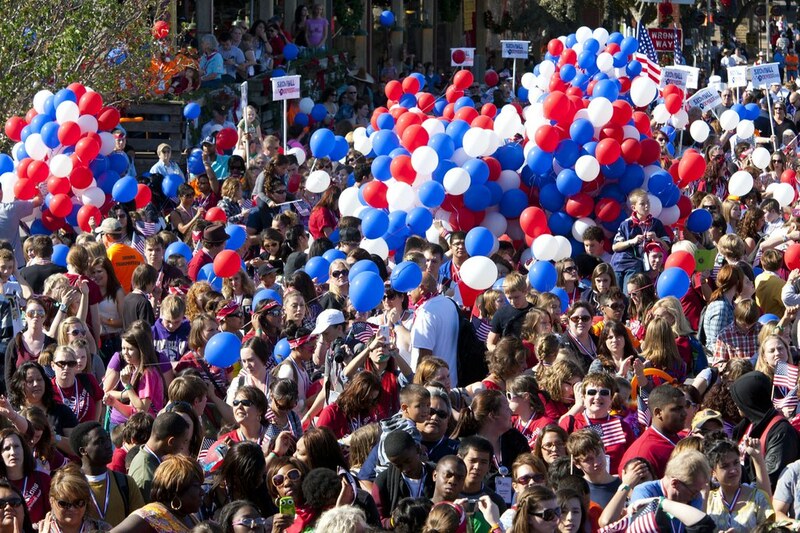 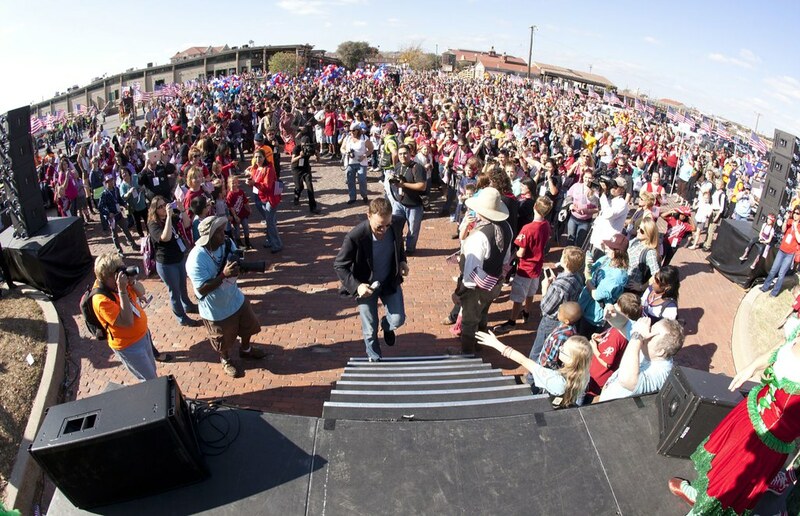 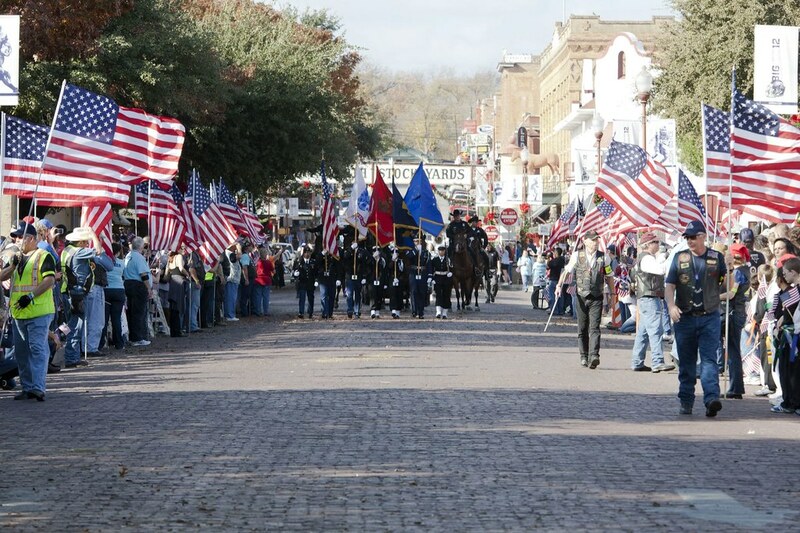 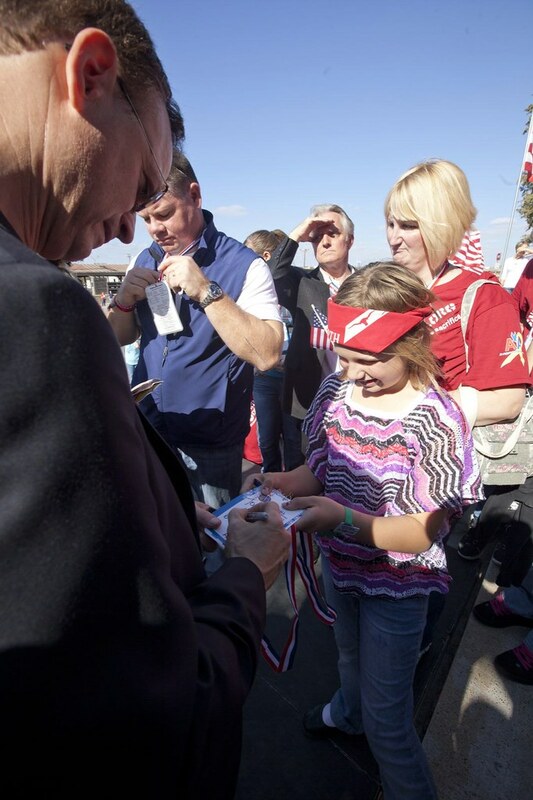 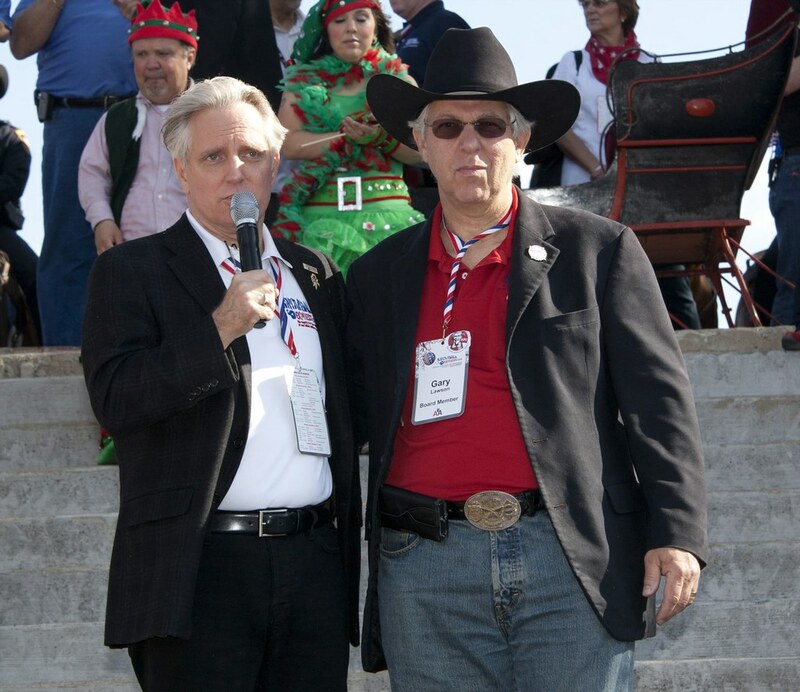 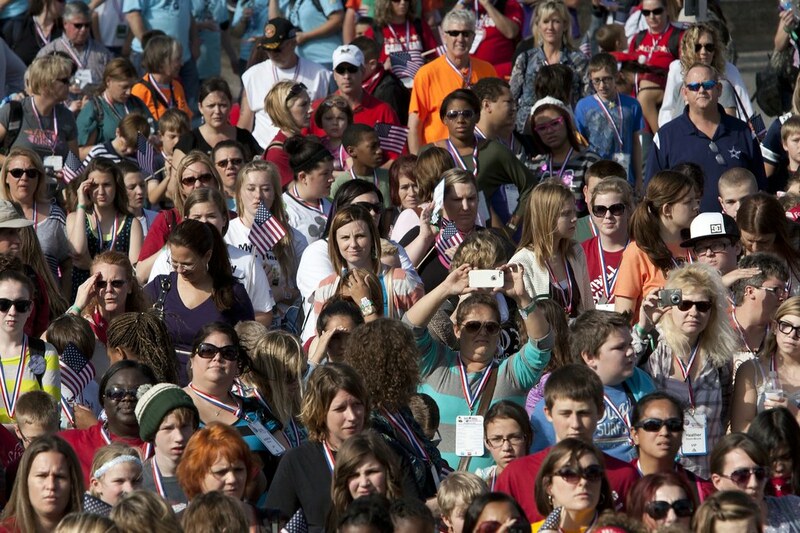 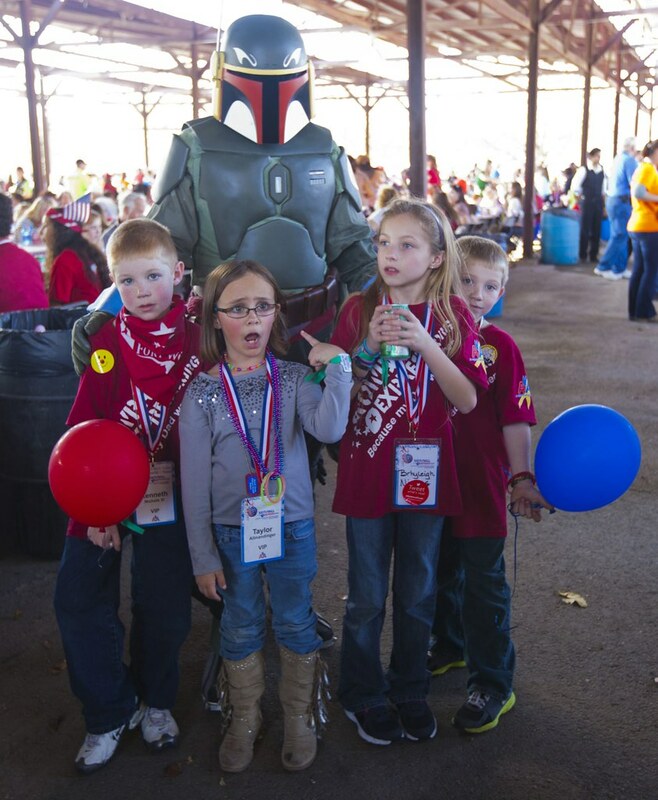 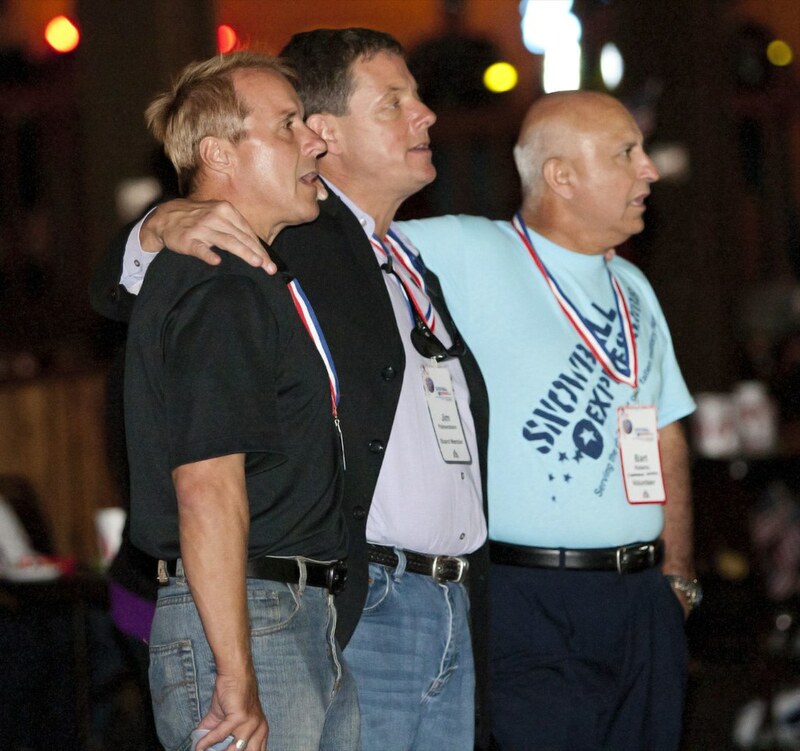 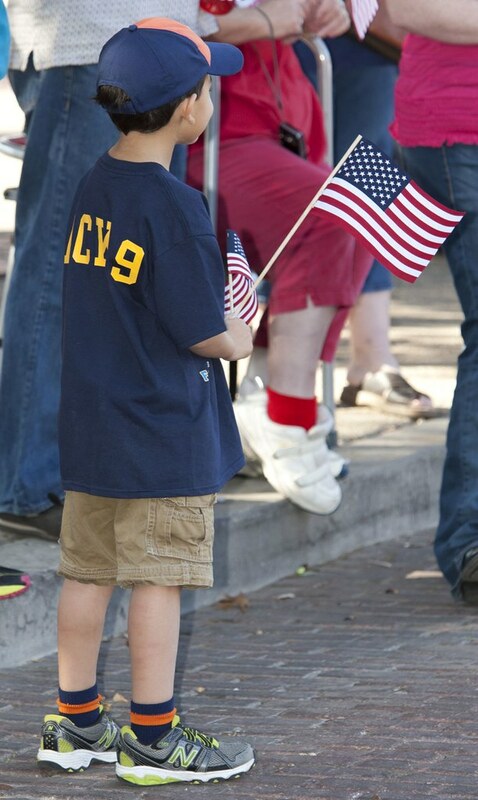 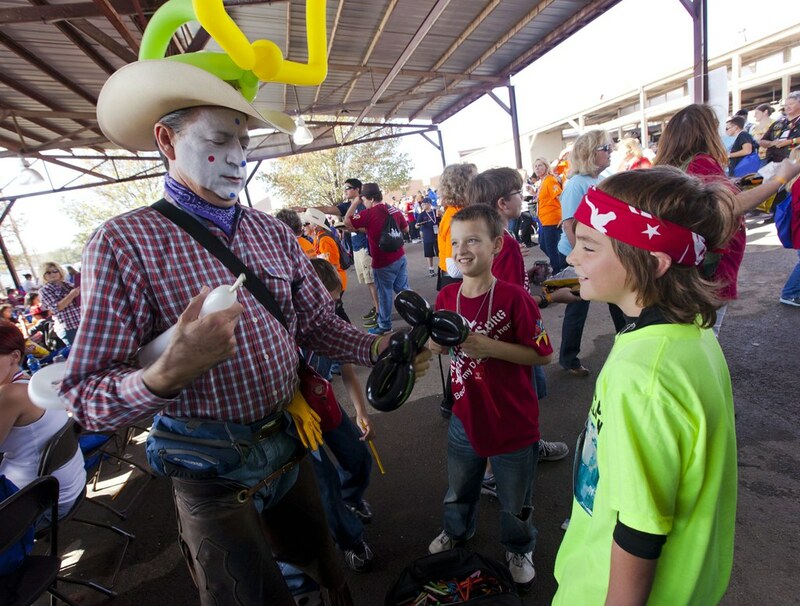 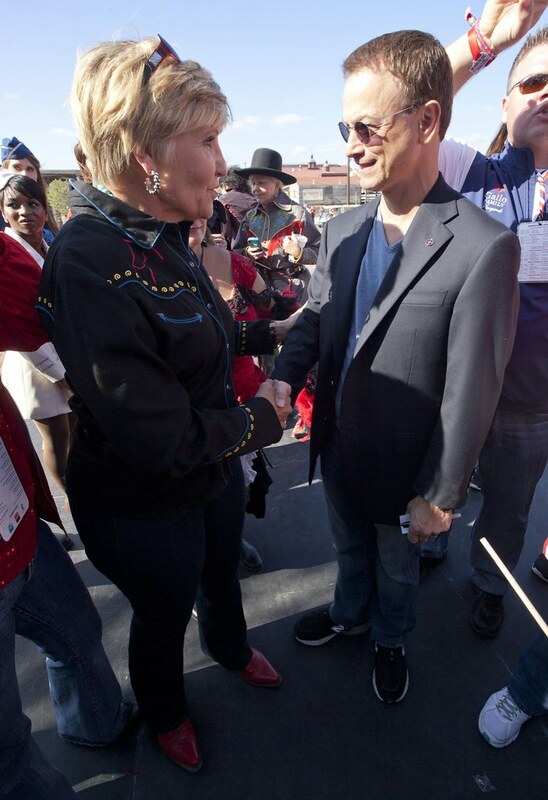 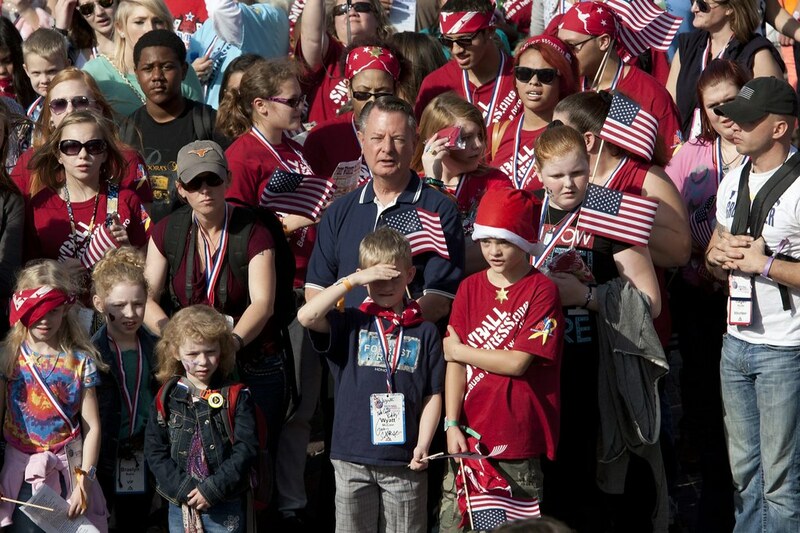 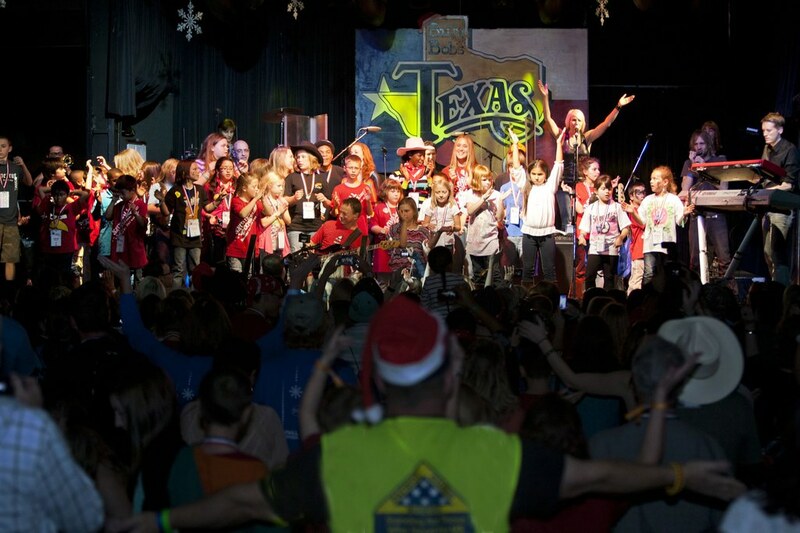 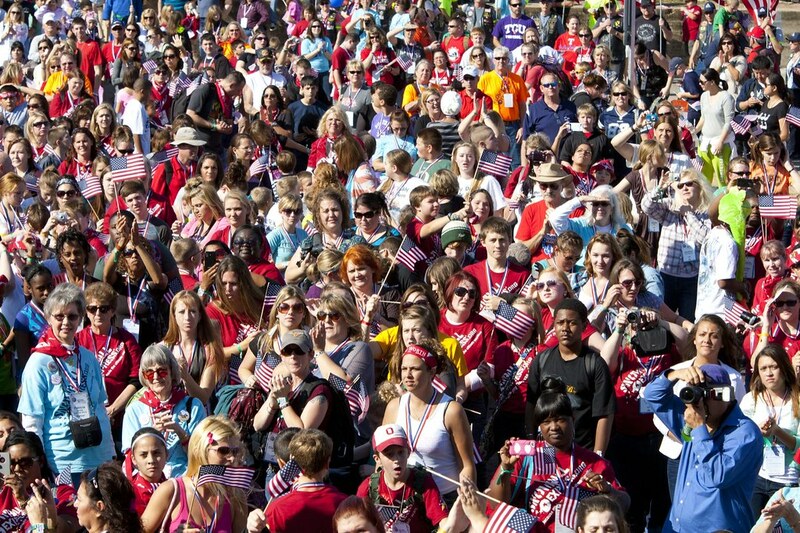 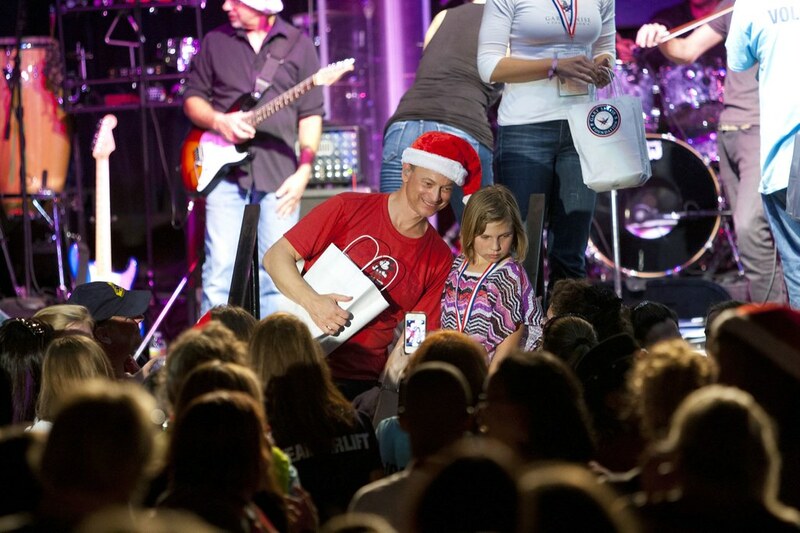 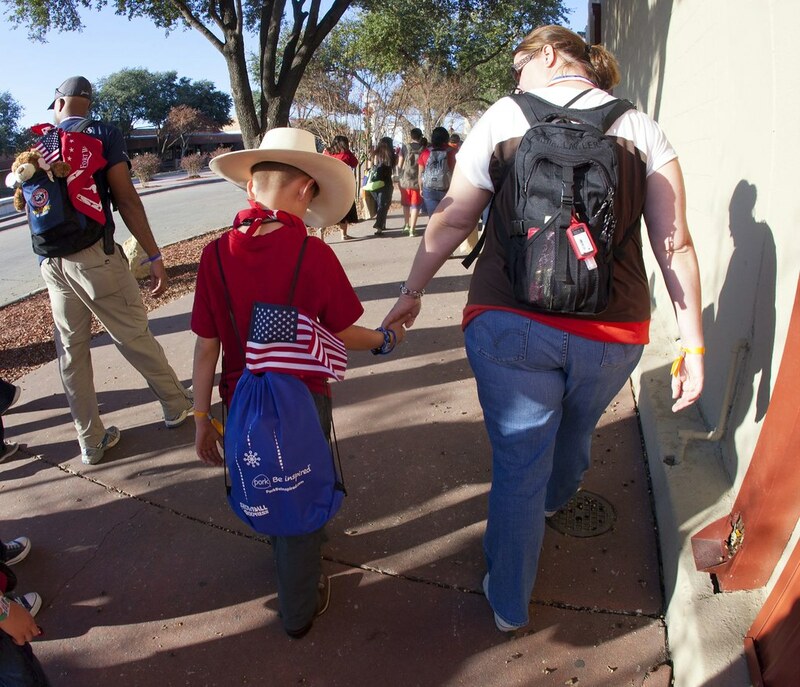 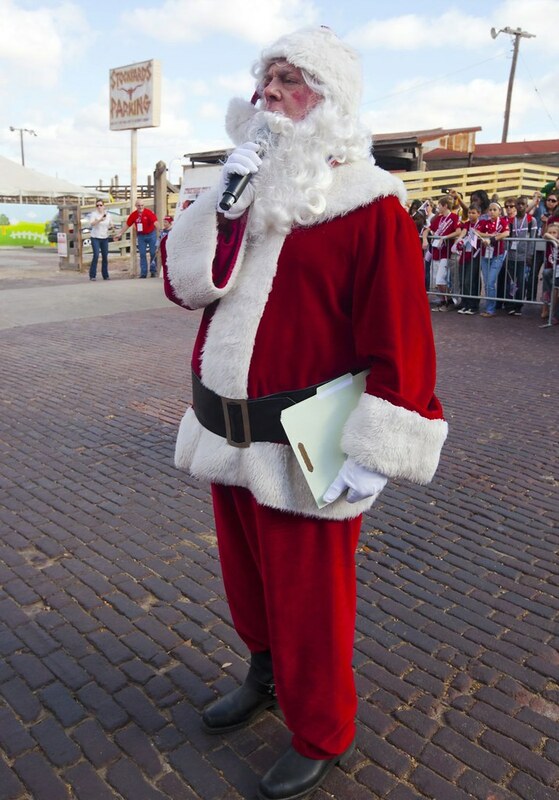 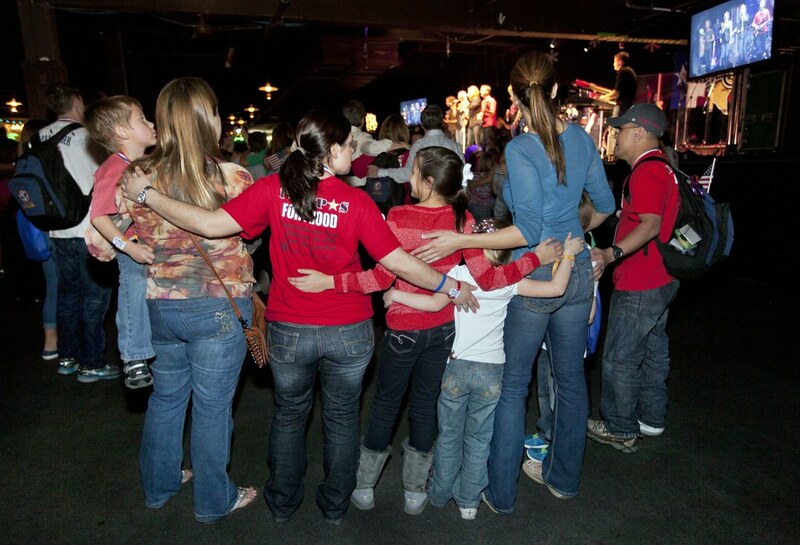 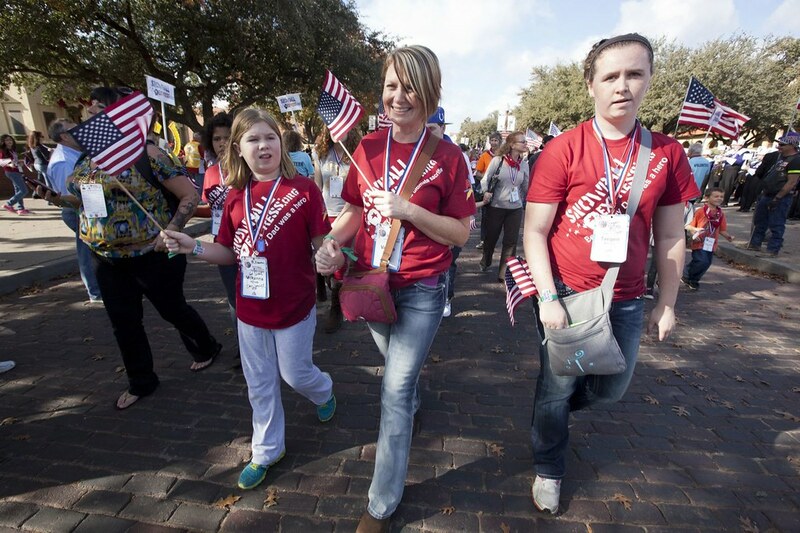 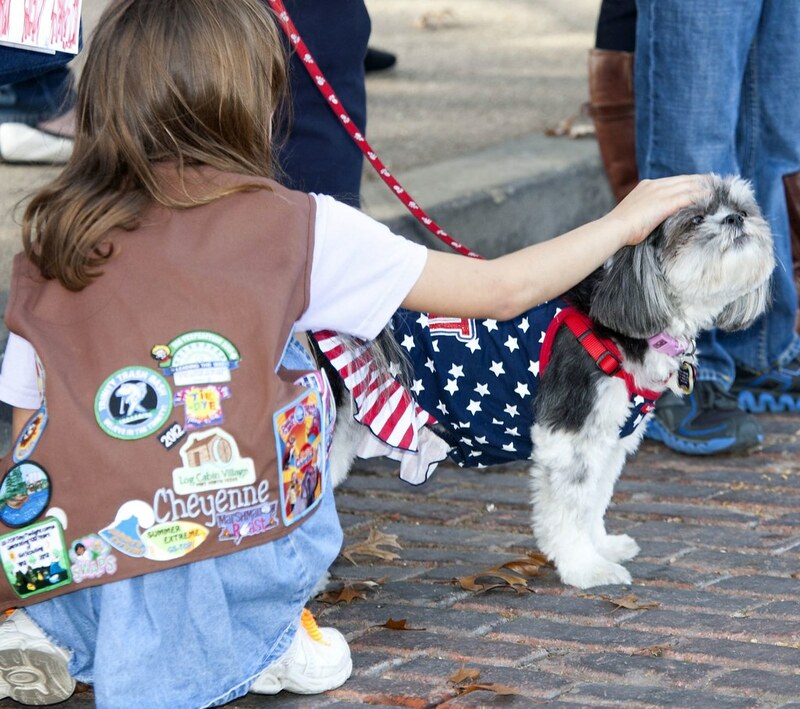 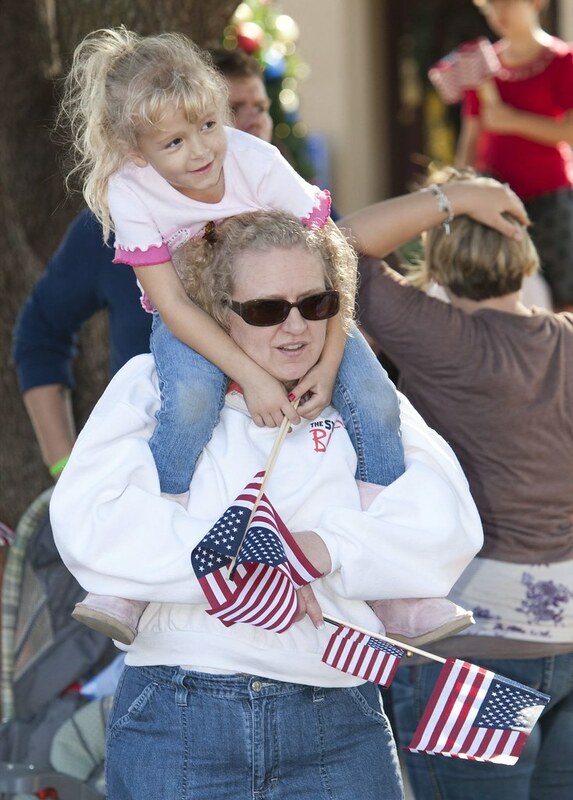 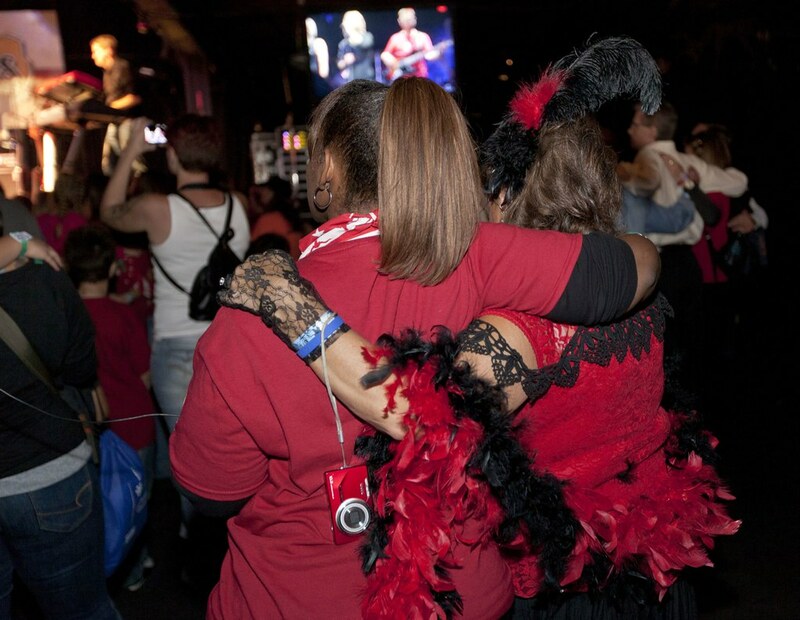 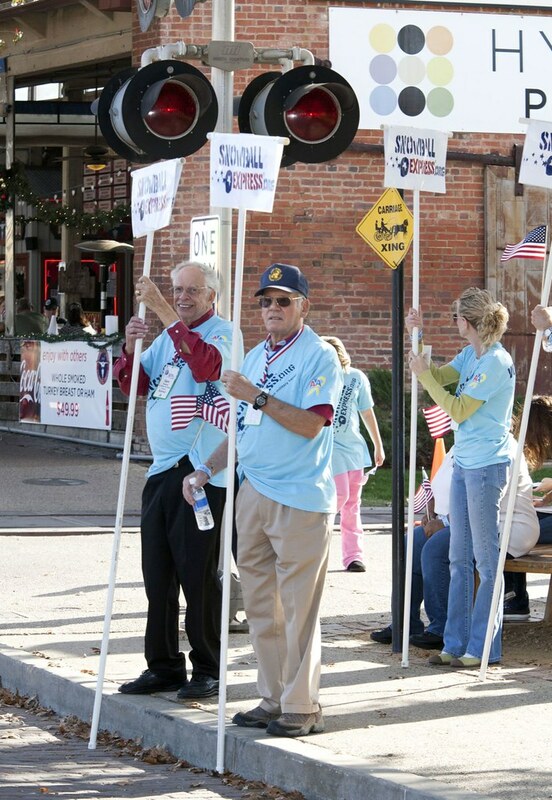 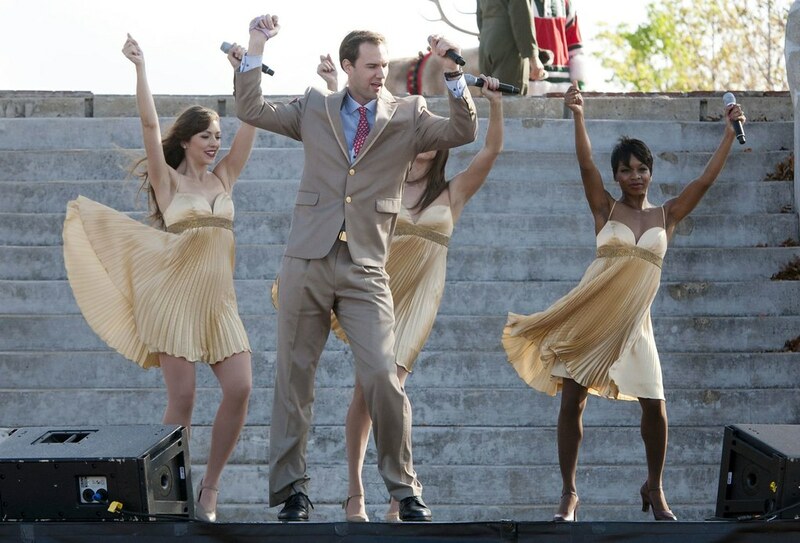 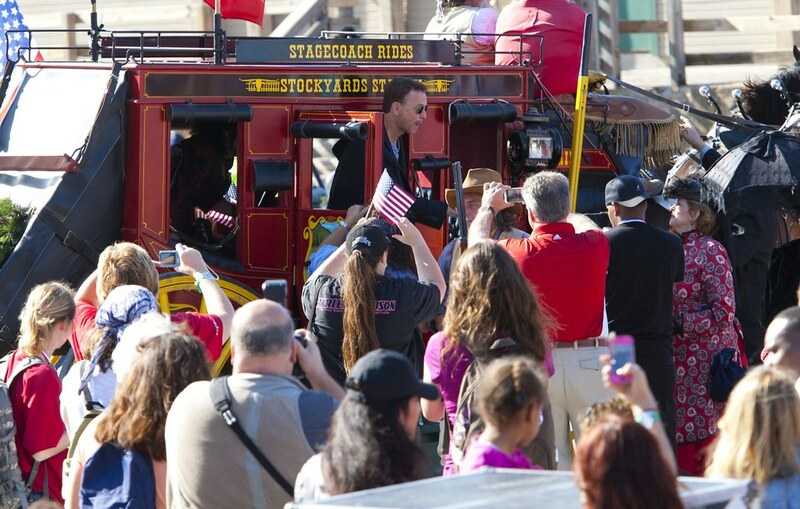 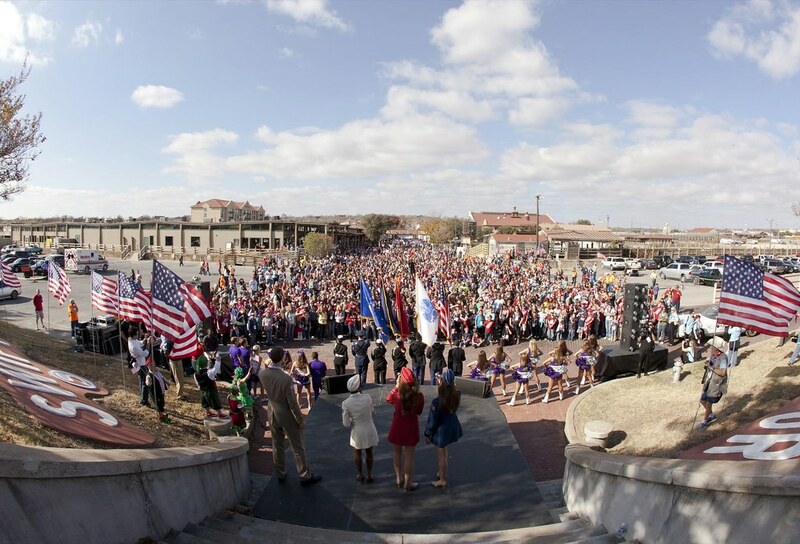 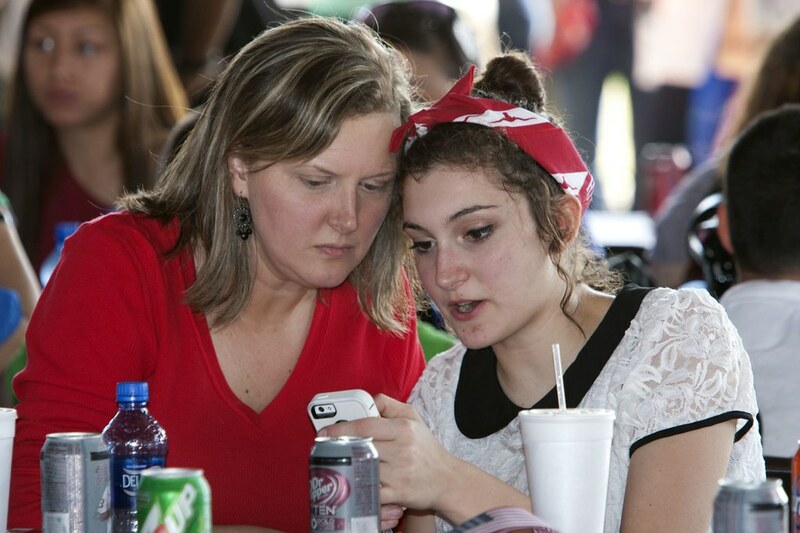 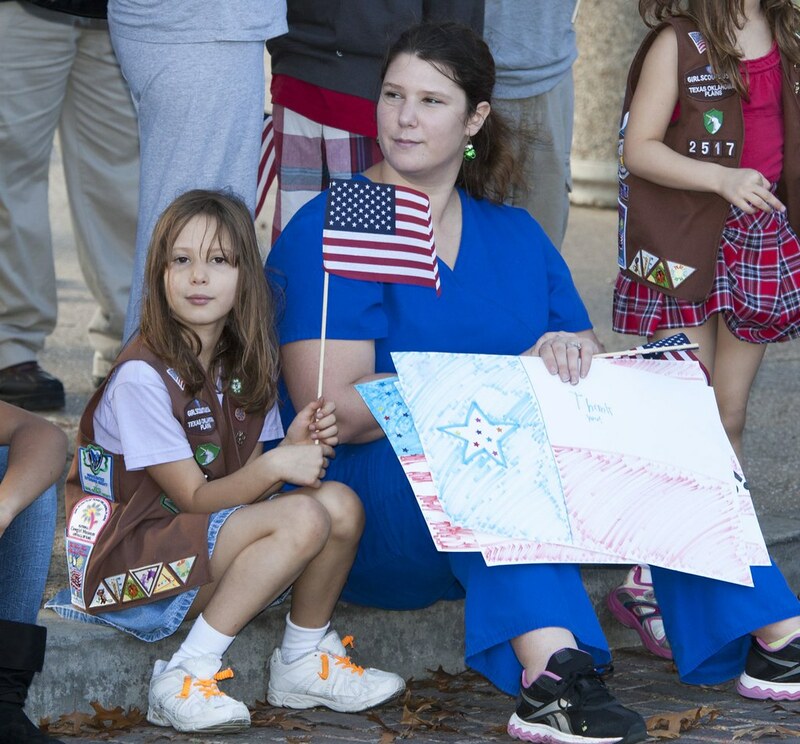 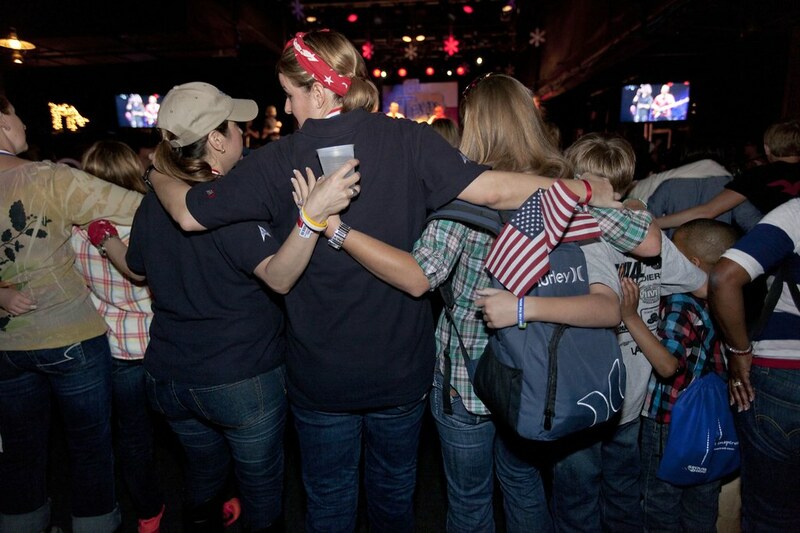 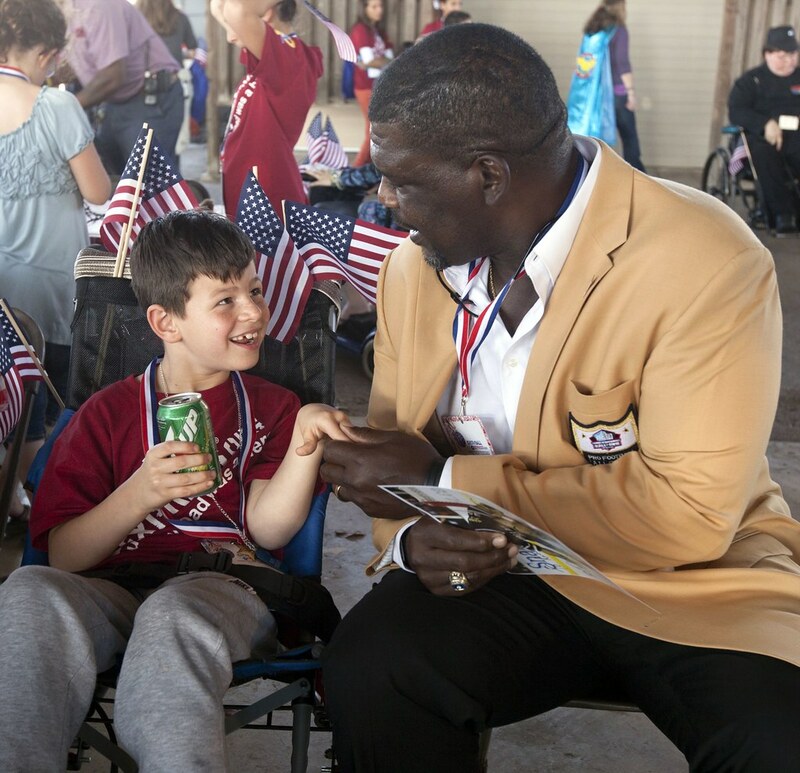 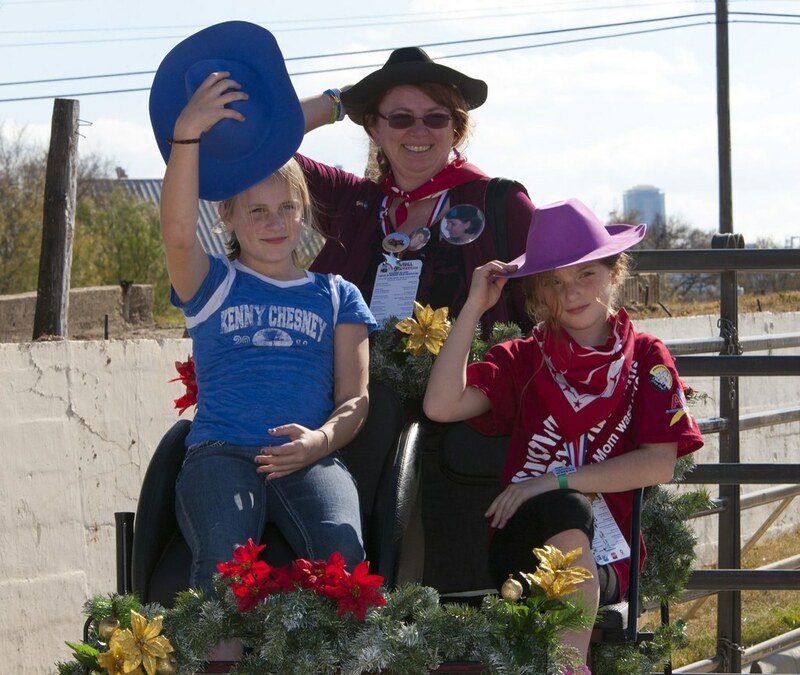 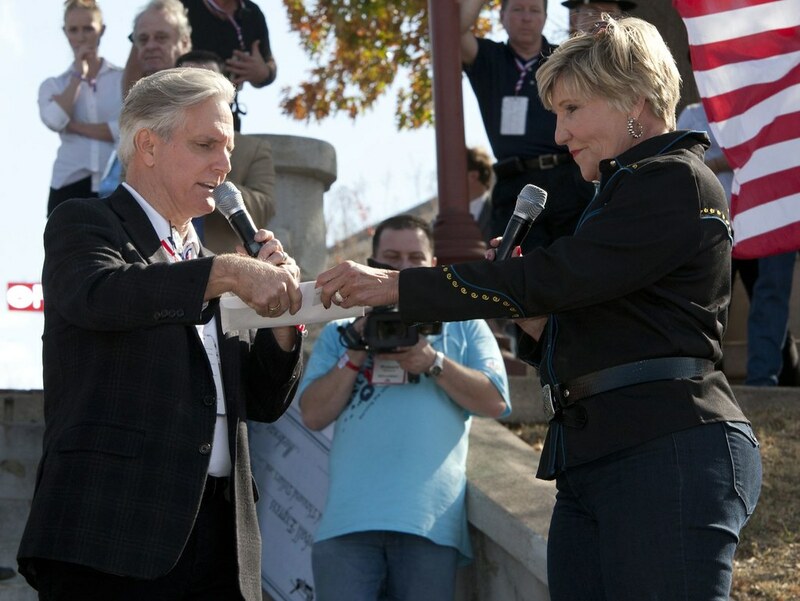 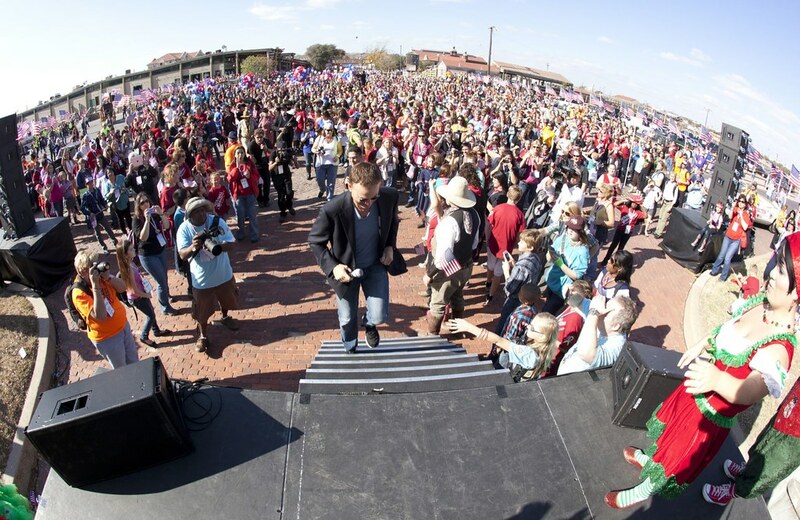 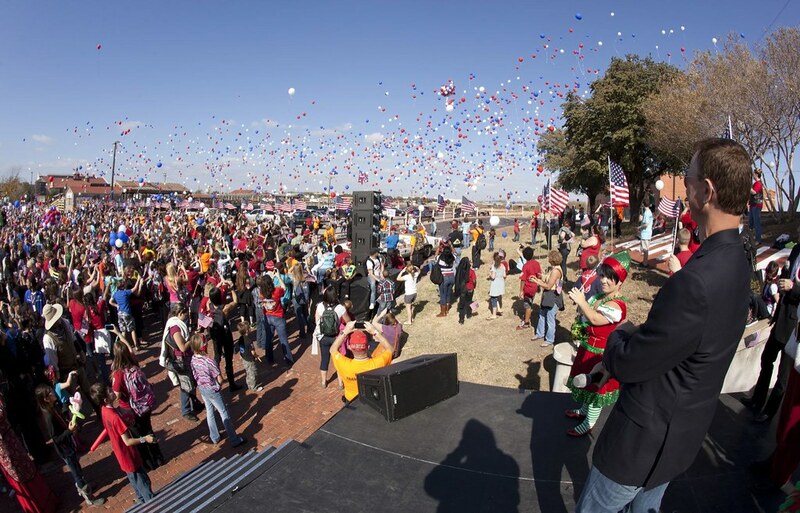 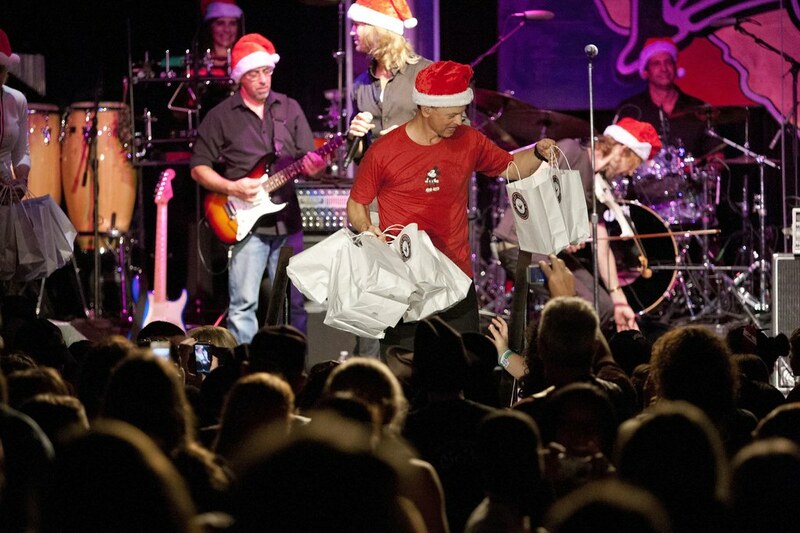 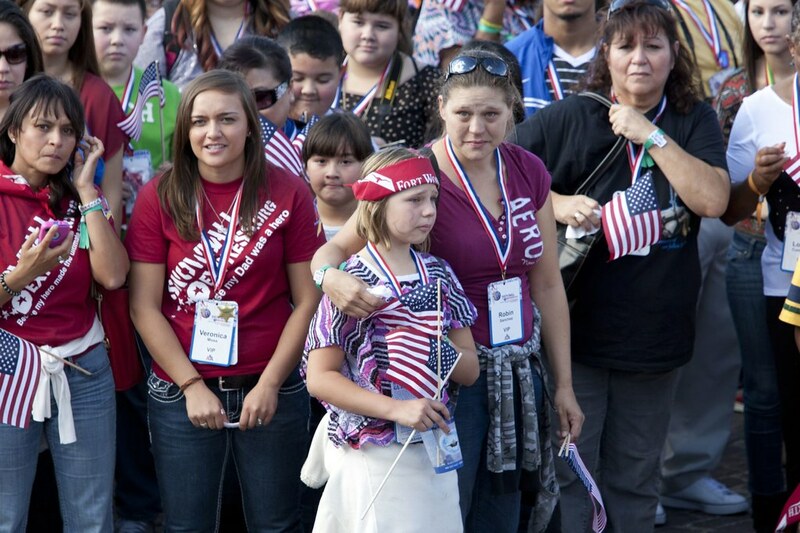 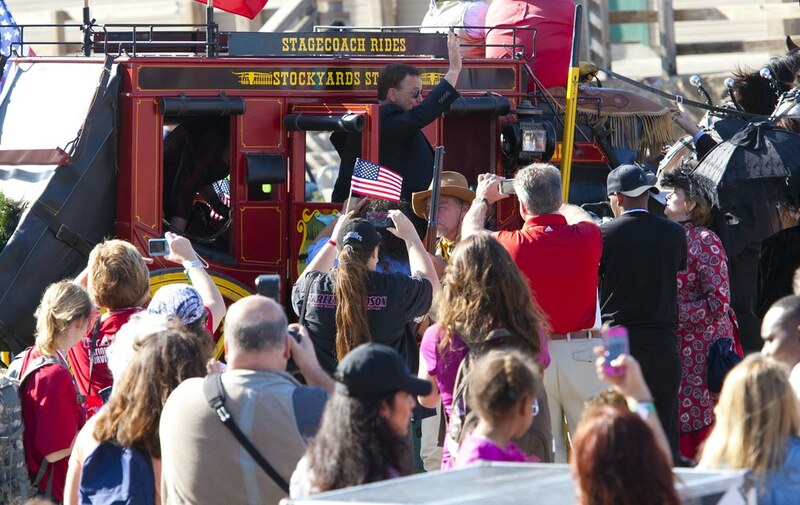 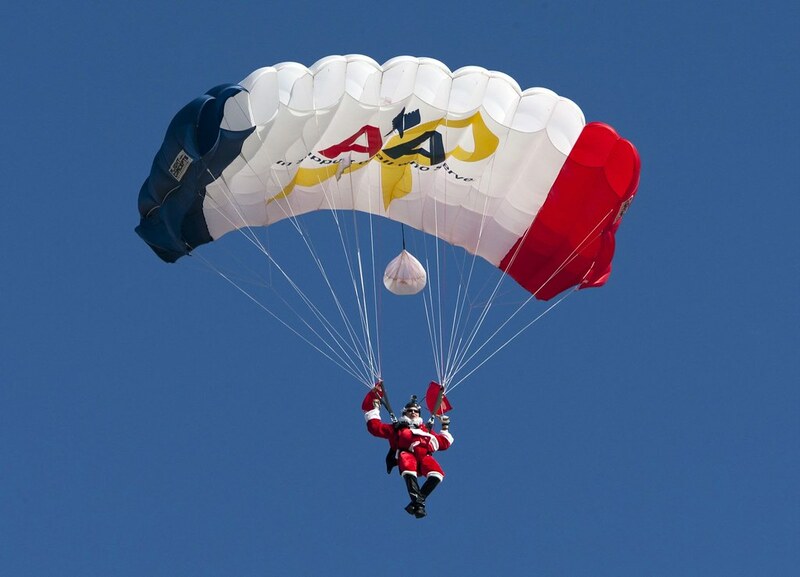 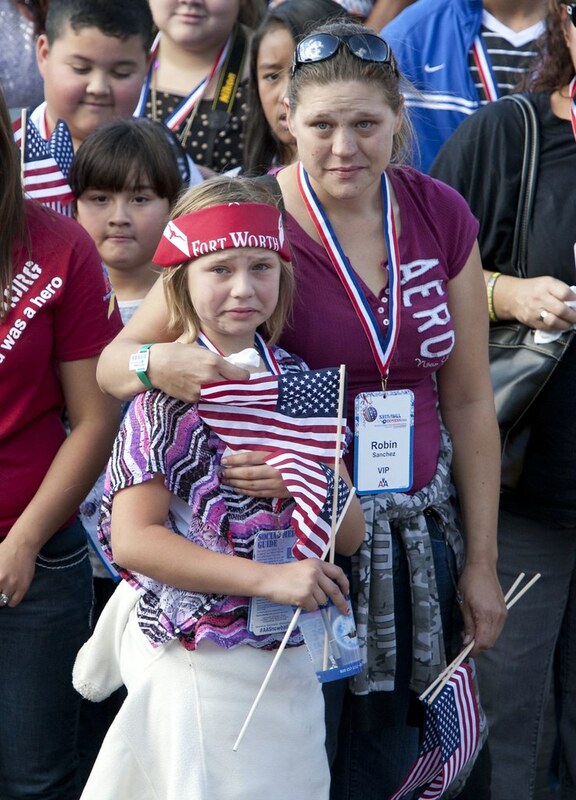 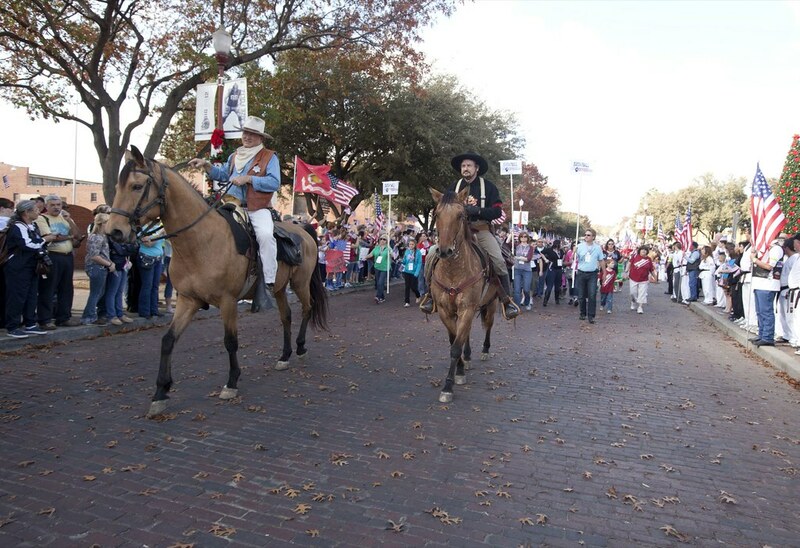 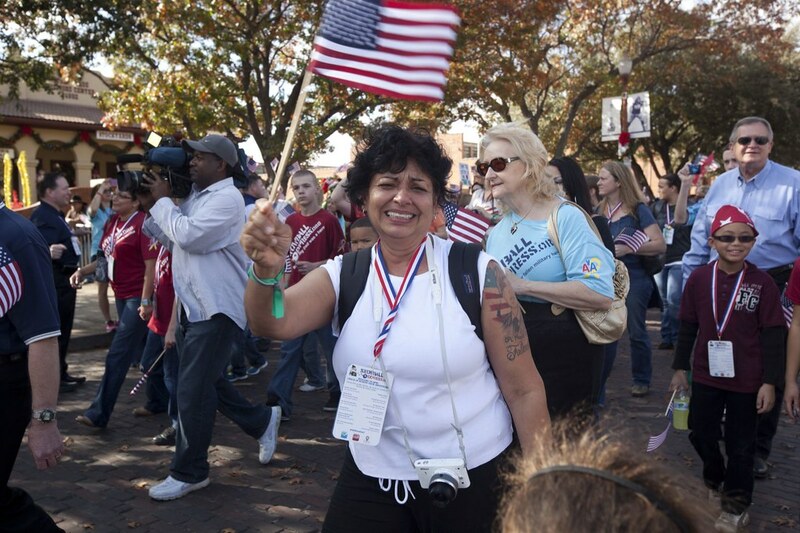 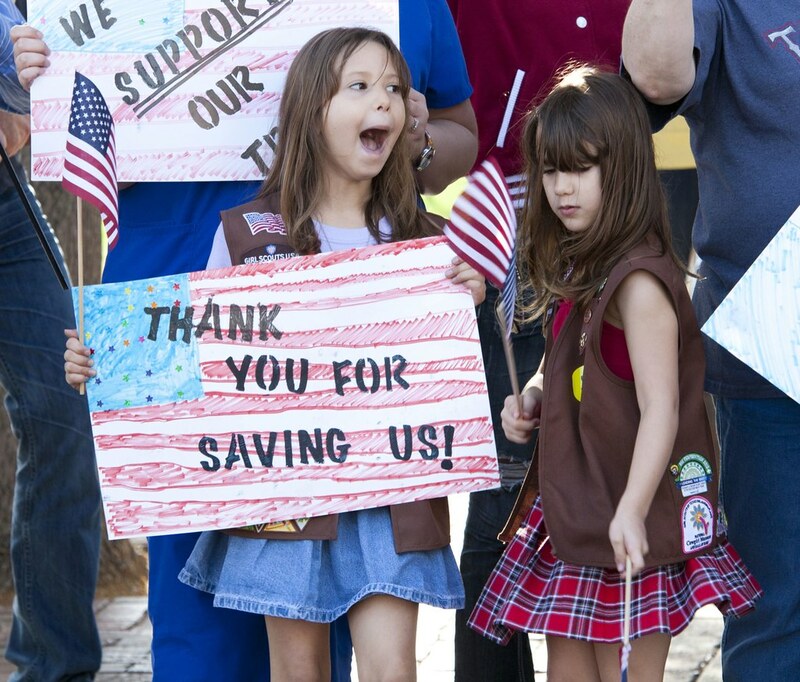 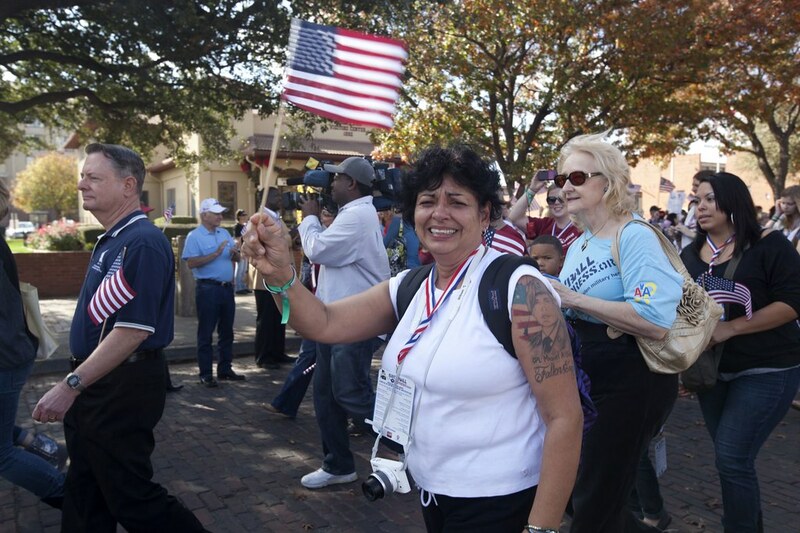 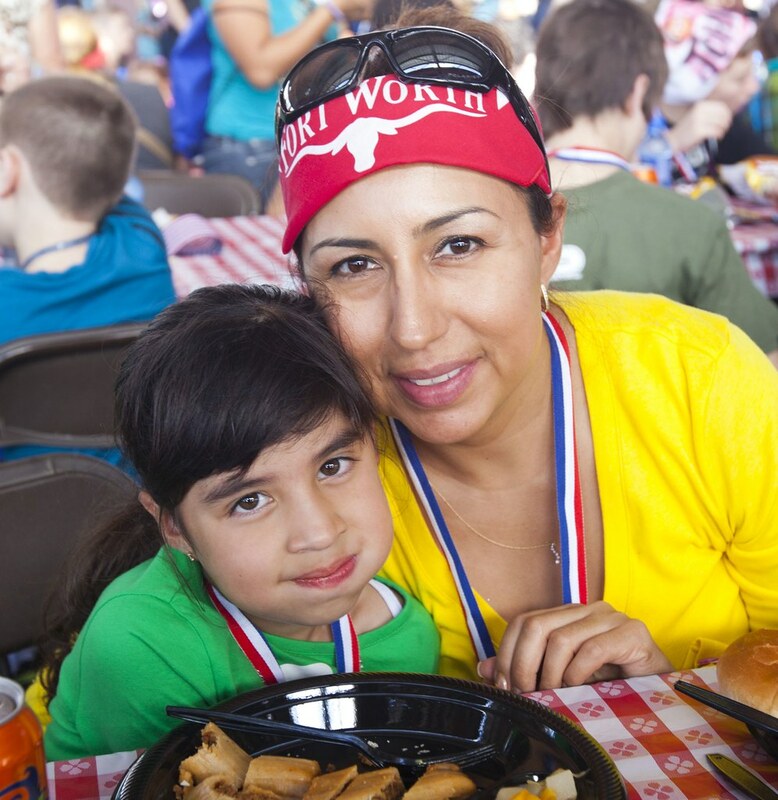 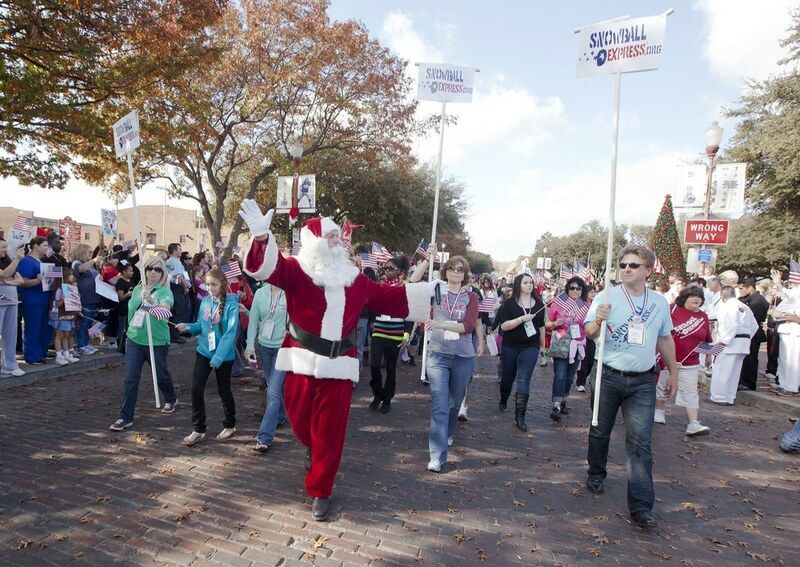 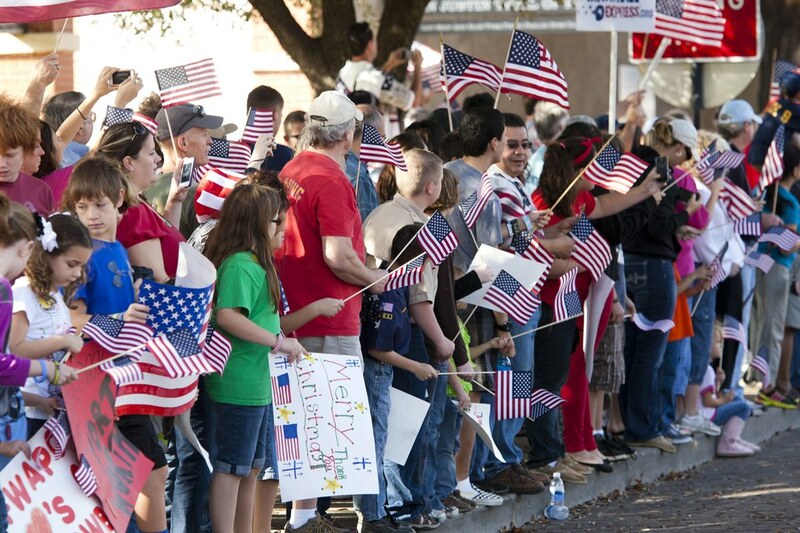 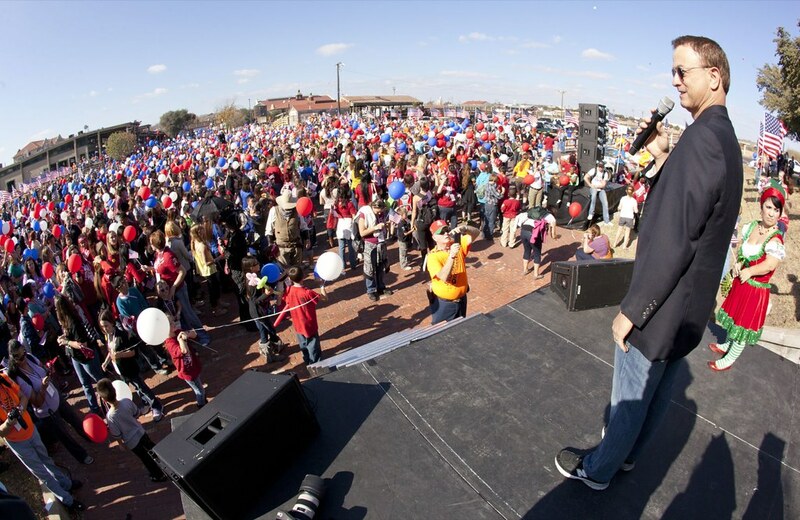 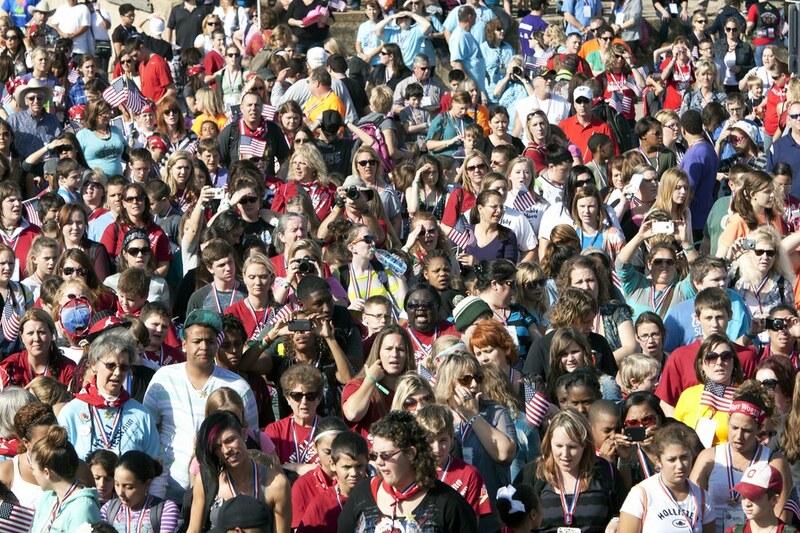 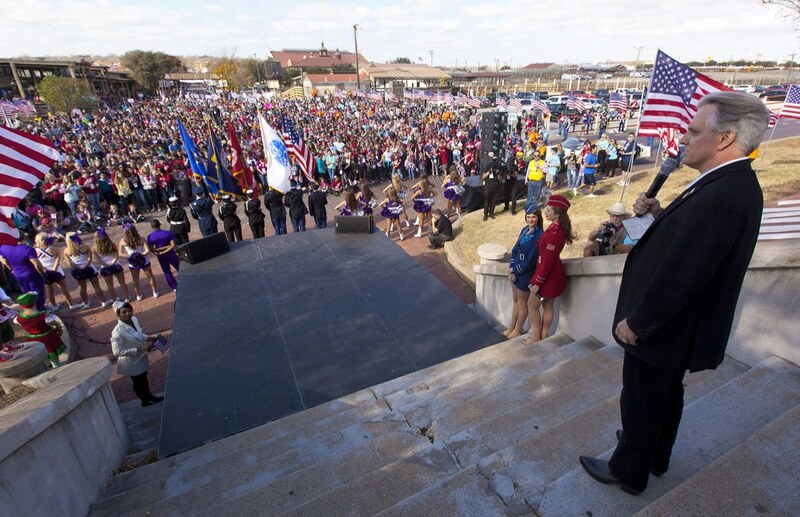 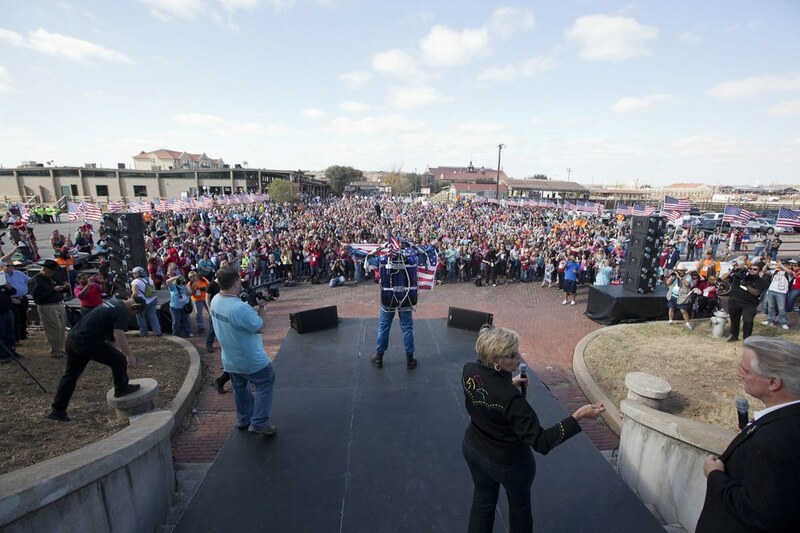 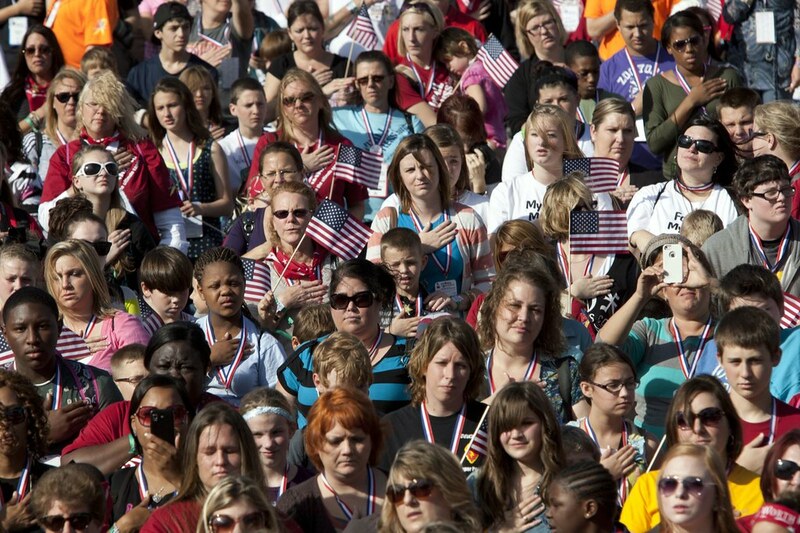 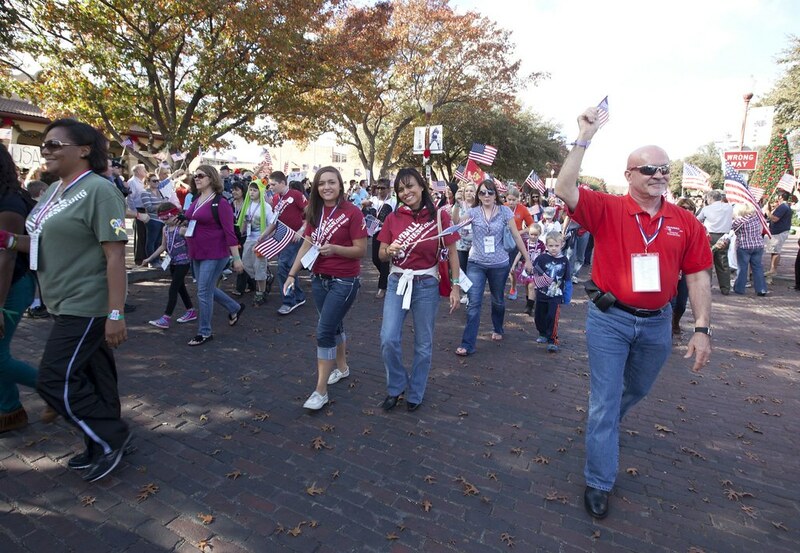 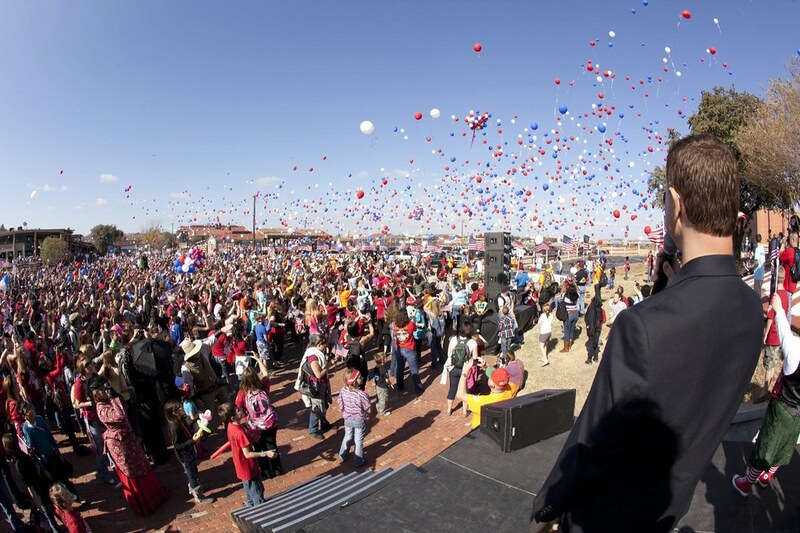 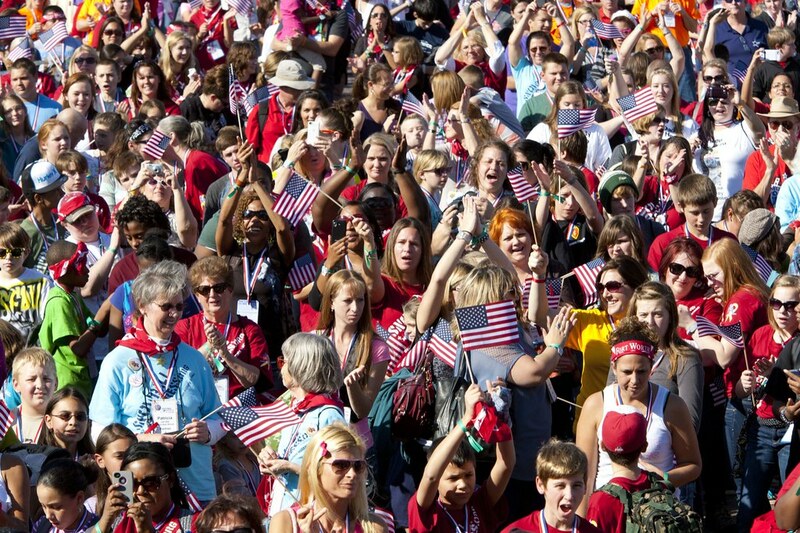 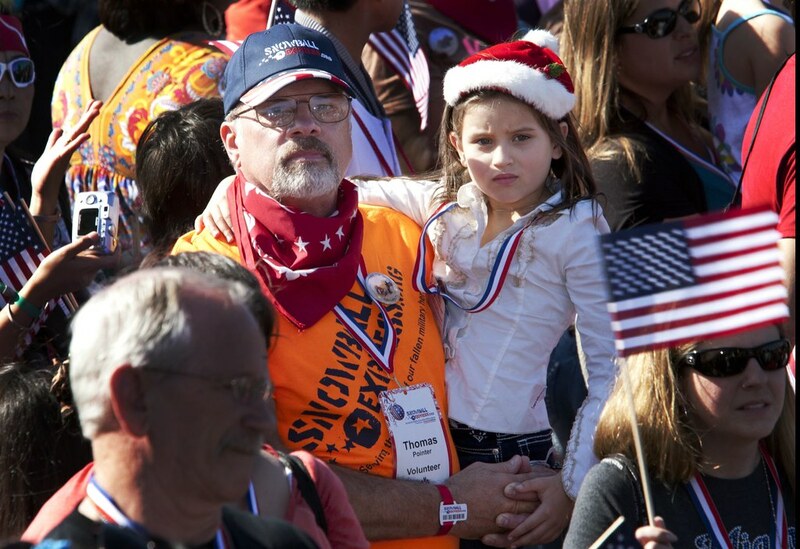 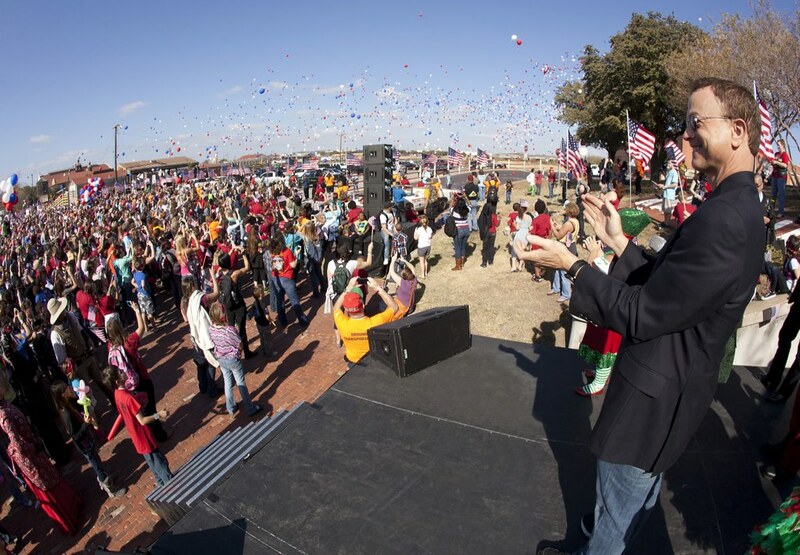 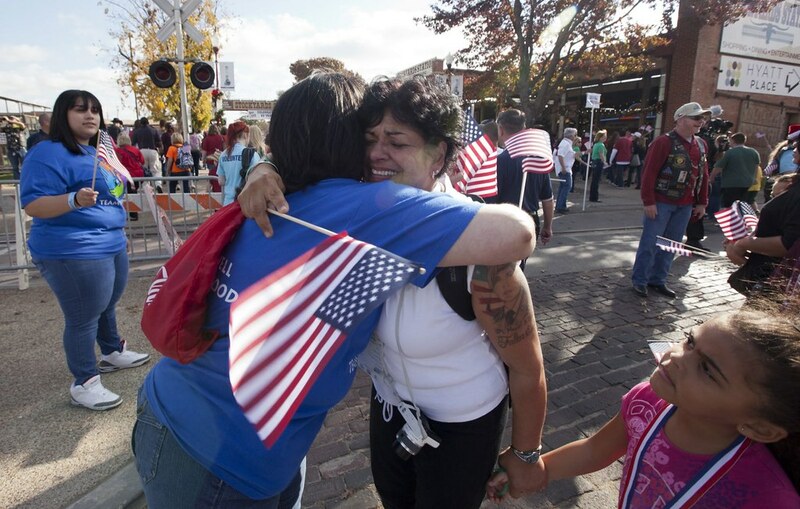 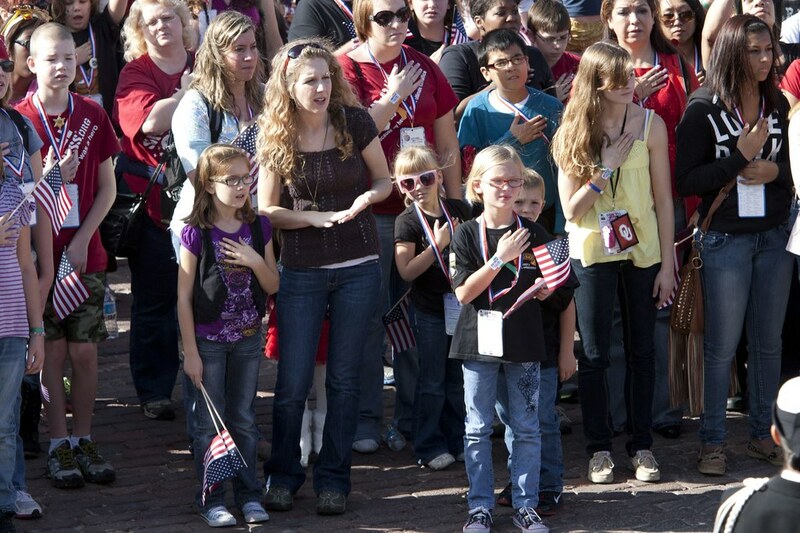 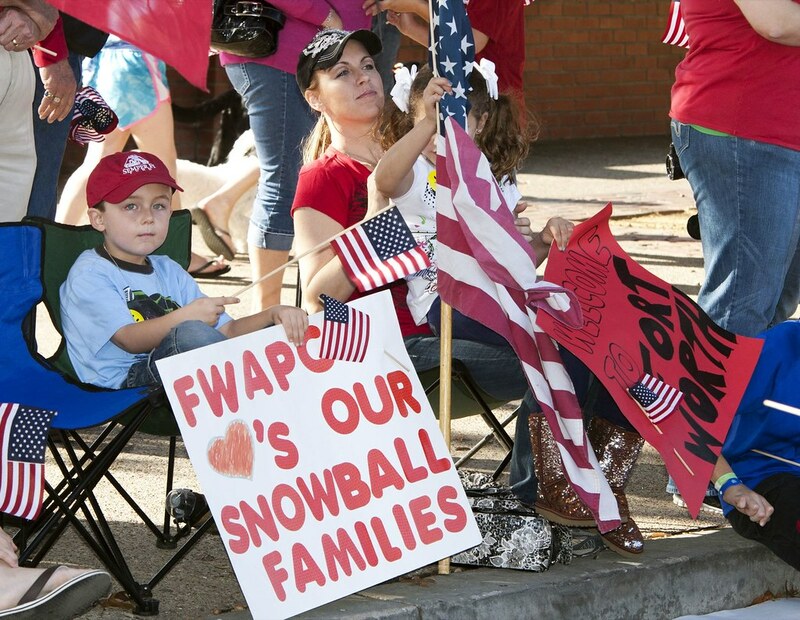 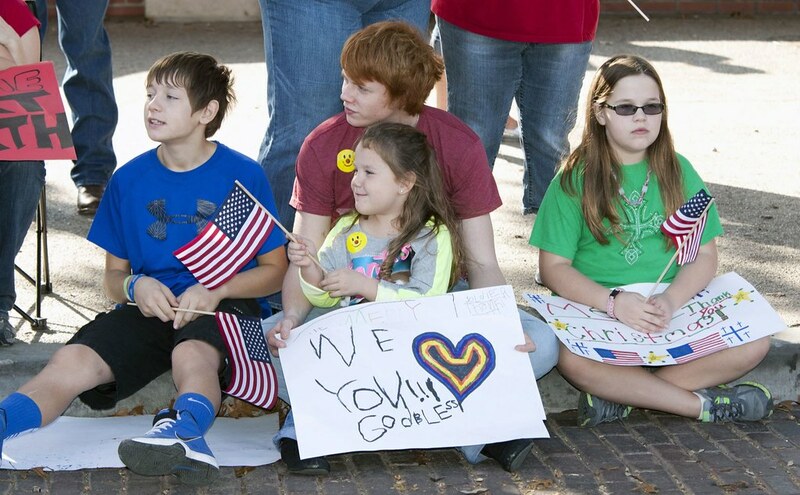 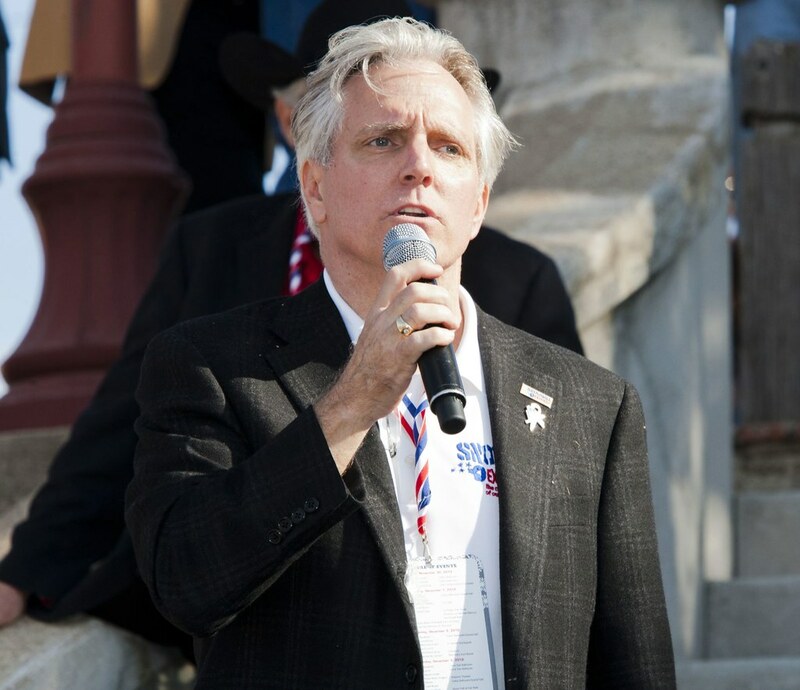 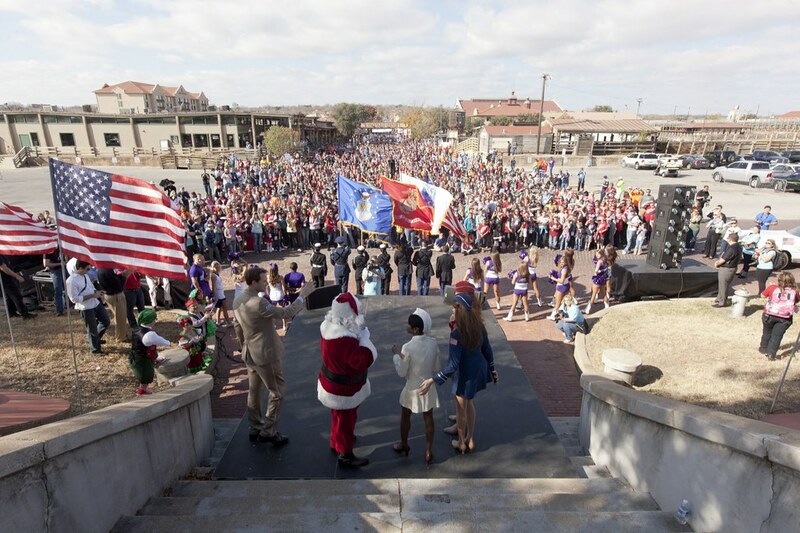 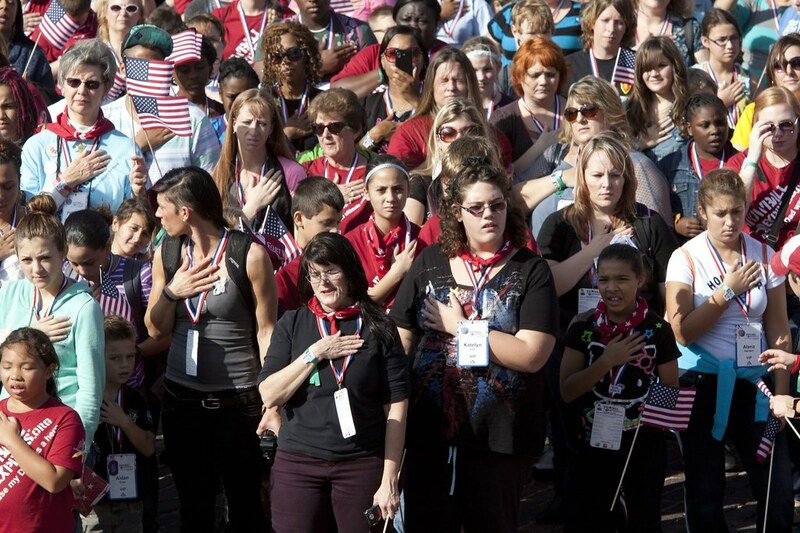 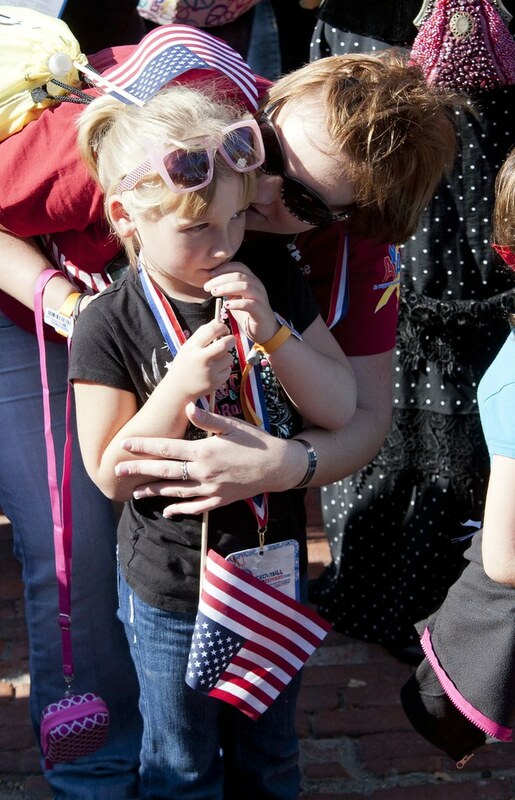 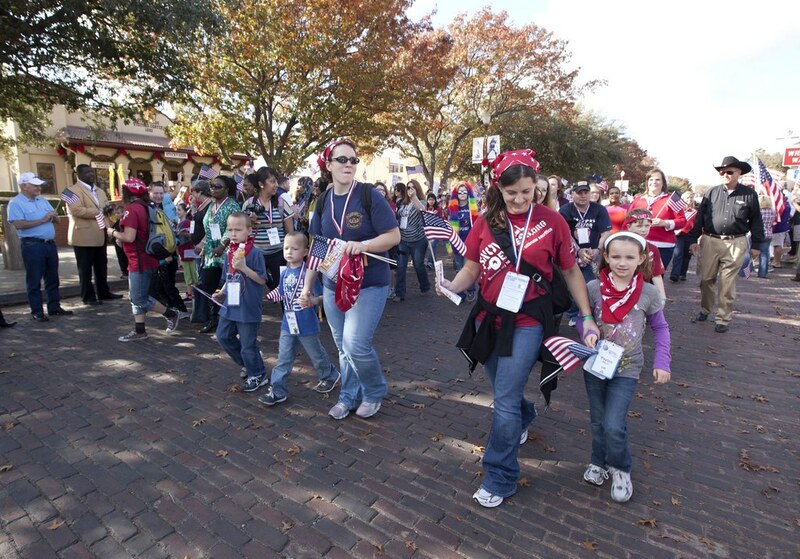 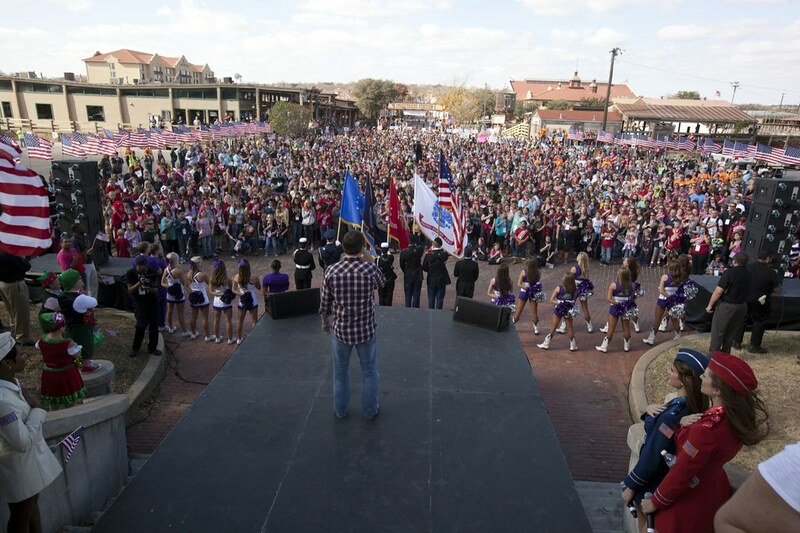 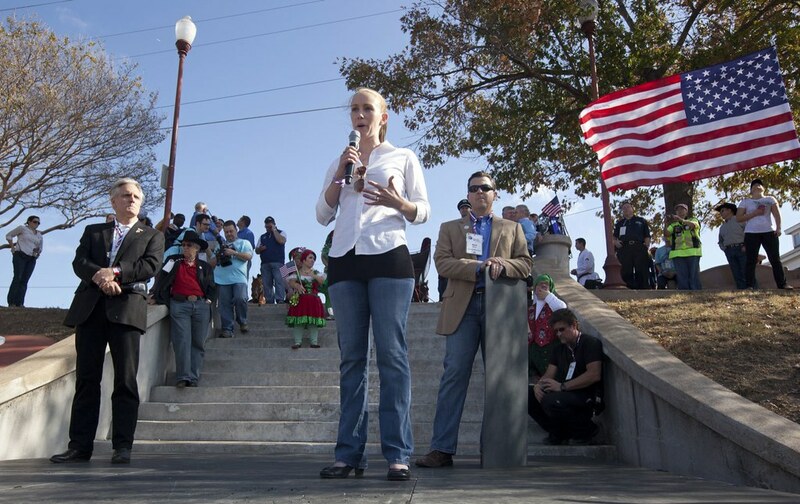 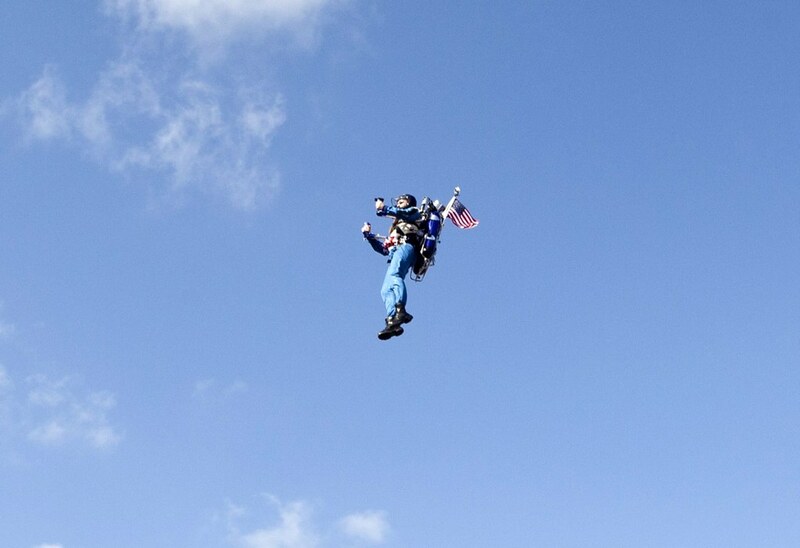 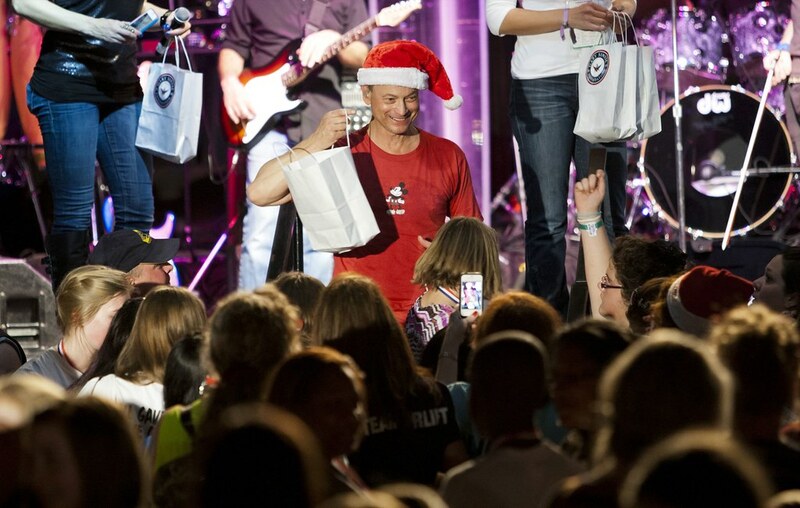 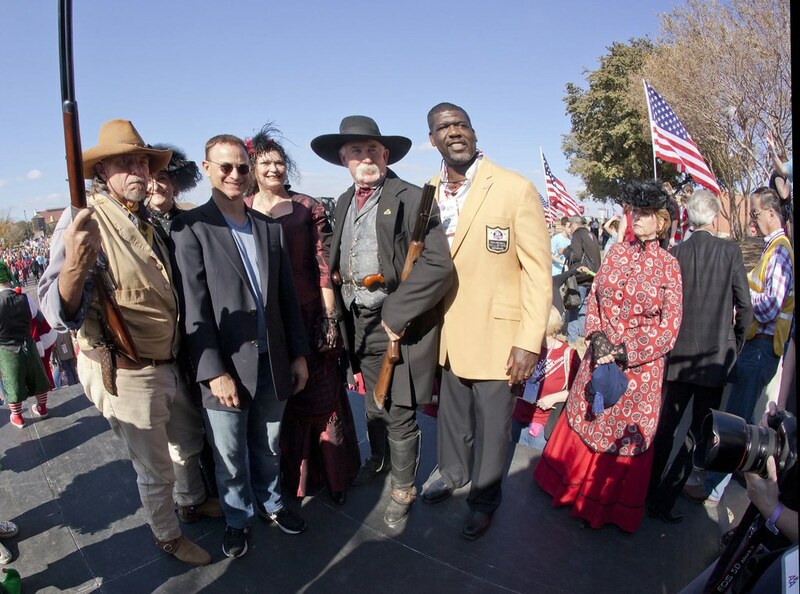 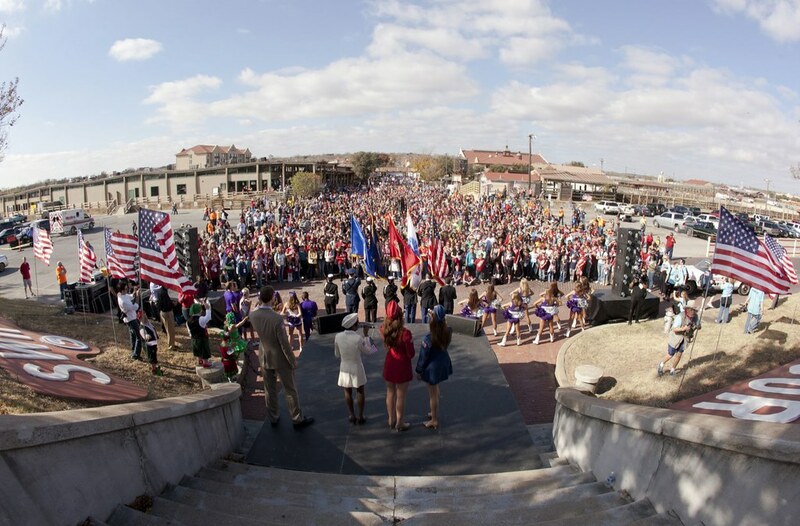 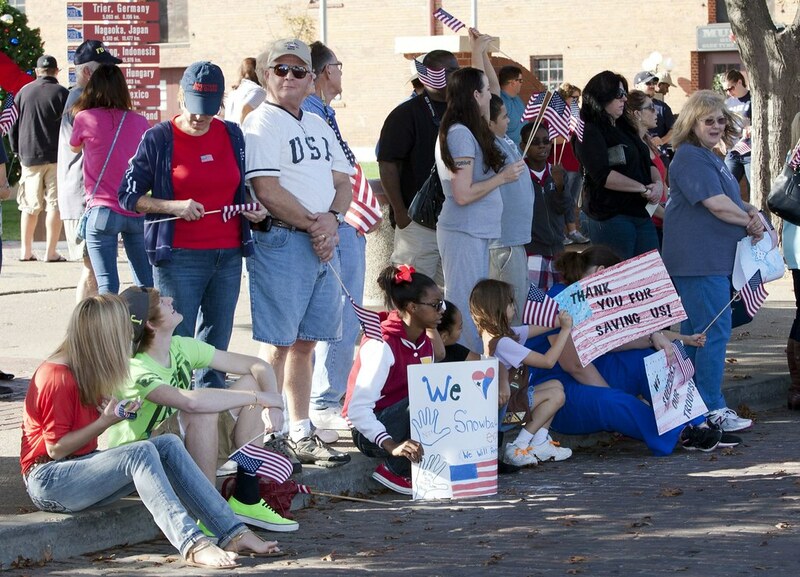 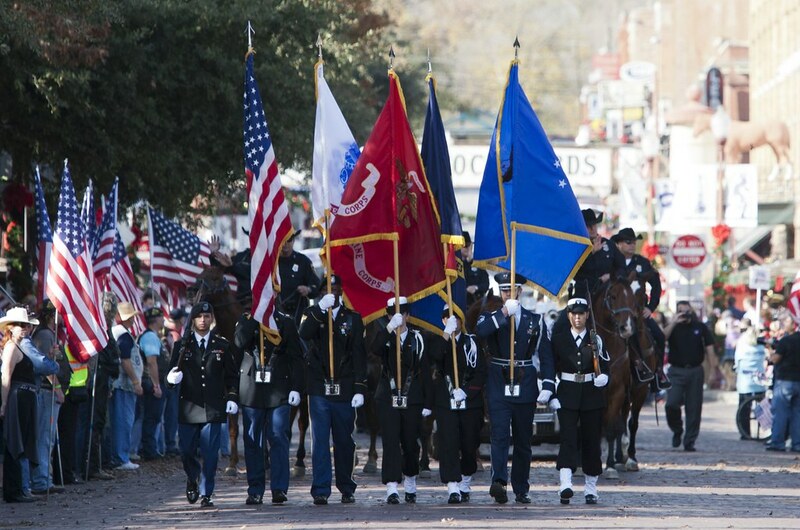 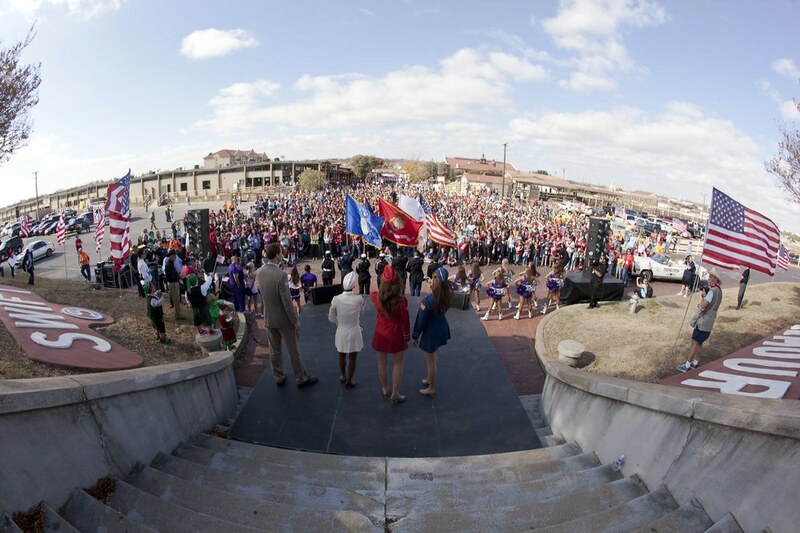 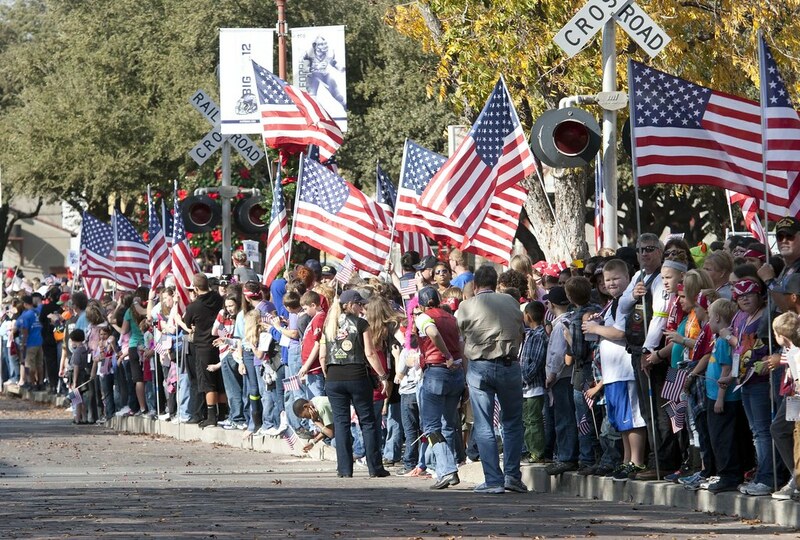 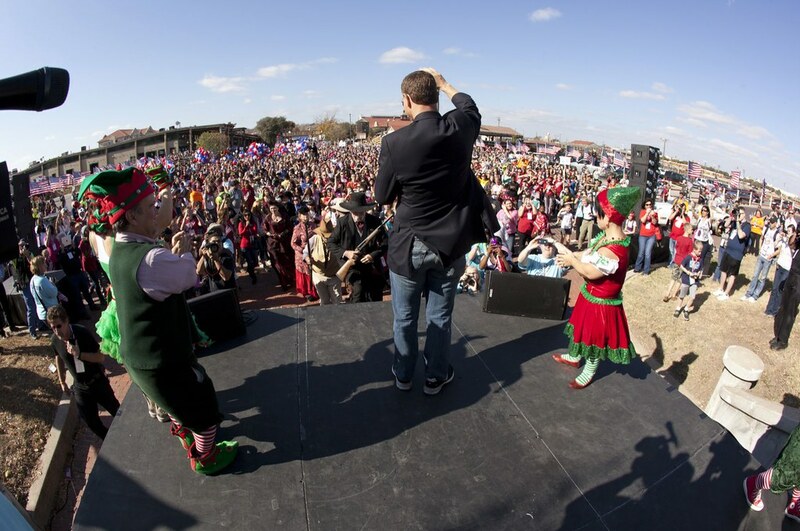 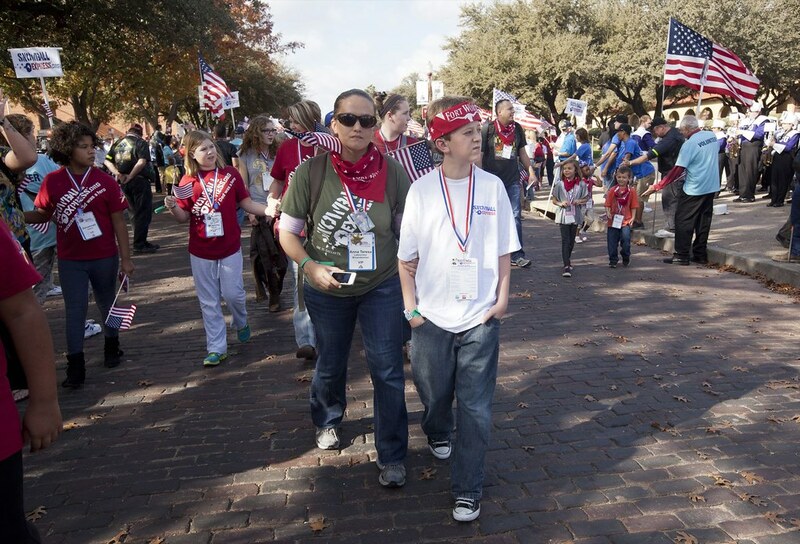 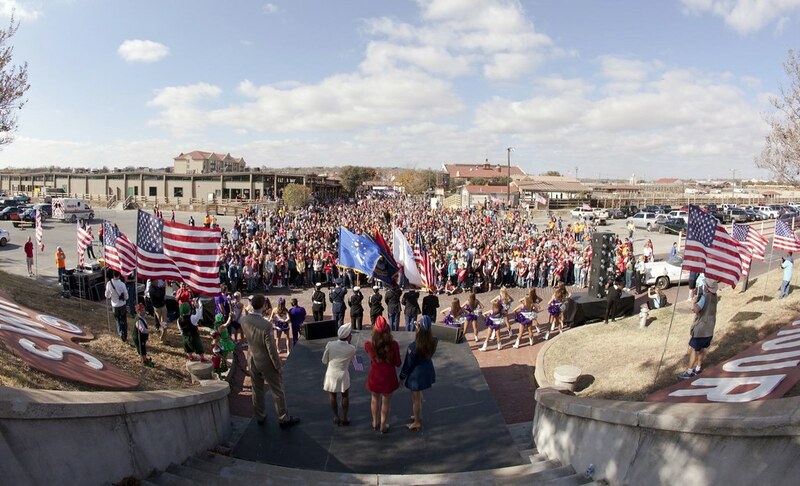 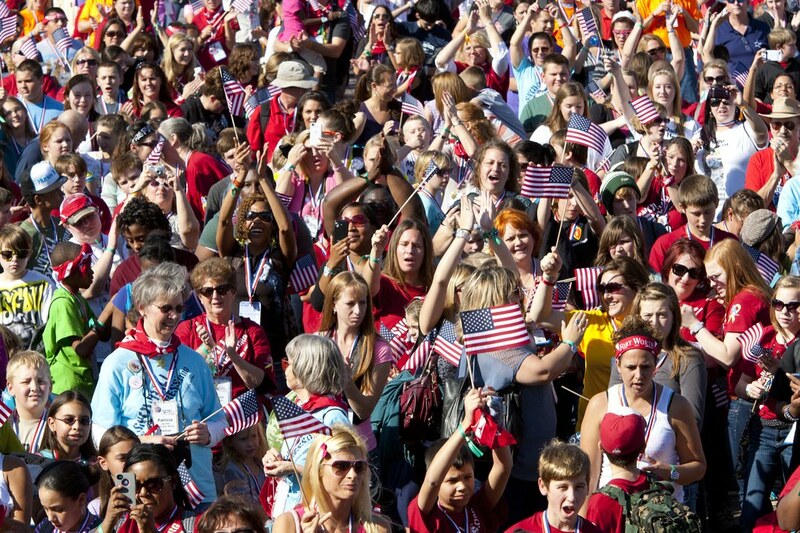 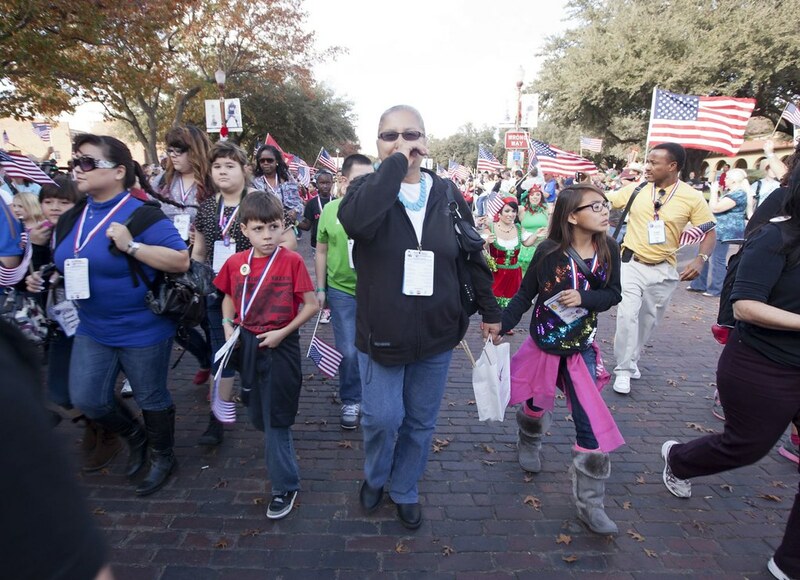 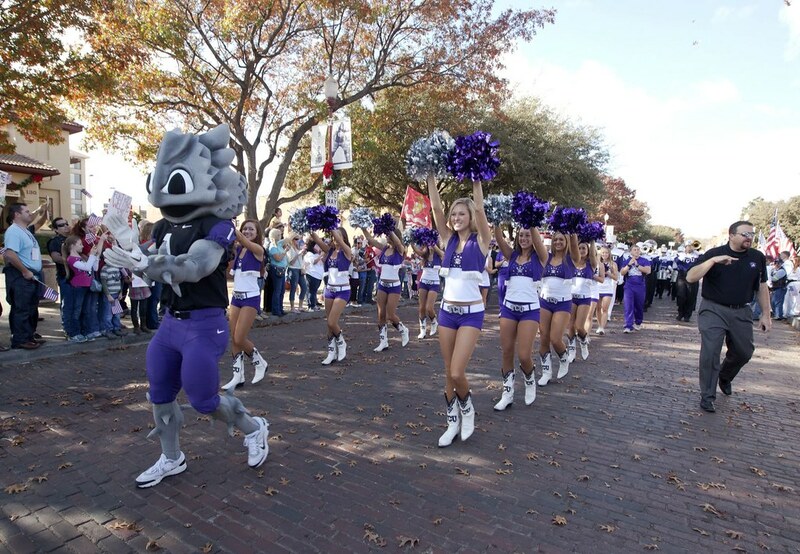 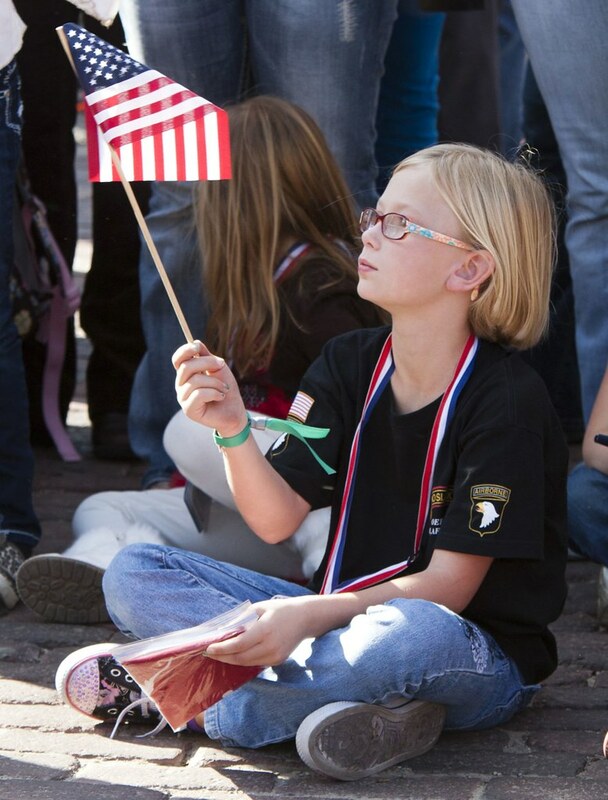 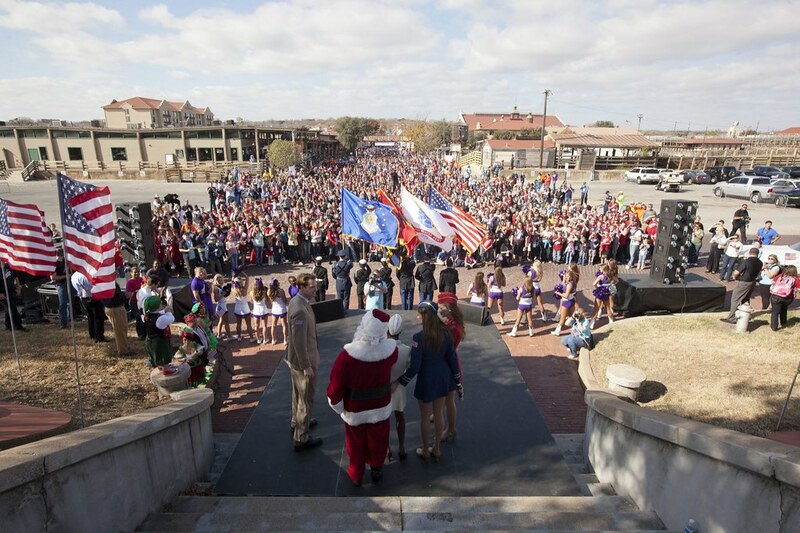 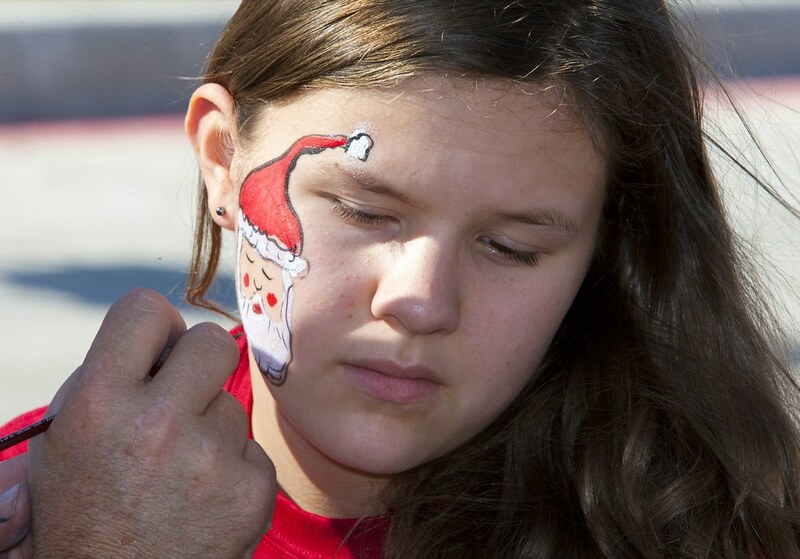 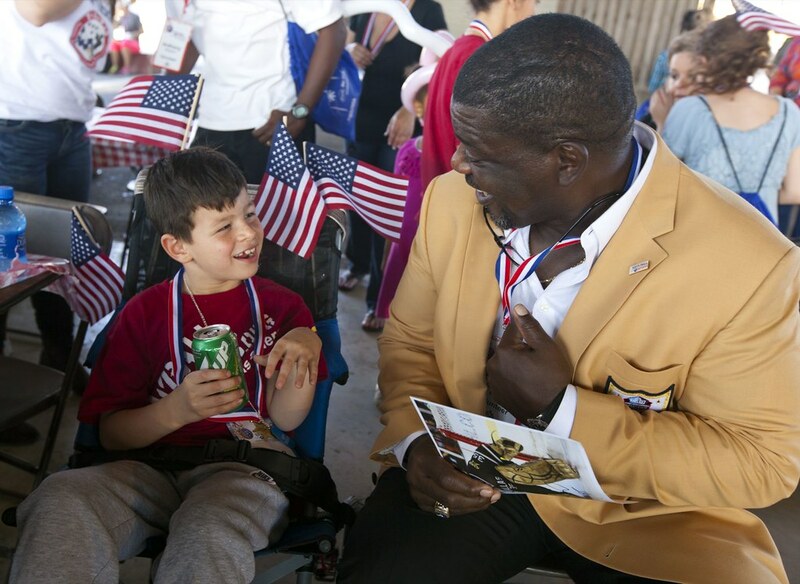 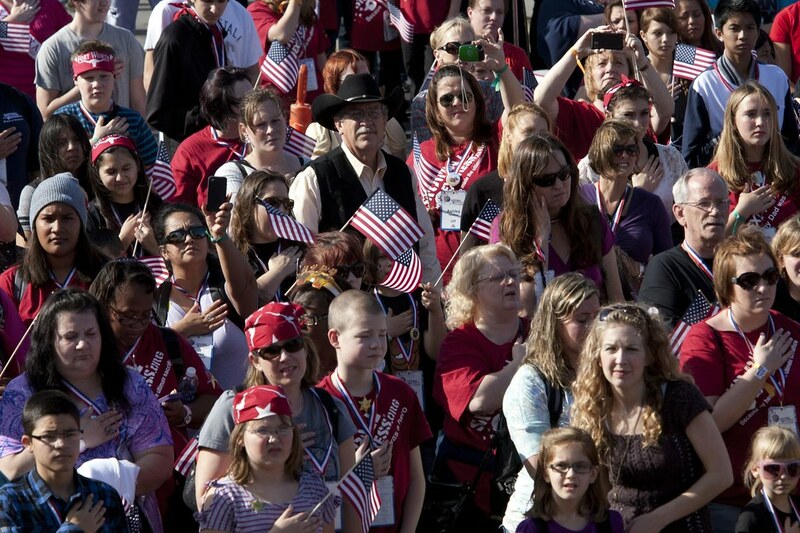 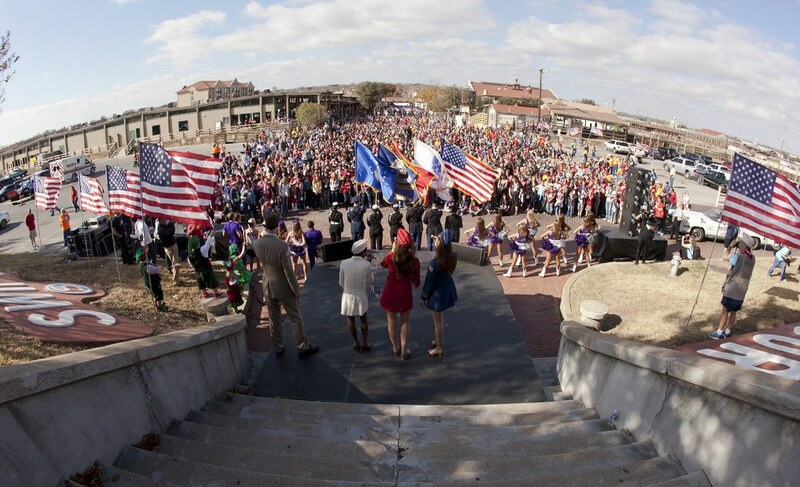 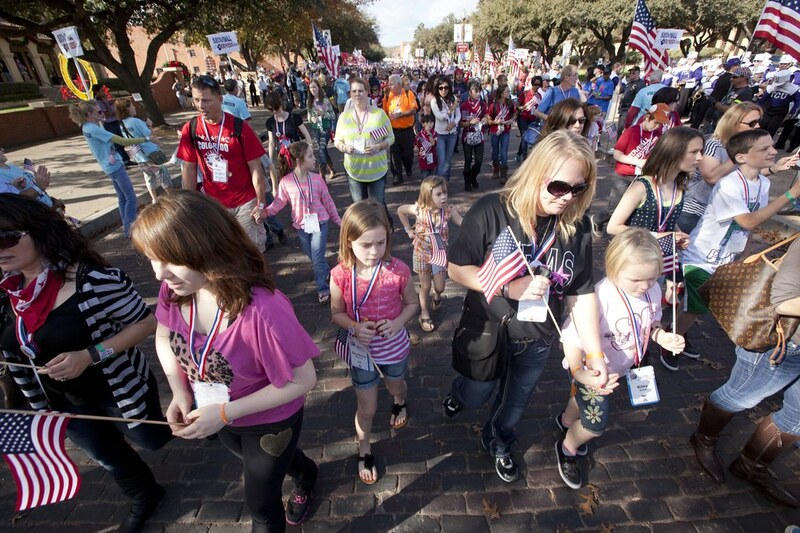 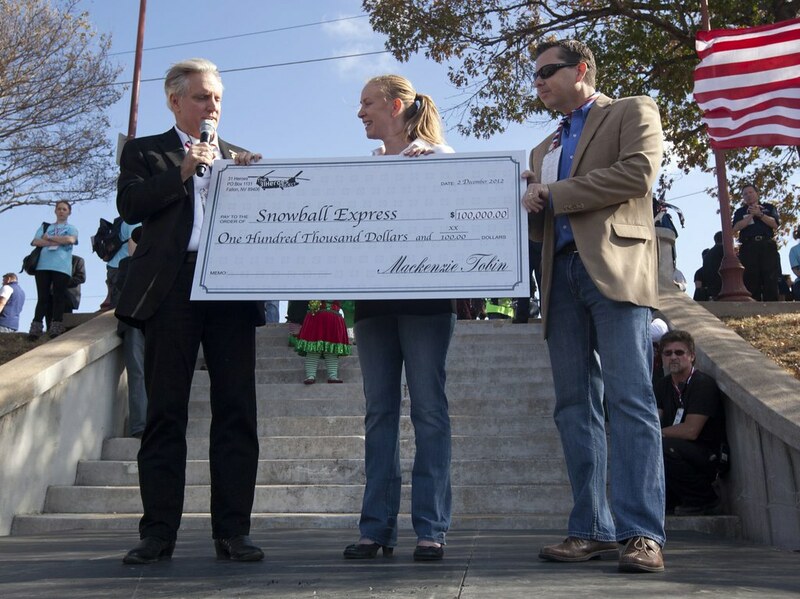 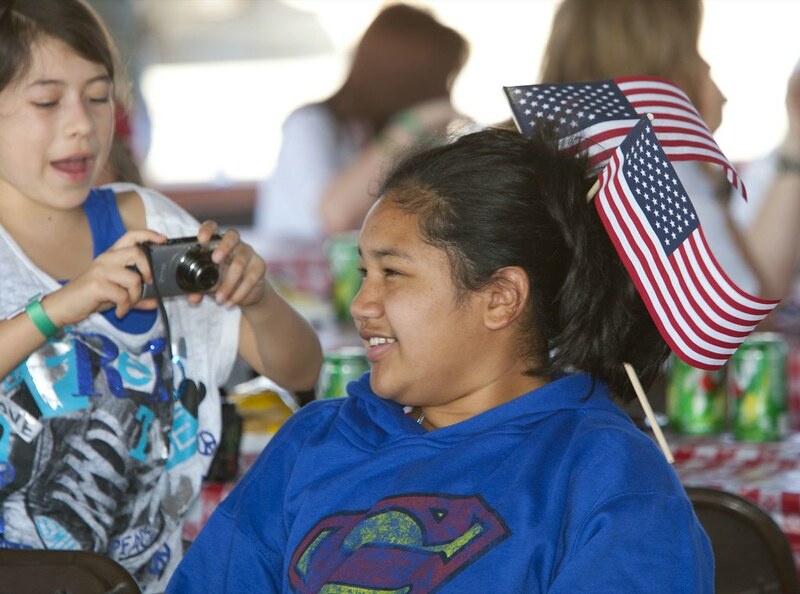 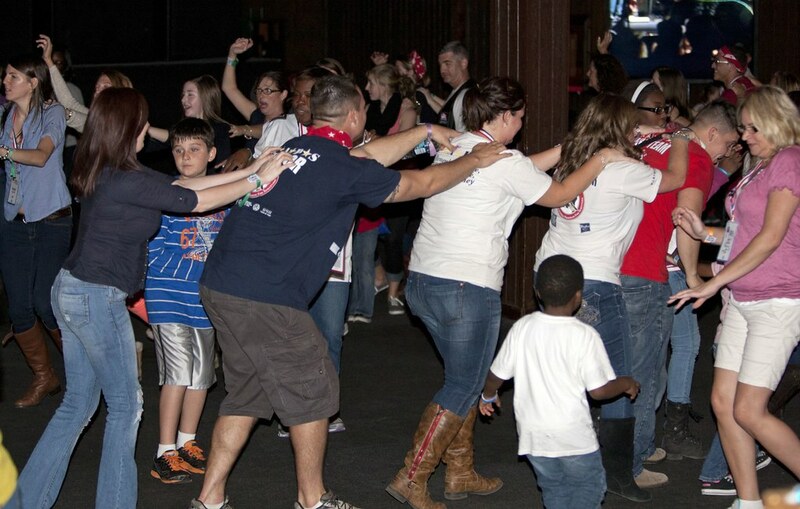 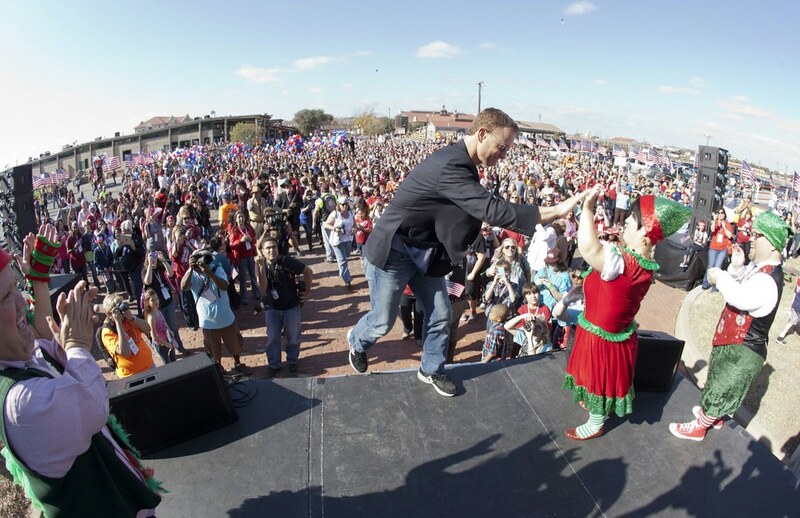 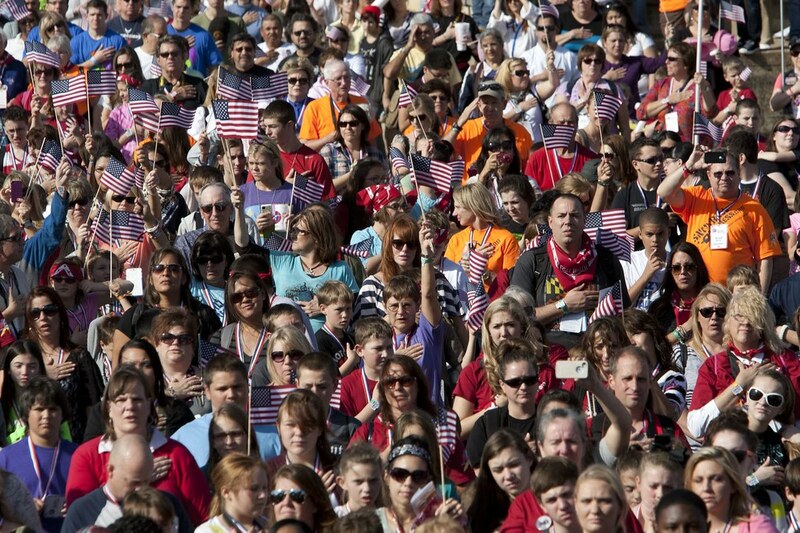 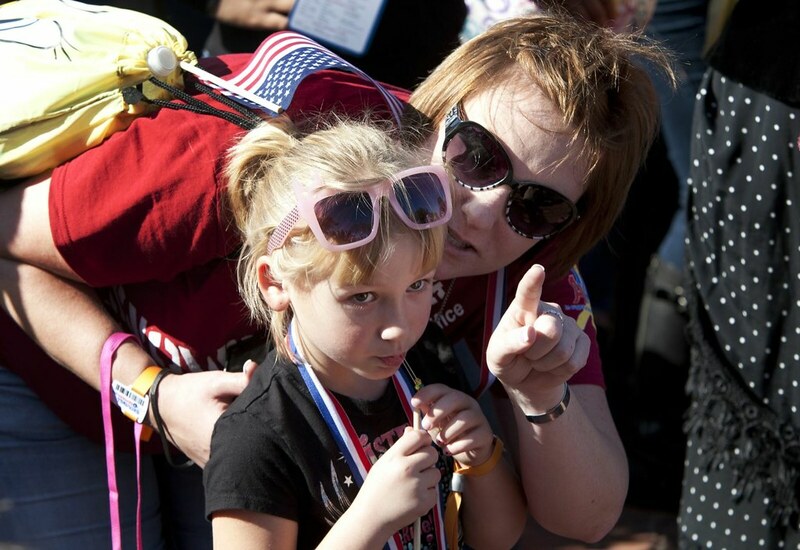 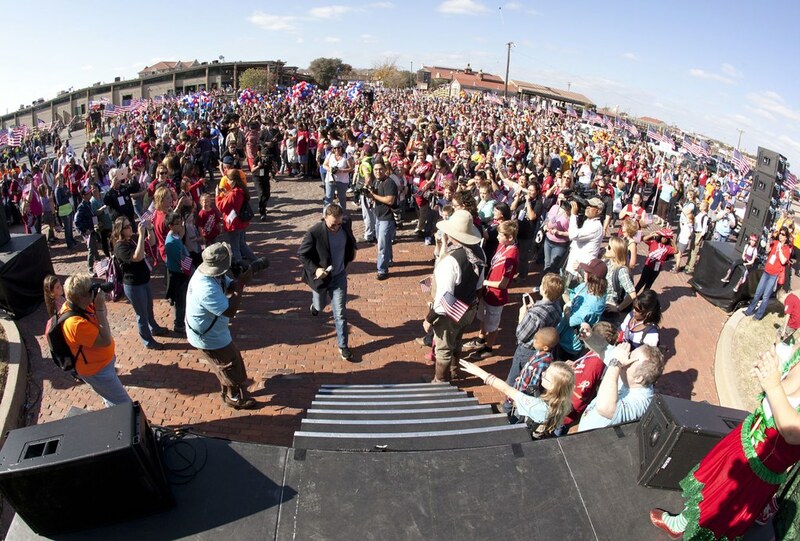 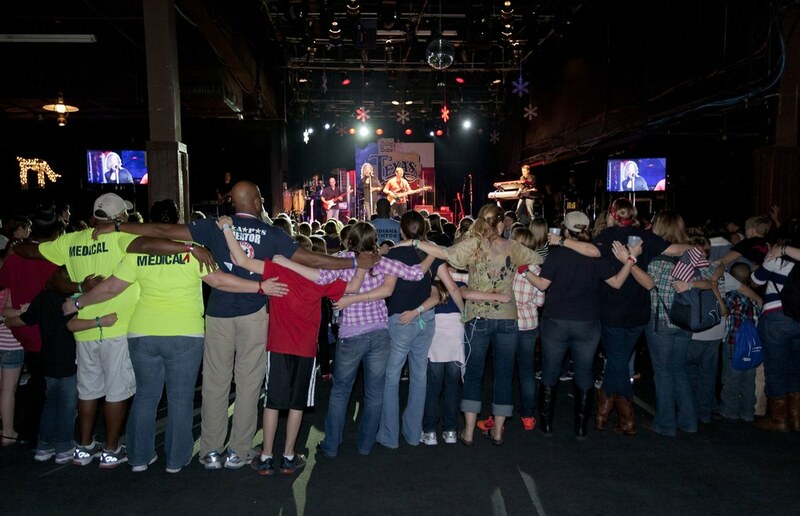 Sunday, December 2, 2012, saw nearly 1,700 Snowball Express family members parade down East Exchange Avenue in the Fort Worth Stockyards to receive the cheers and heartfelt thanks of thousands of Fort Worth area residents. 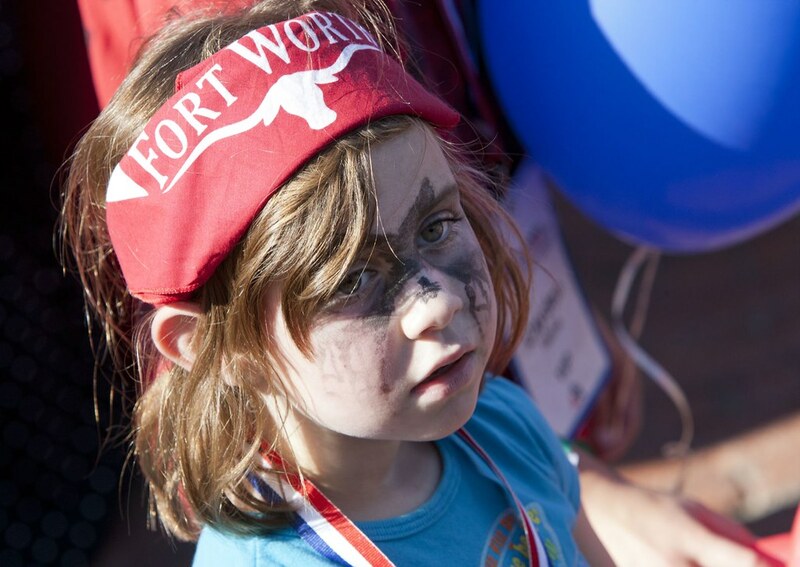 After a forty-plus bus convoy from downtown Dallas, the families were greeted by the Fort Worth Police Mounted Patrol, the Texas Christian University Marching Band, Showgirls, Cheerleaders, Super Frog, and the Legends of Texas’ own “John Wayne.” Along the way the families were honored by Arlington Fire Department personnel saluting from highway overpasses, and by the people of Fort Worth lined along sections of North Main Street as the convoy headed north from downtown to the Stockyards. 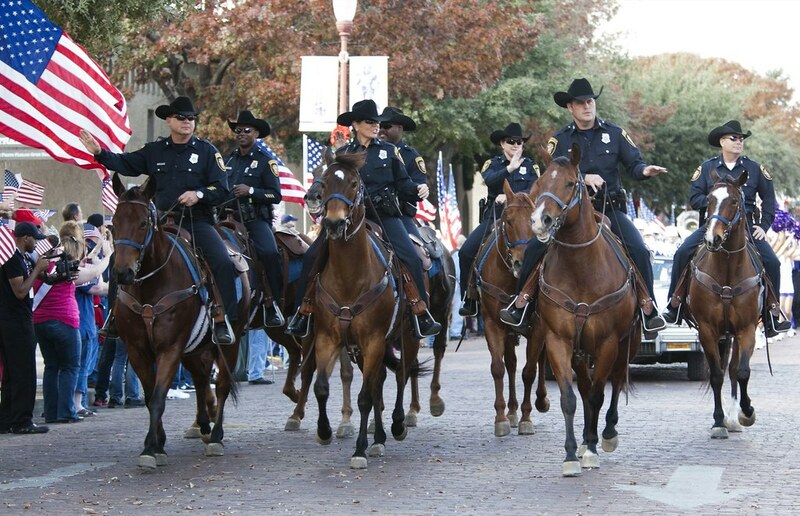 The Walk of Gratitude was led by the Joint Color Guard from NAS Fort Worth JRB, and included the mounted patrol and the groups from TCU. 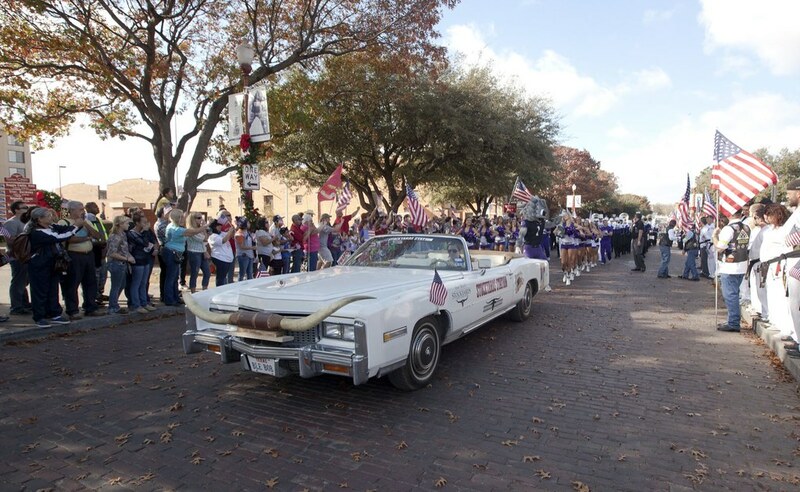 The Stockyards Station Cadillac, complete with a set of horns on the hood, joined in as well. 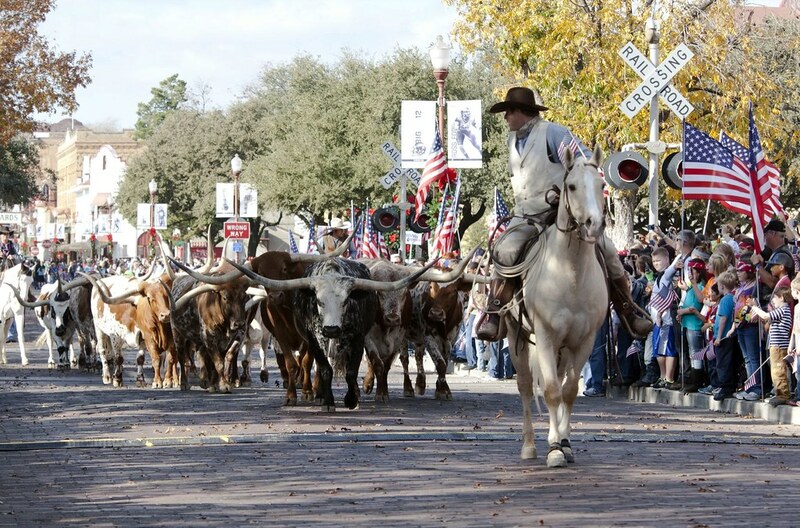 The families were thrilled to see the Fort Worth Herd of longhorn cattle come down the same street they had just been on. 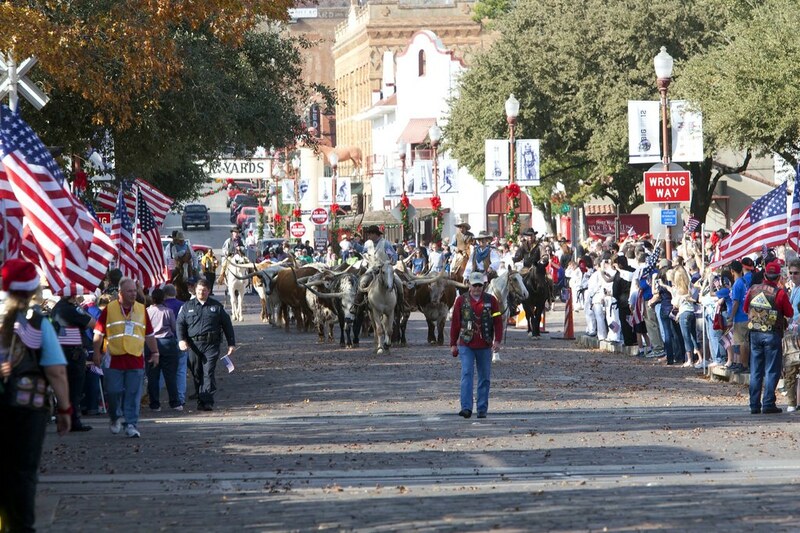 Where else besides Cowtown can you see a real live cattle drive on a city street? 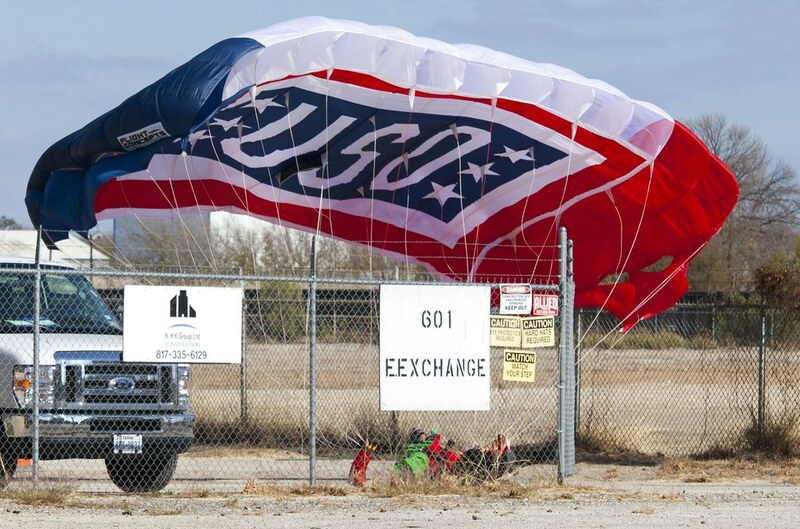 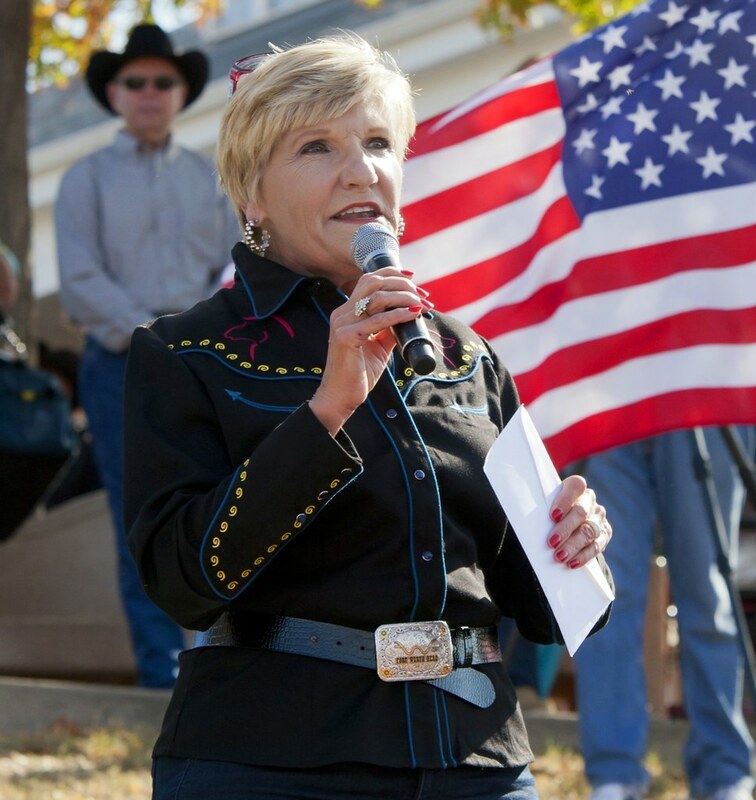 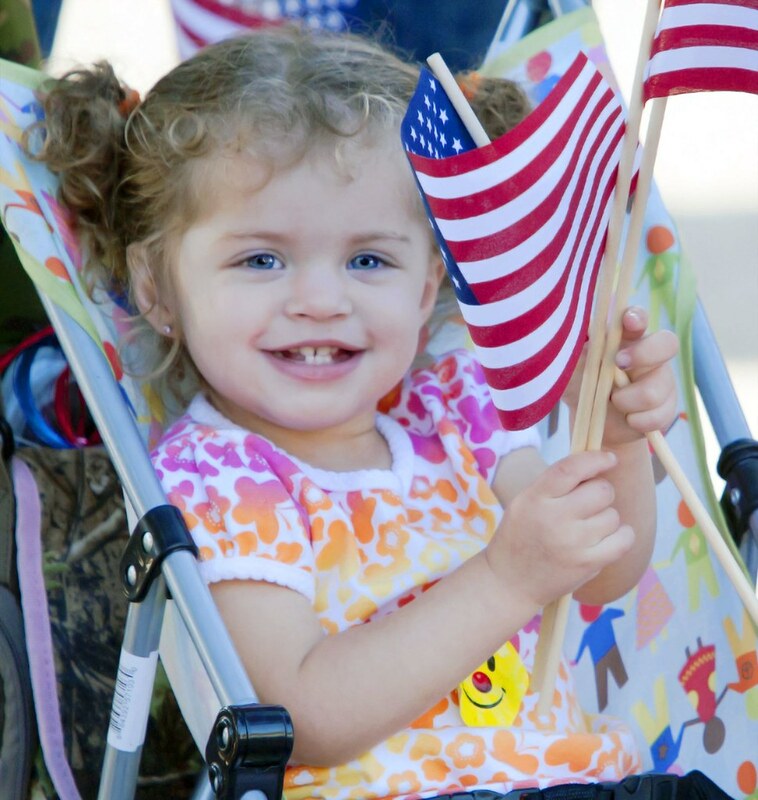 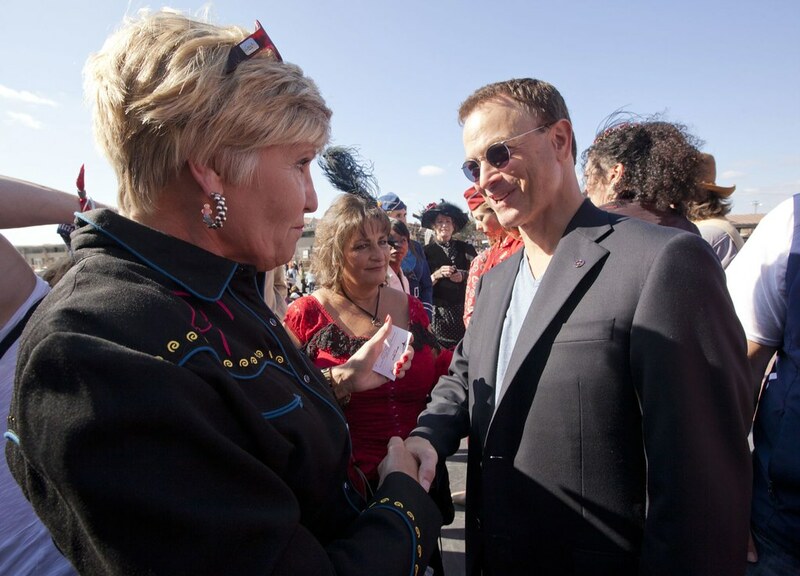 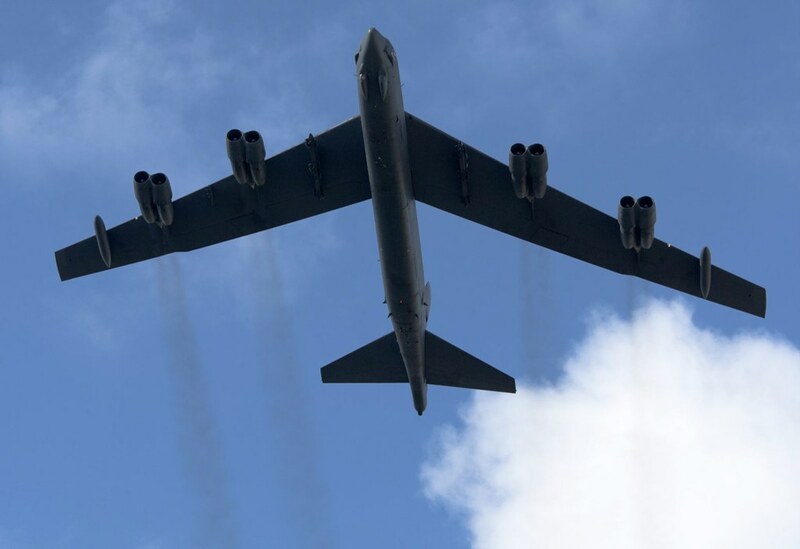 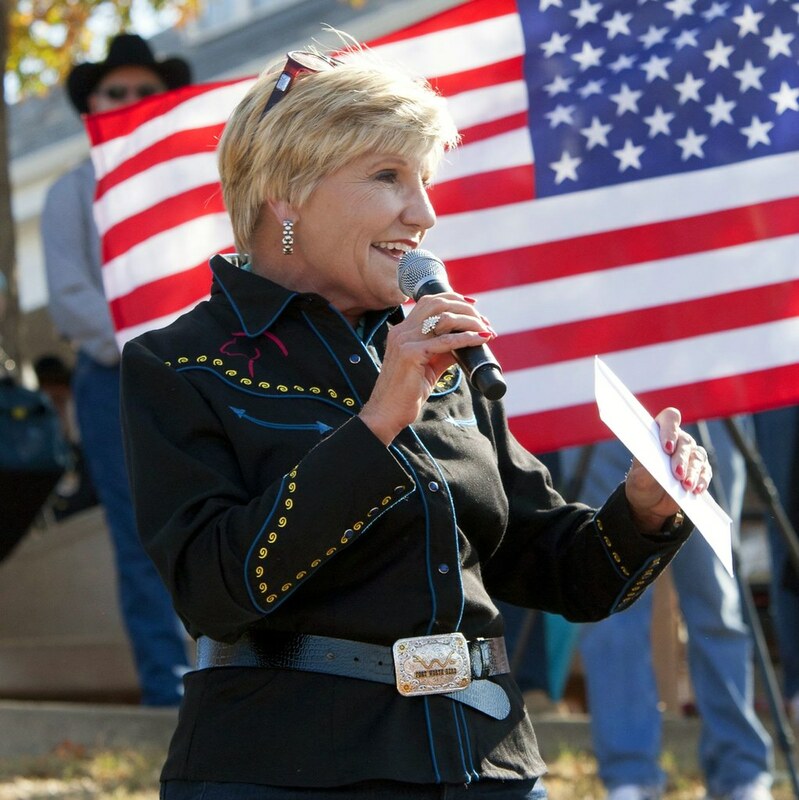 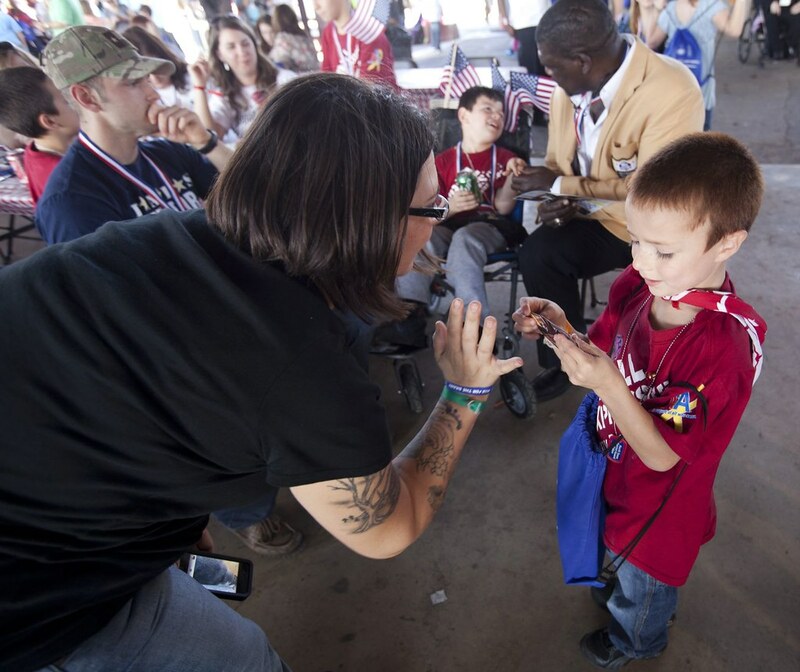 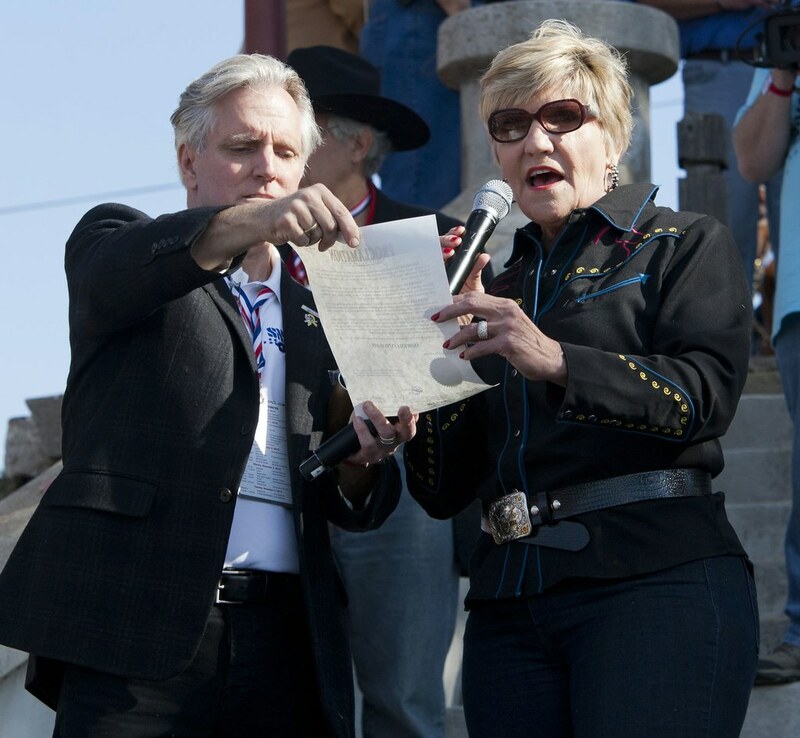 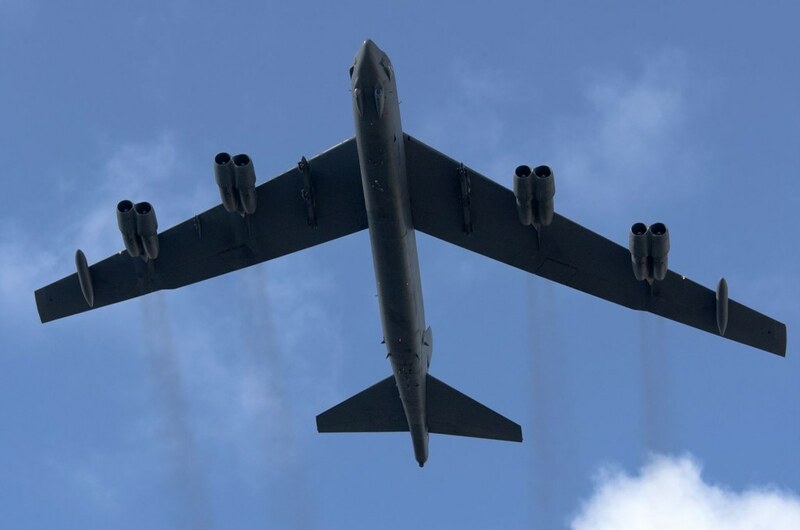 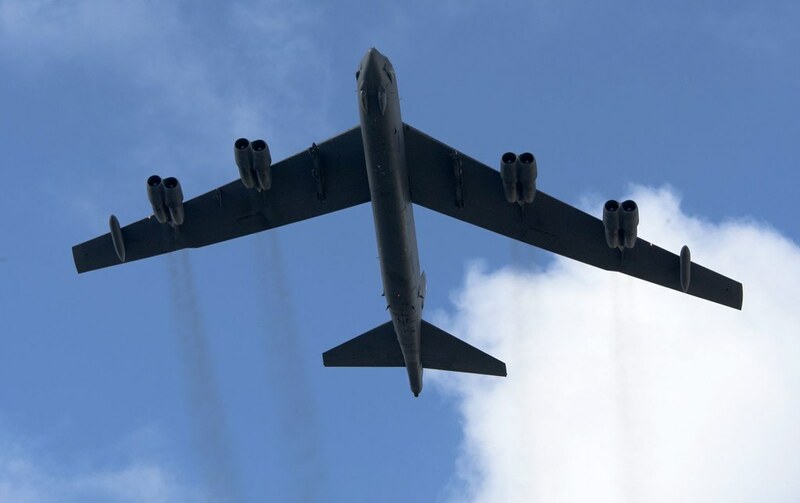 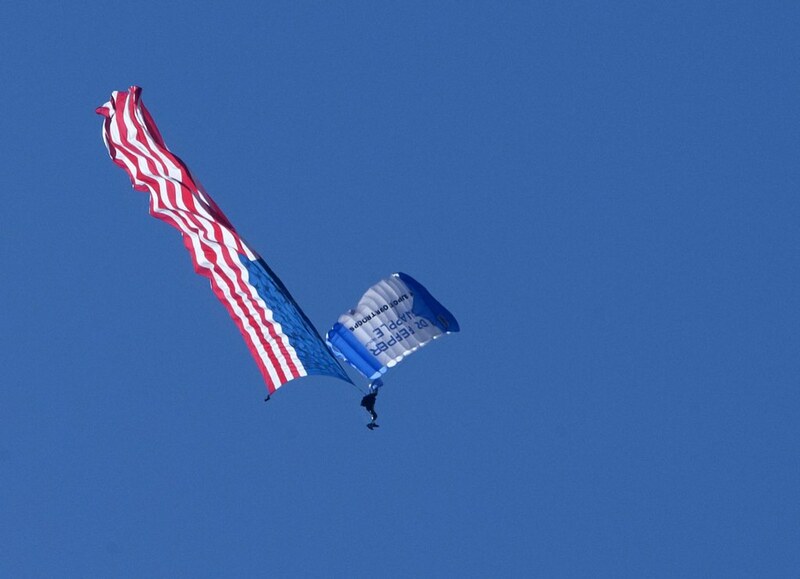 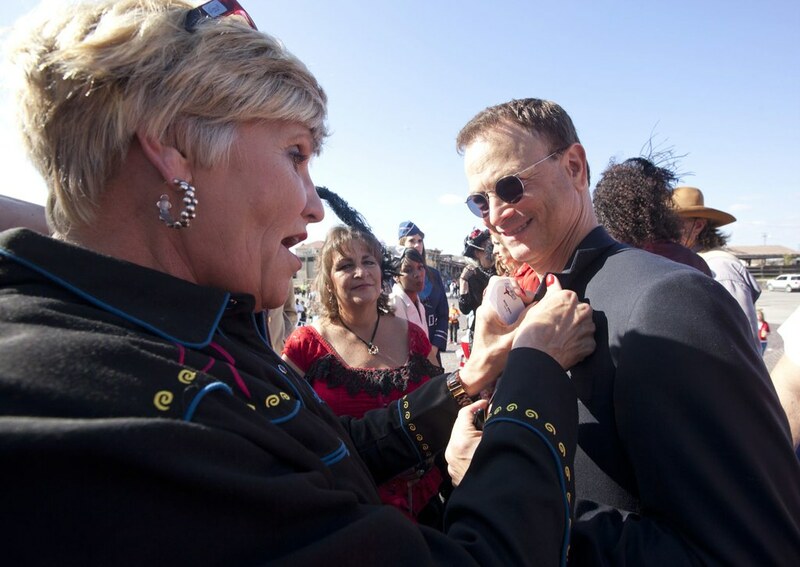 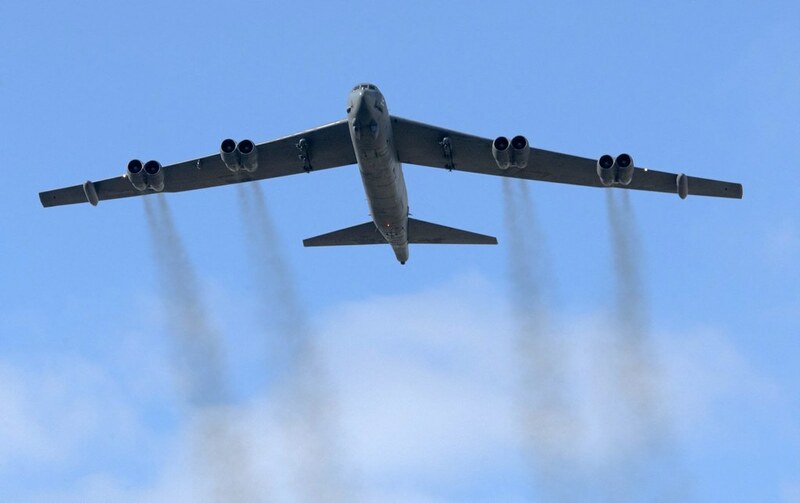 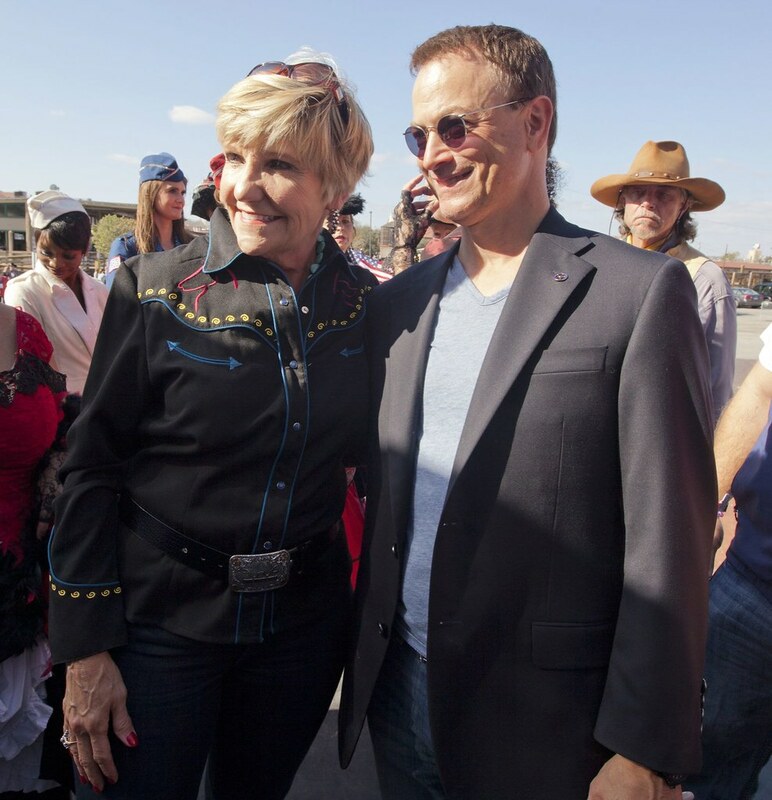 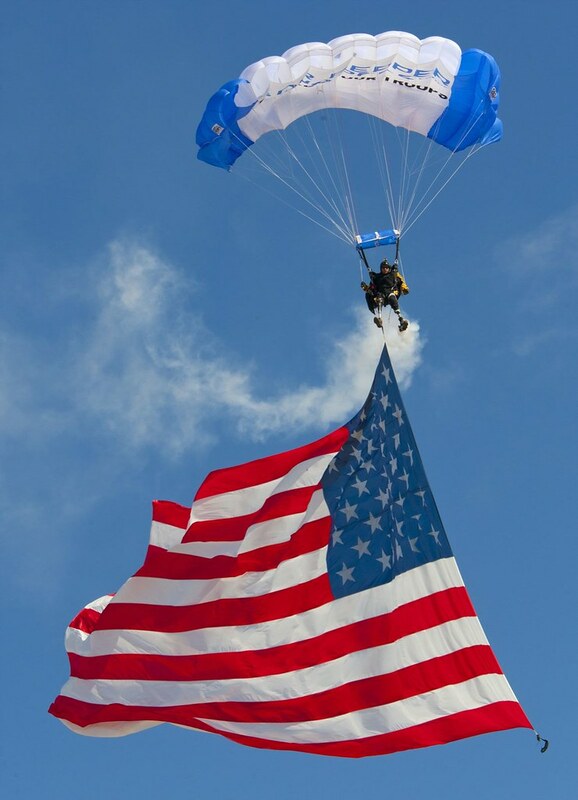 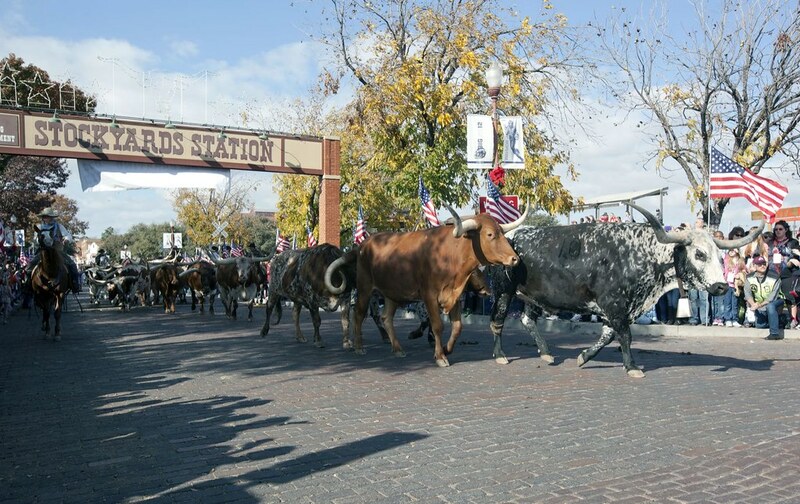 Once in the Stockyards the families were welcomed by Fort Worth Mayor Price, entertained by the USO’s Liberty Bells, and honored with a B-52 flyover from the 307th Bomber Wing of the 10th Air Force. 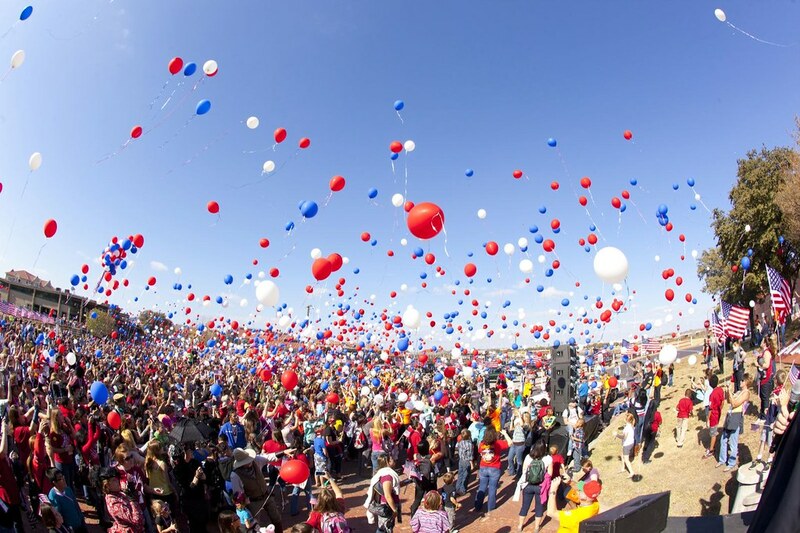 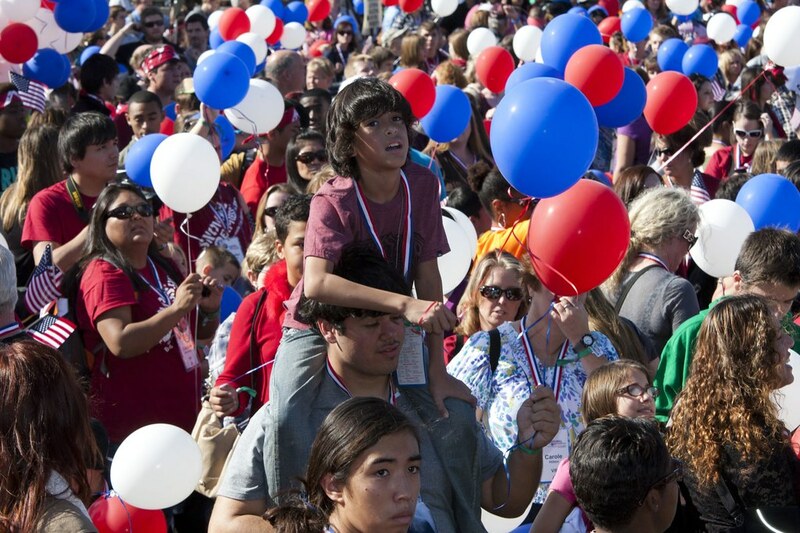 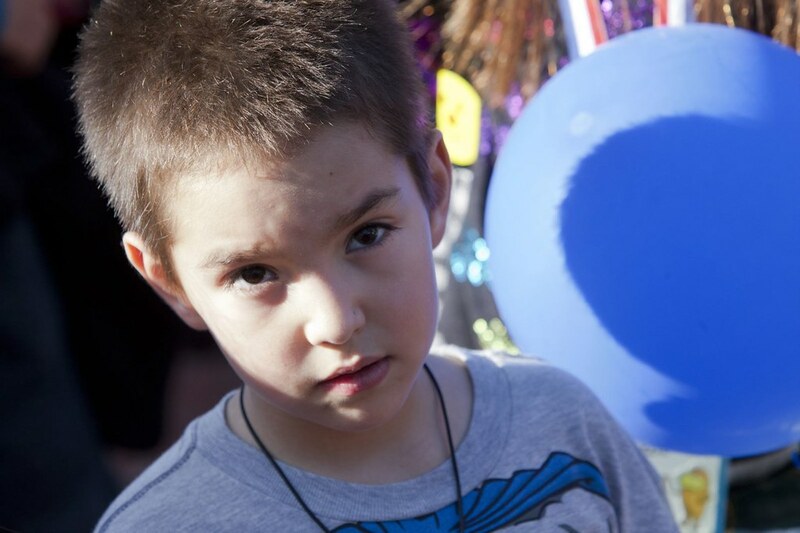 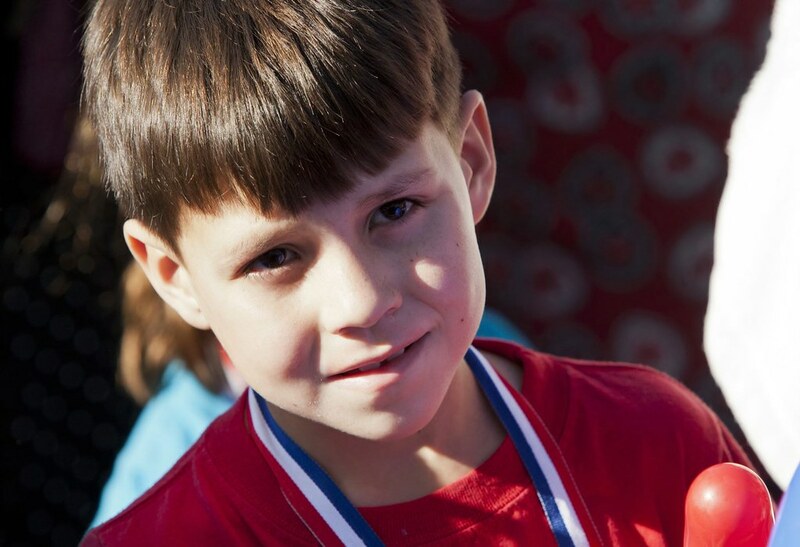 Before moving on to the day’s other events, the Snowball families released thousands of red, white, and blue balloons into the clear blue December sky in memory of their lost loved ones. 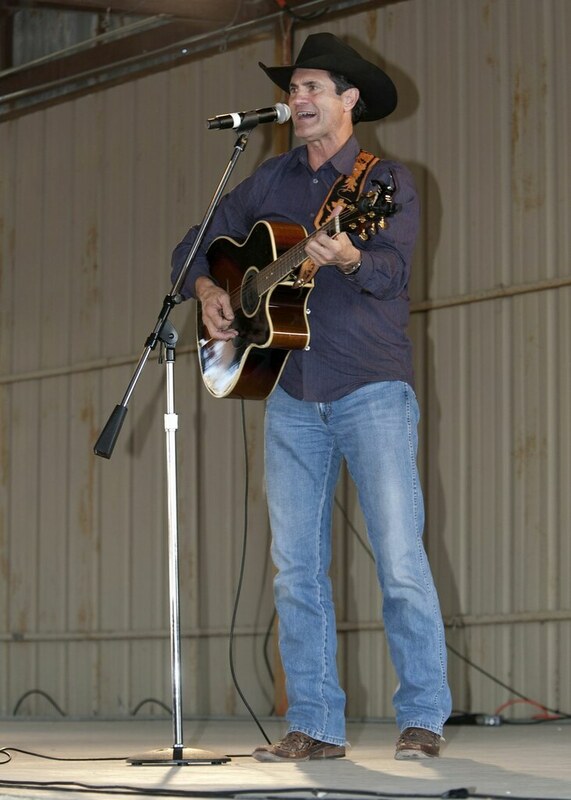 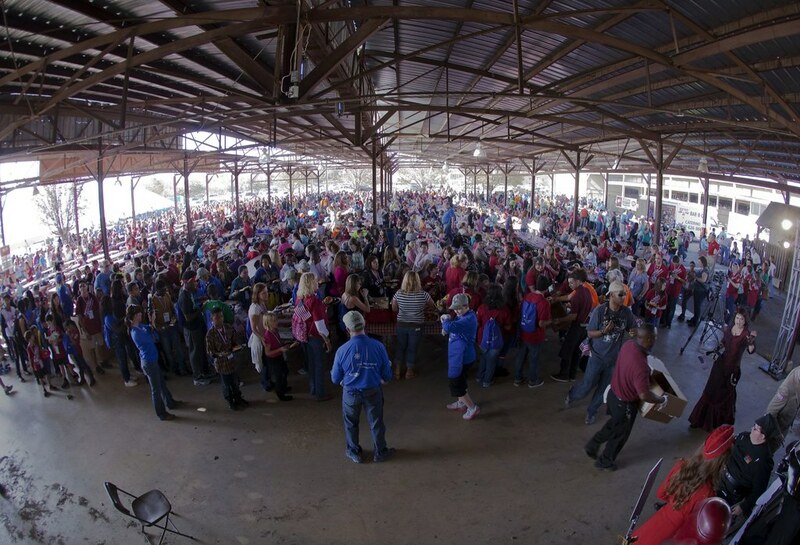 Next was lunch in the Back Forty where the Snowball families were entertained by among others local country western star, Sonny Burgess, and enjoyed a hearty meal of barbeque provided by the Texas Pork Producers. 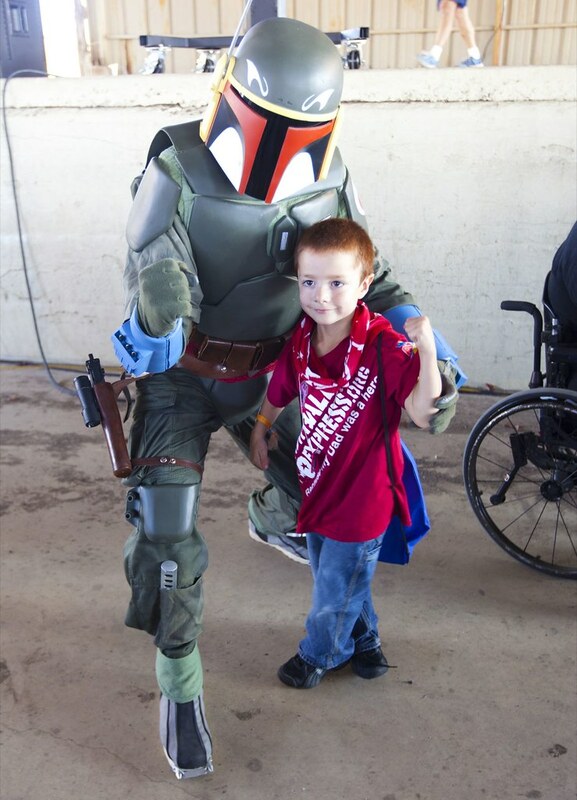 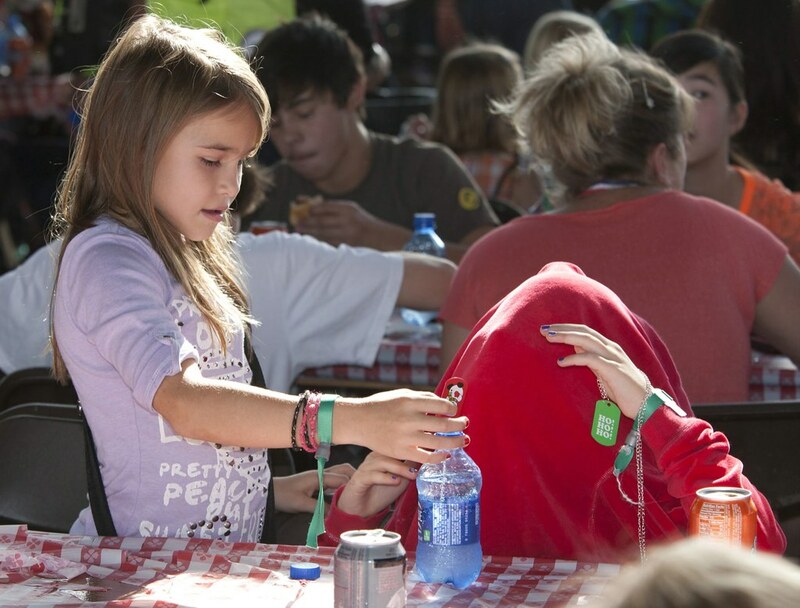 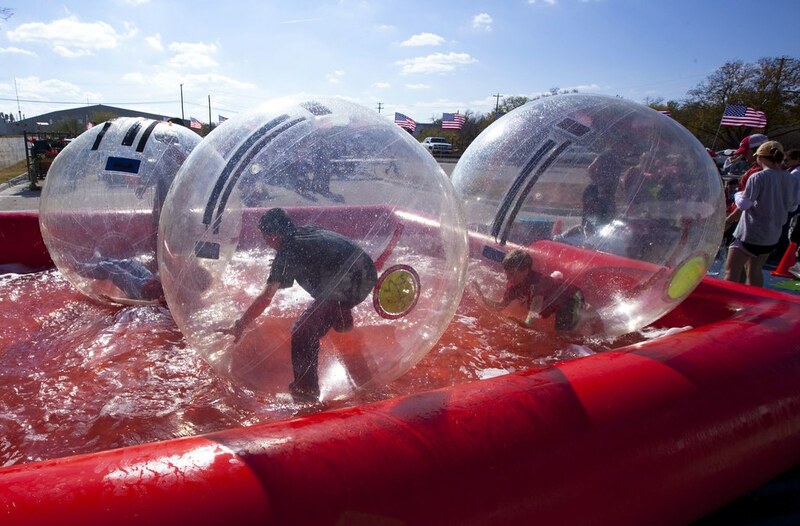 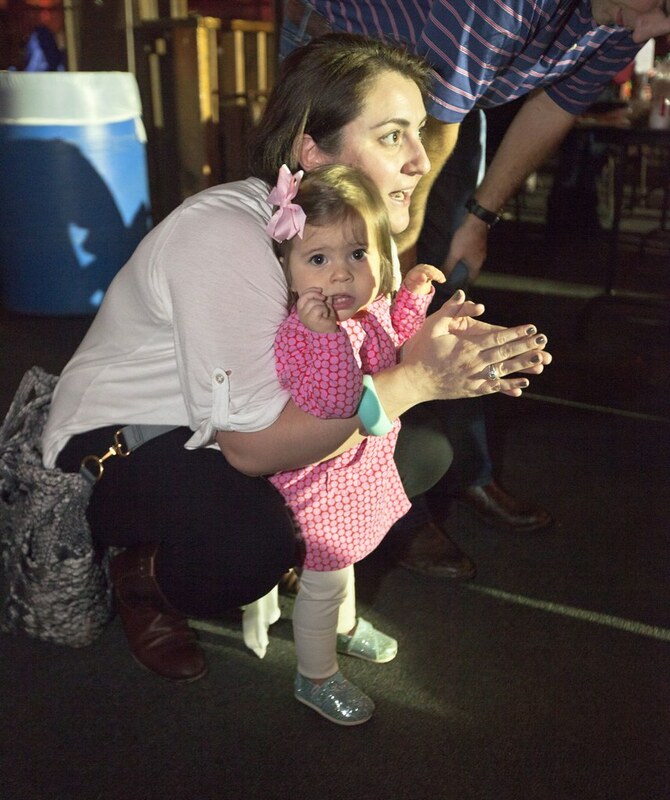 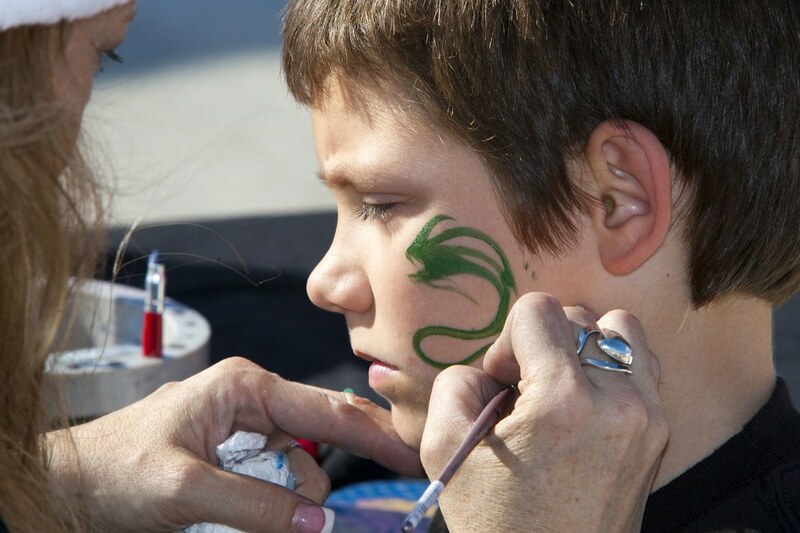 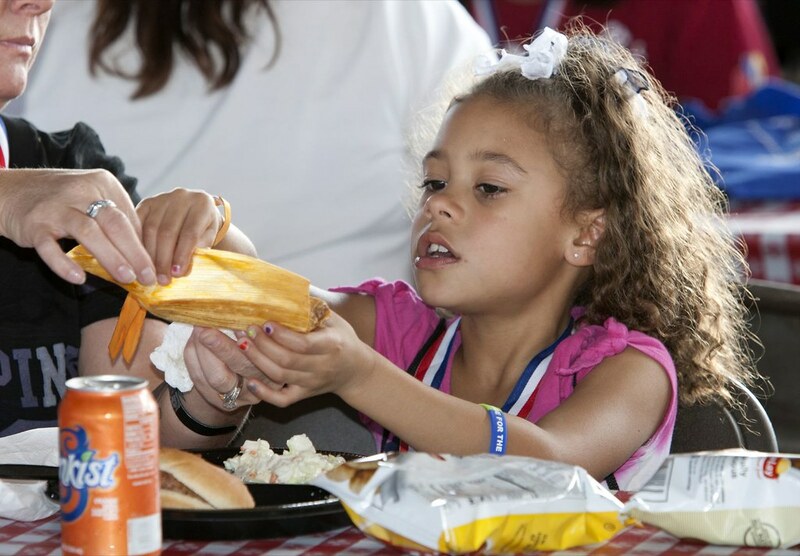 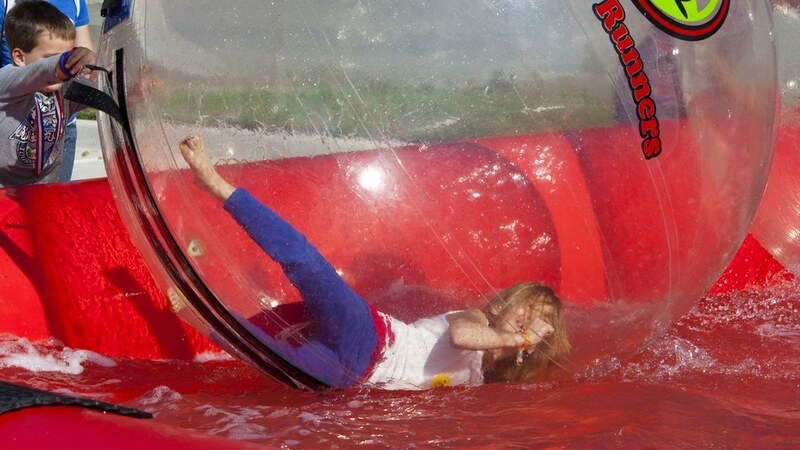 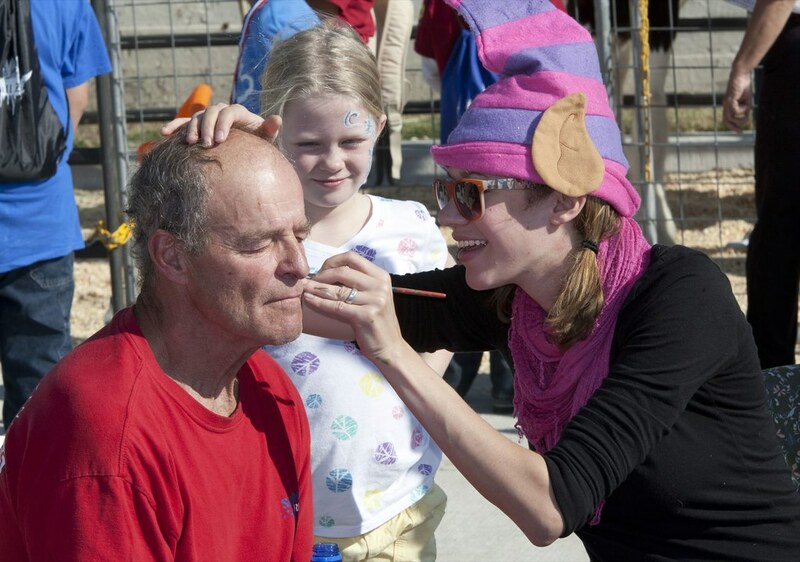 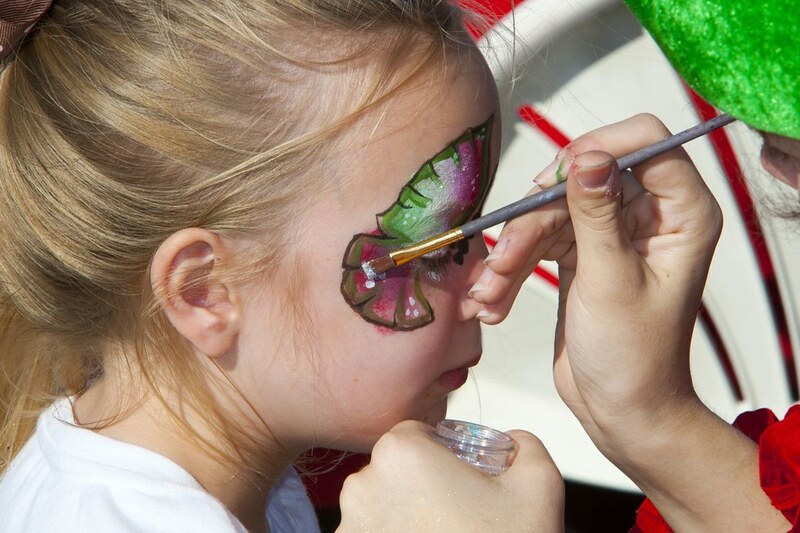 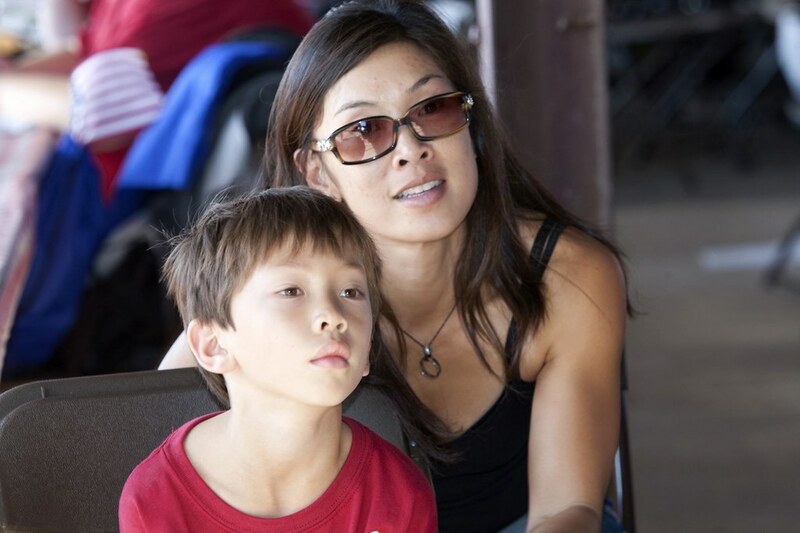 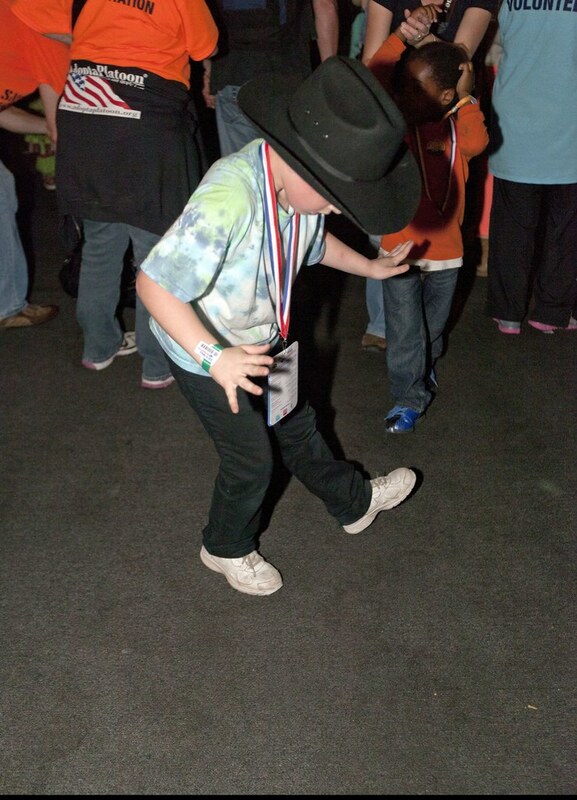 The families were also treated to time to get lost in the Maze, meet some friendly animals in the petting zoo, and the chance to ride – or try to ride – a mechanical bull. 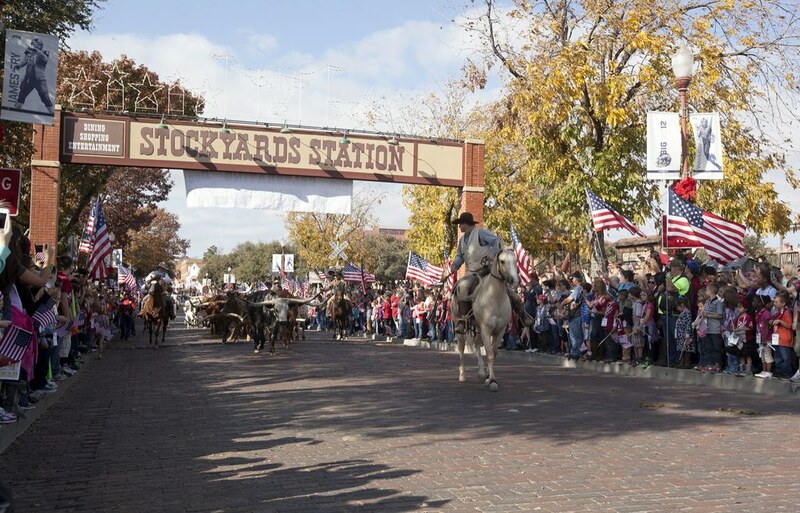 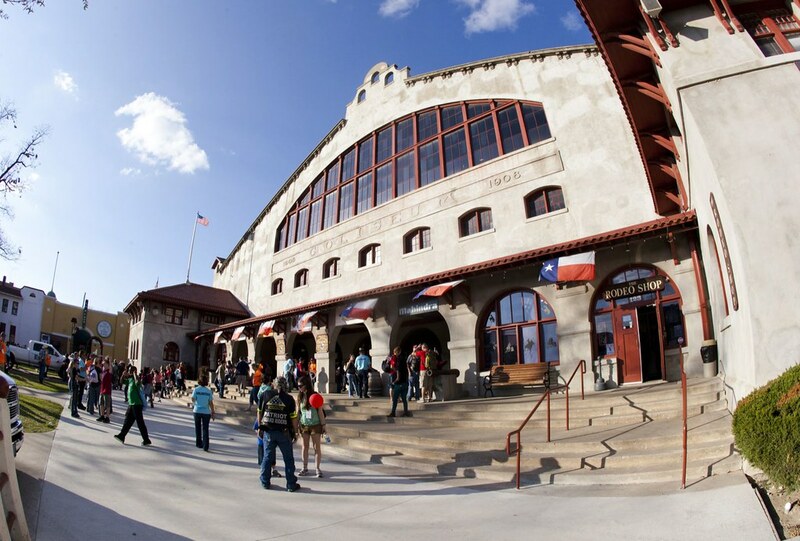 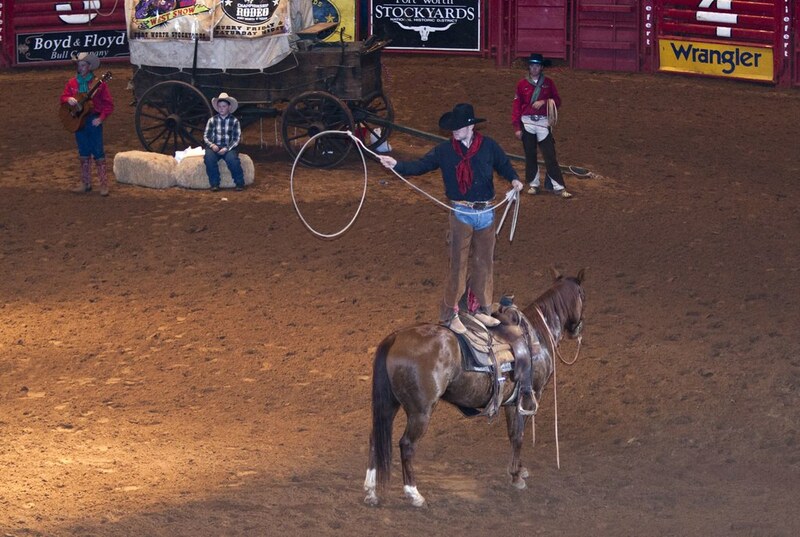 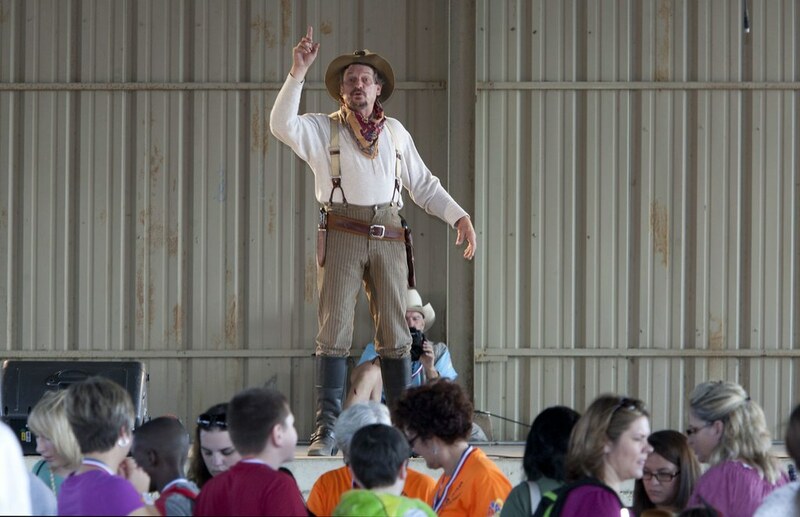 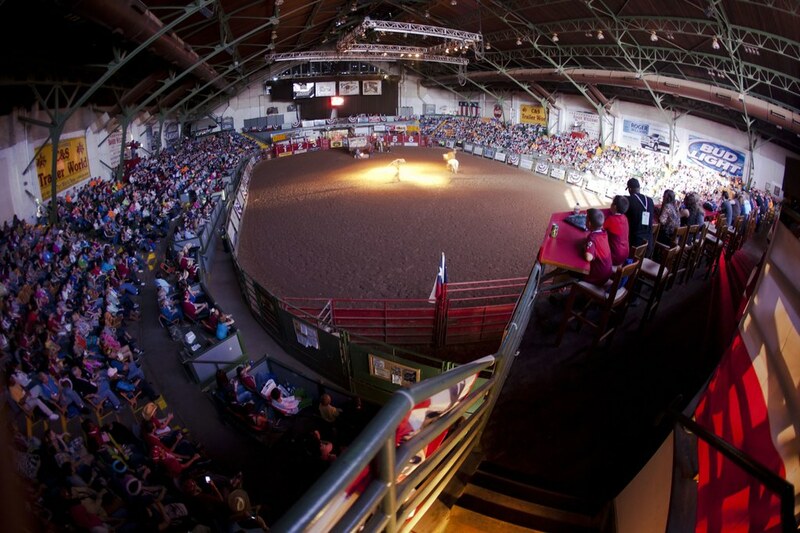 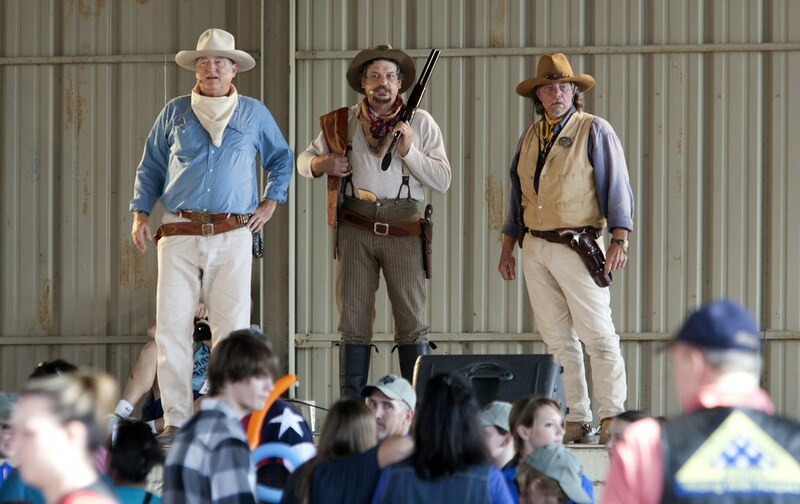 After a little time to explore the shops and attractions of Stockyards Station, it was off to the Stockyards Coliseum for Pawnee Bill’s Wild West Show. 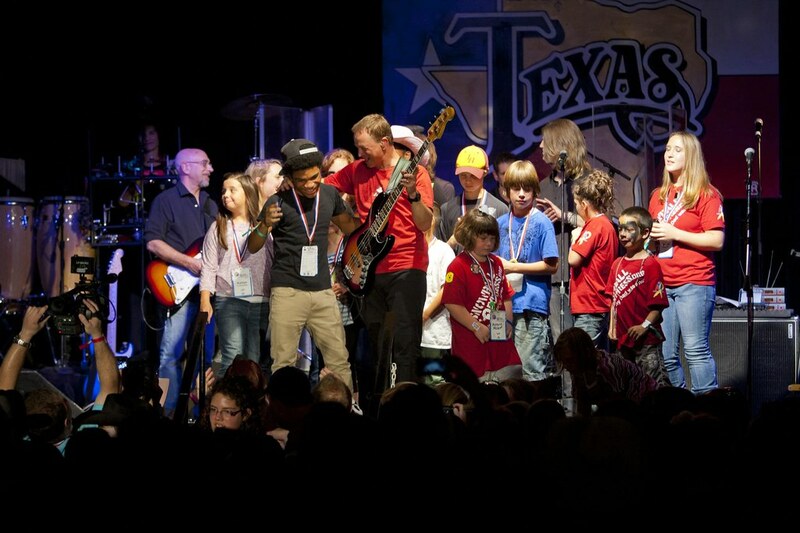 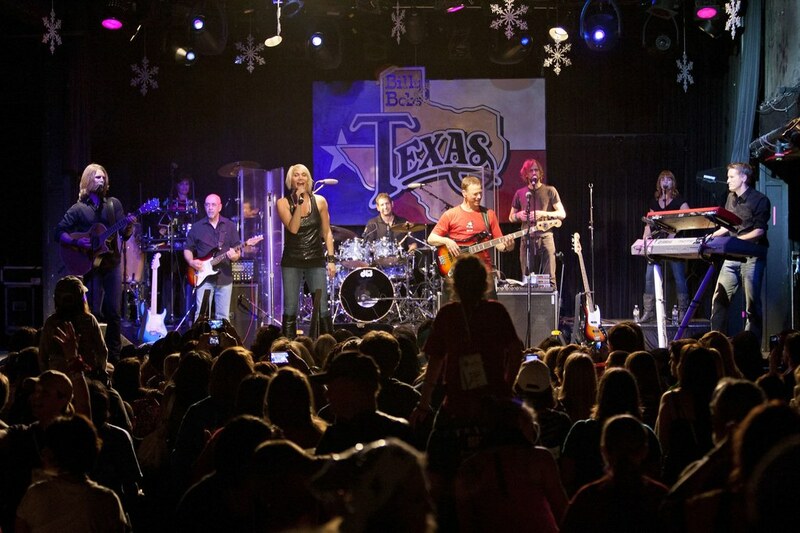 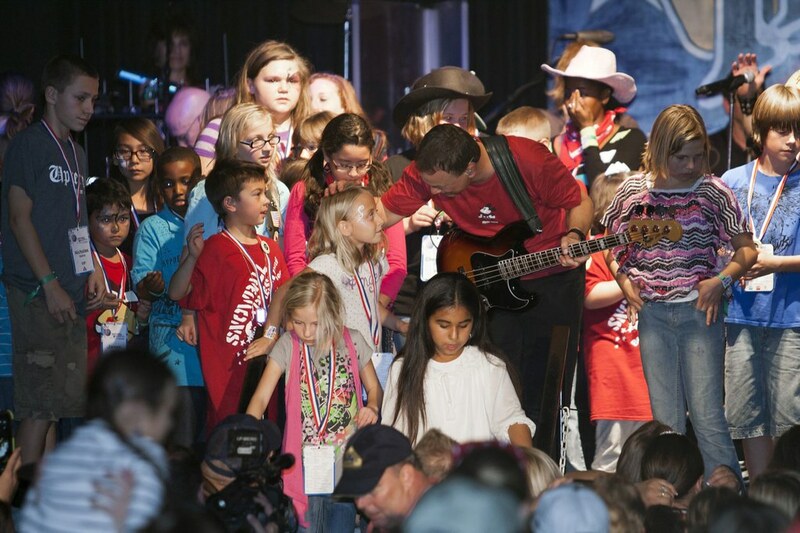 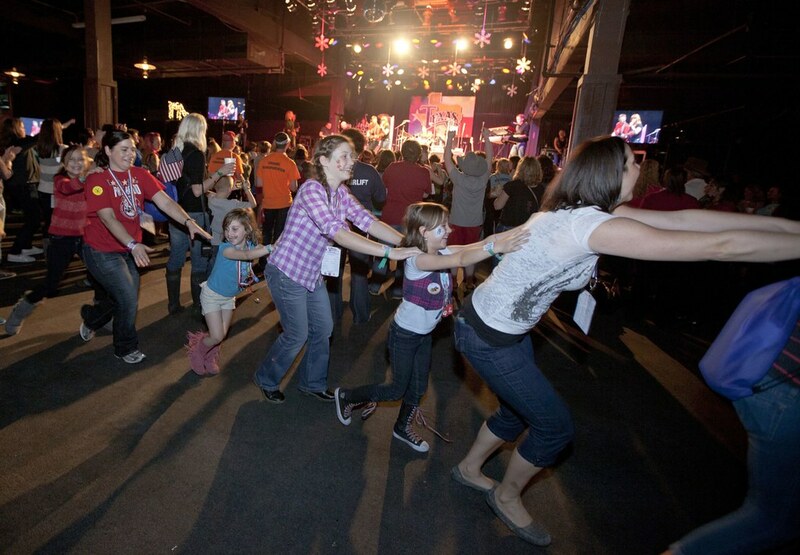 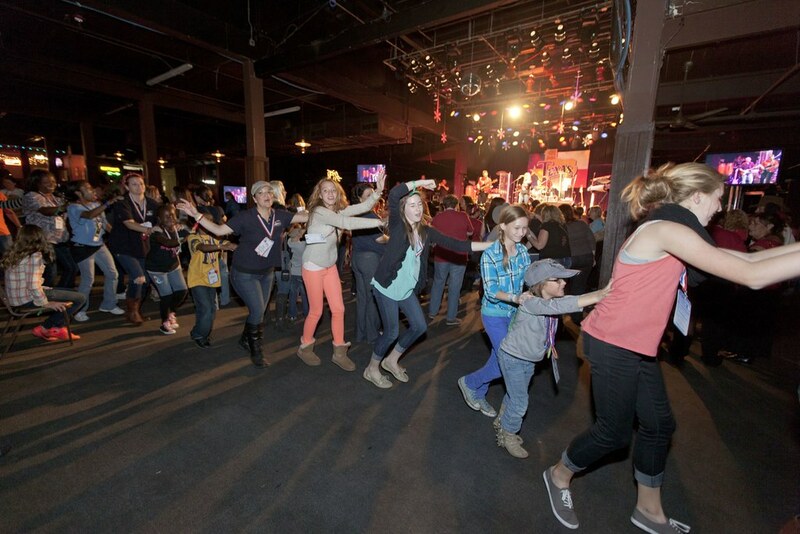 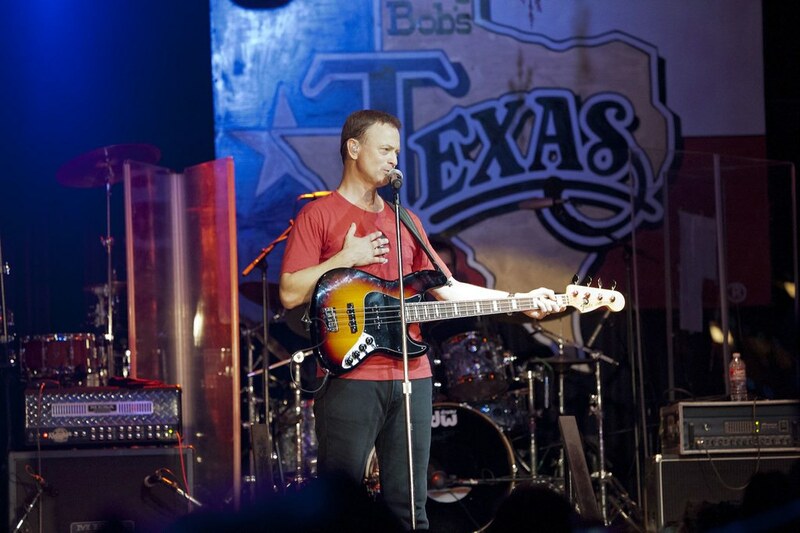 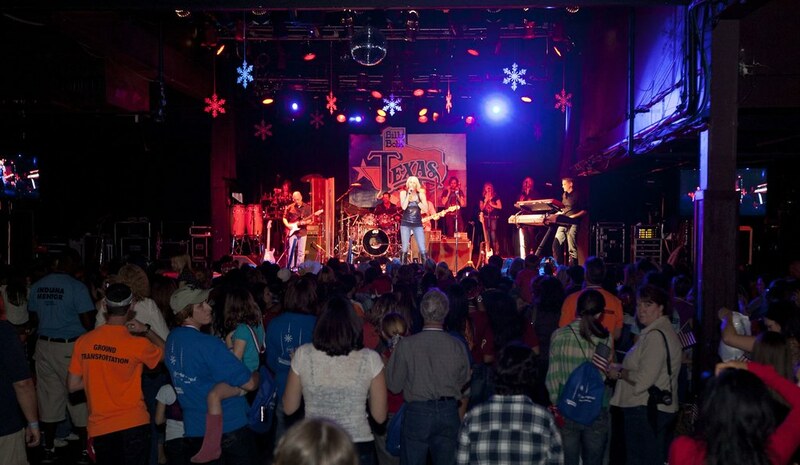 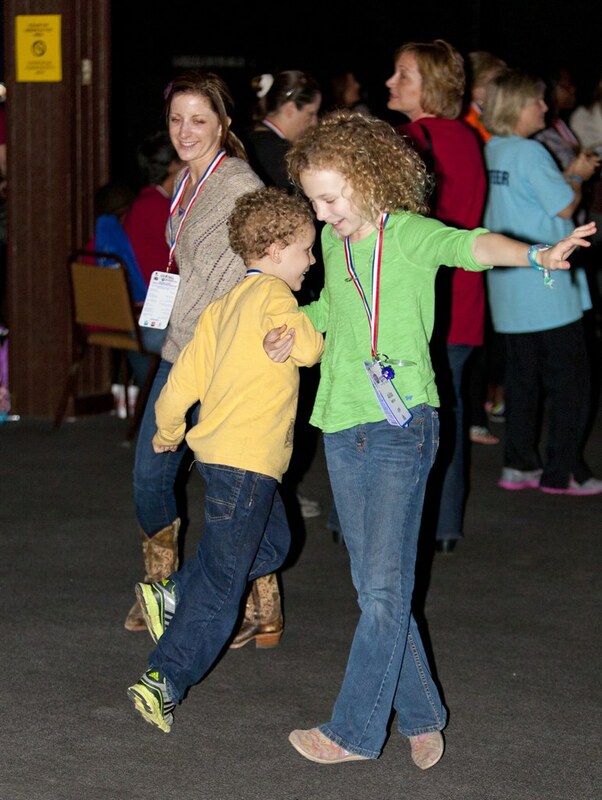 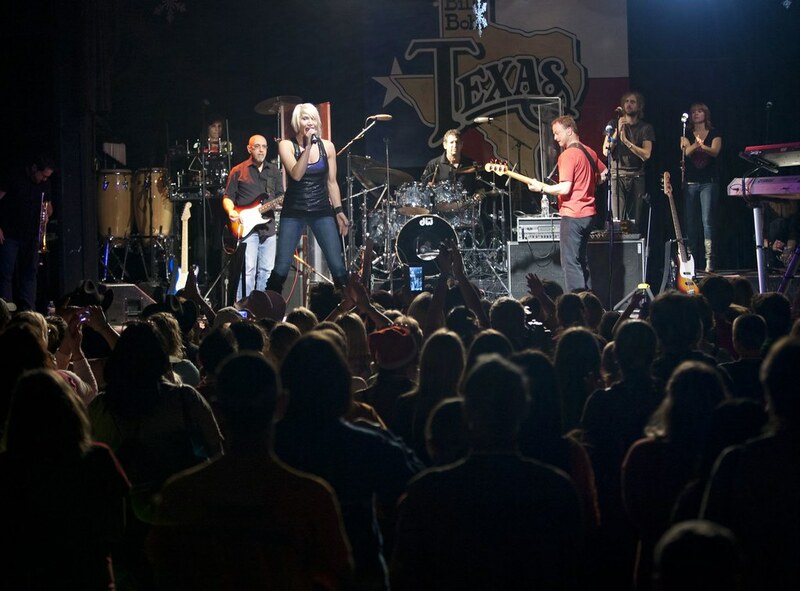 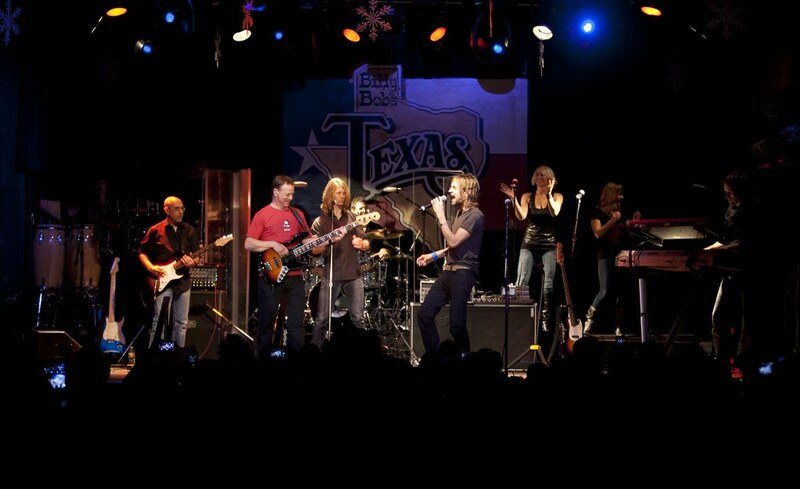 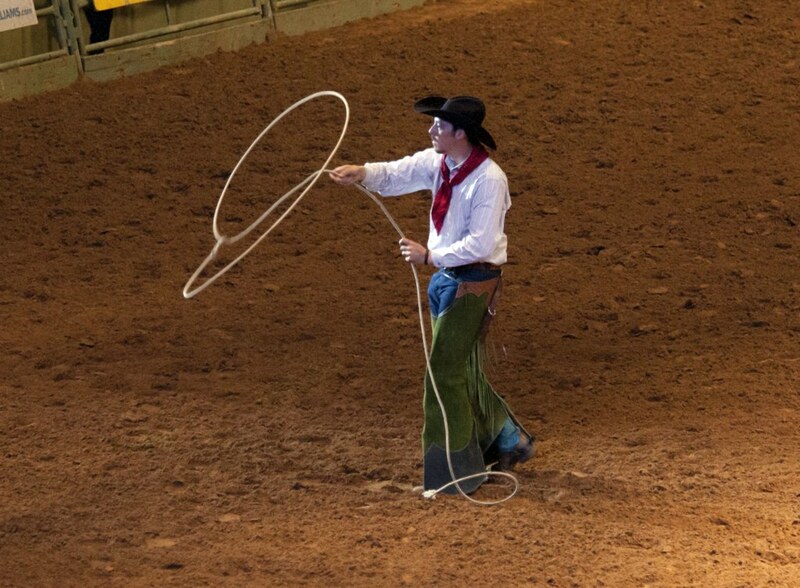 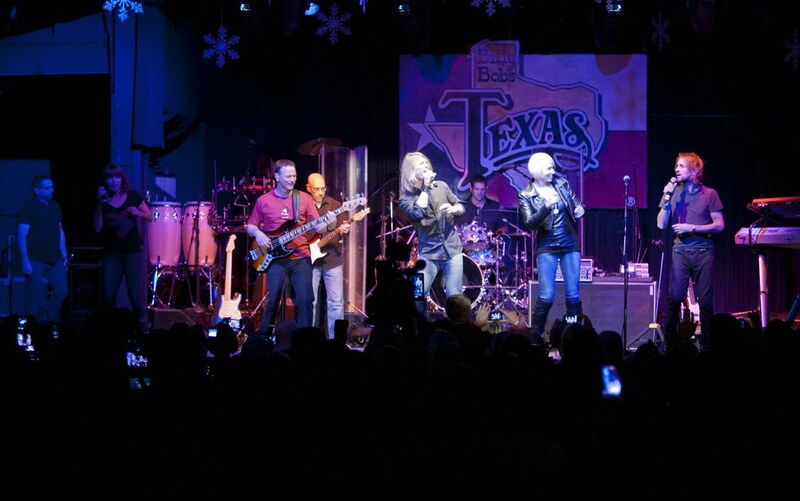 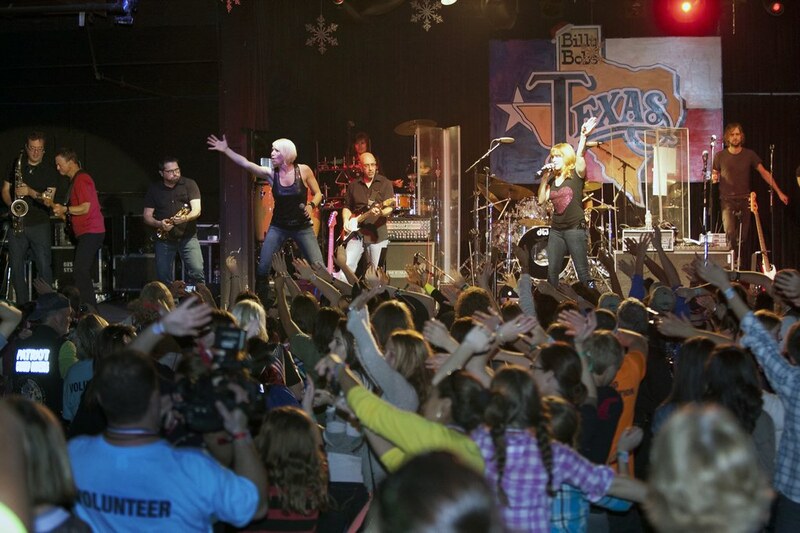 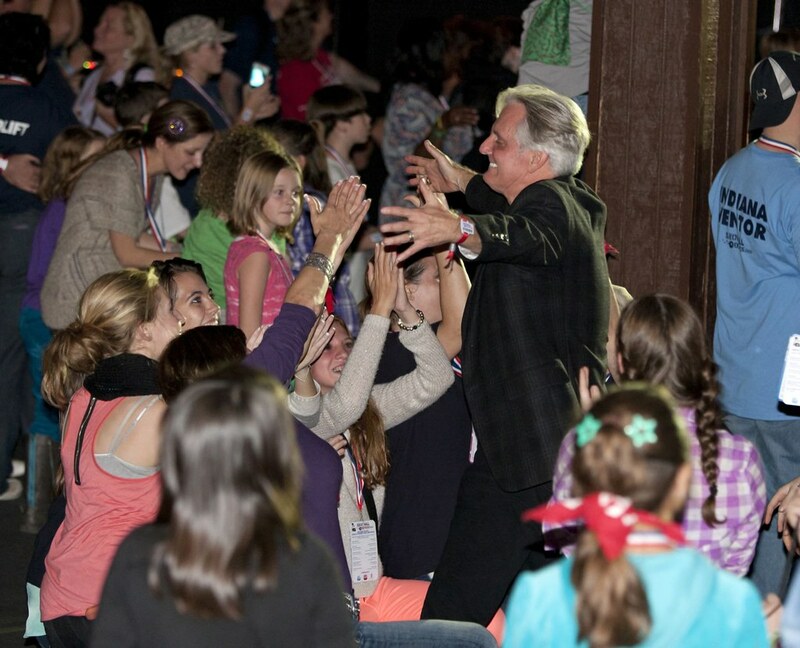 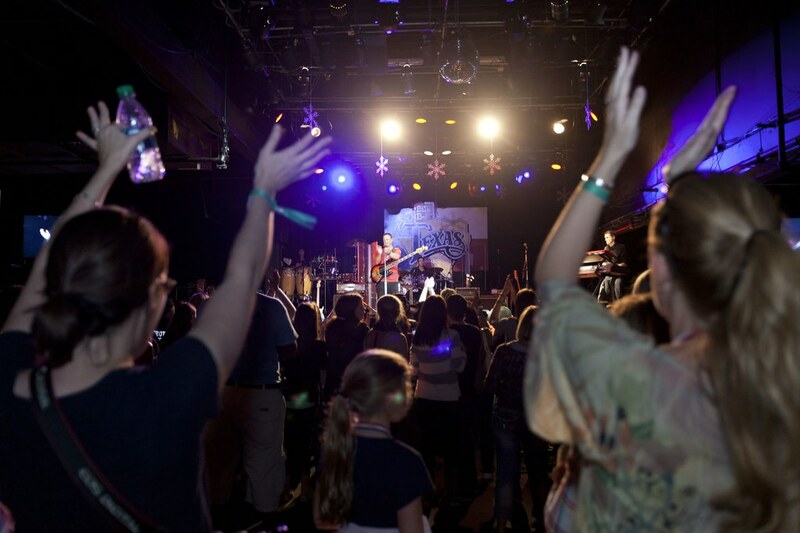 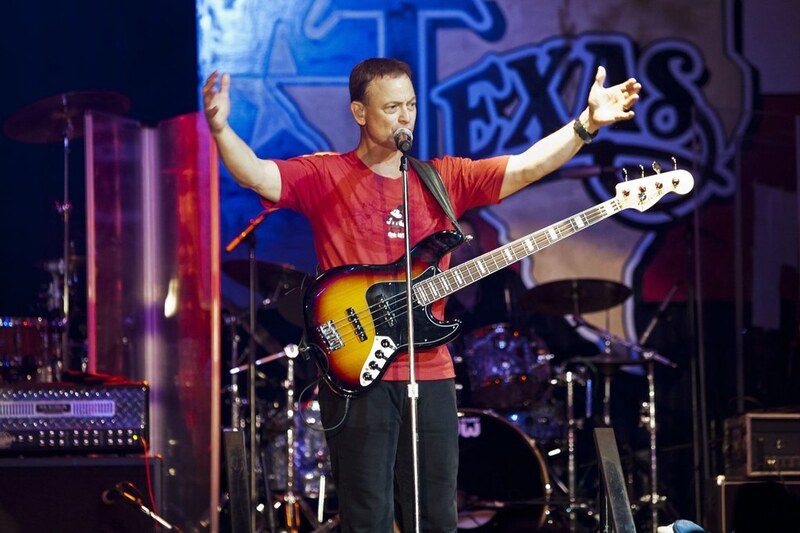 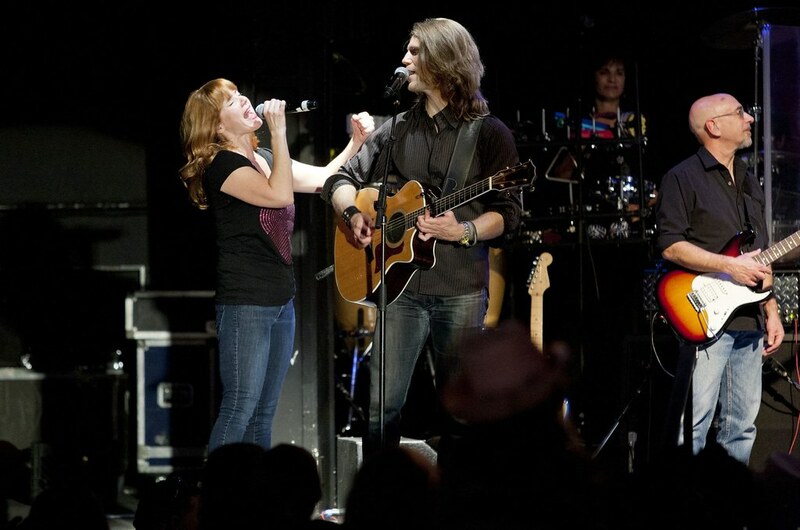 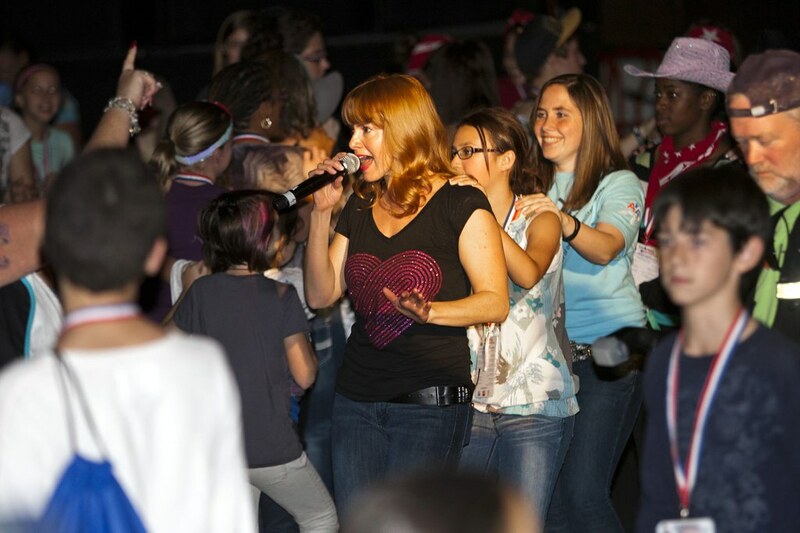 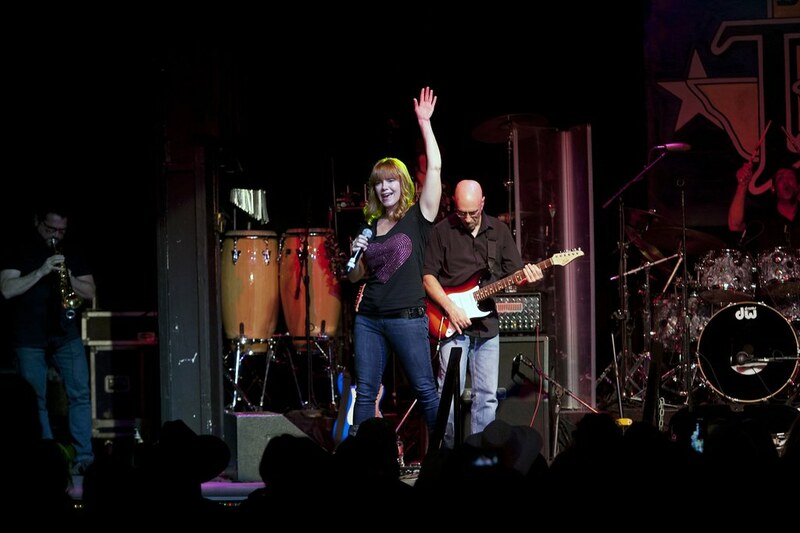 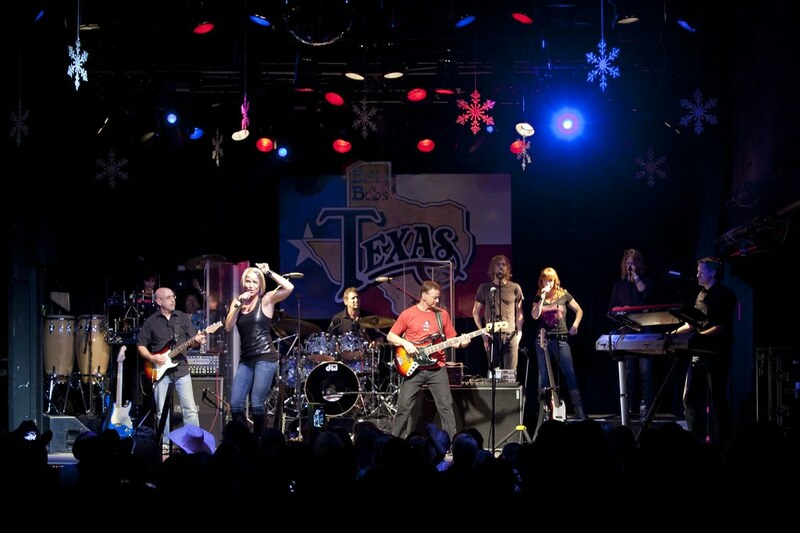 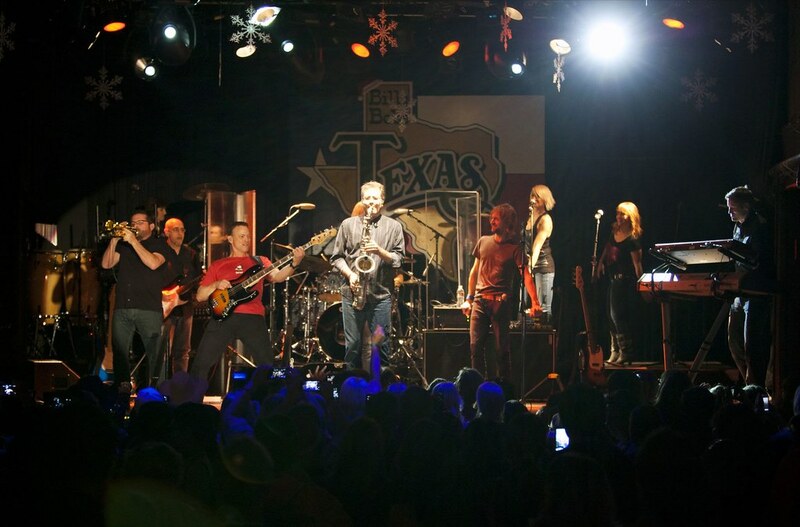 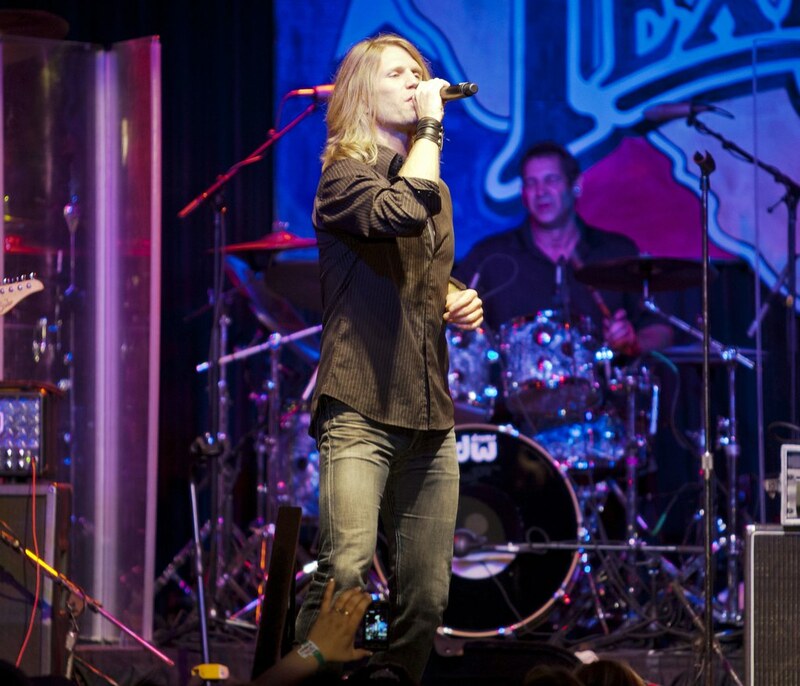 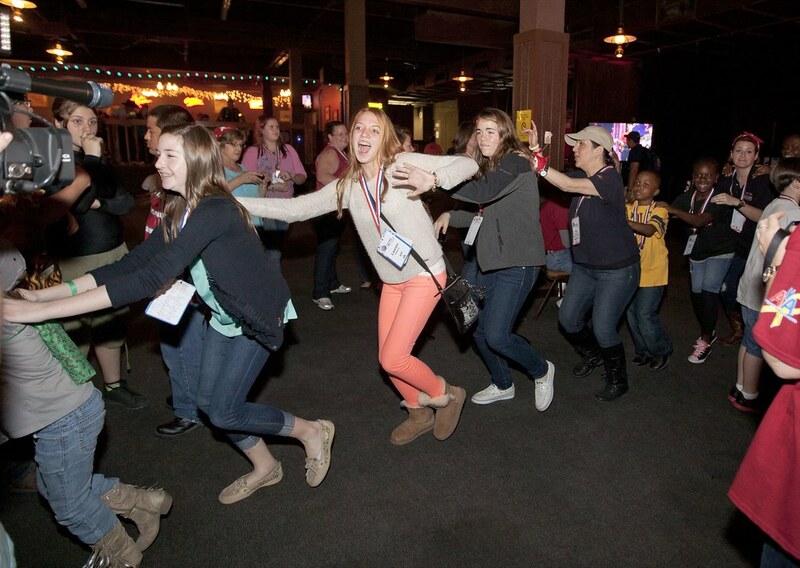 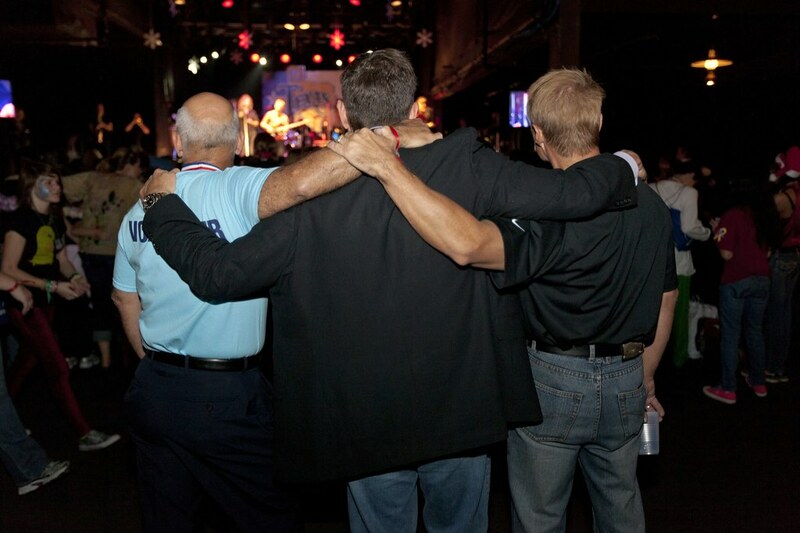 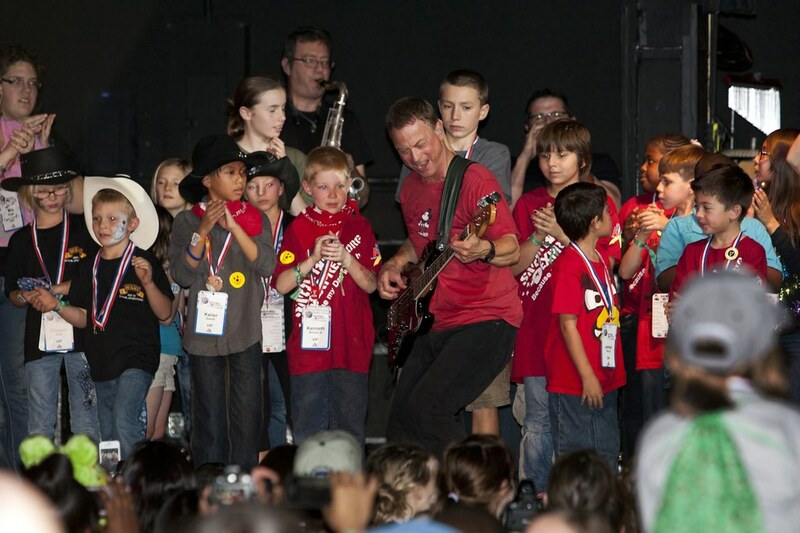 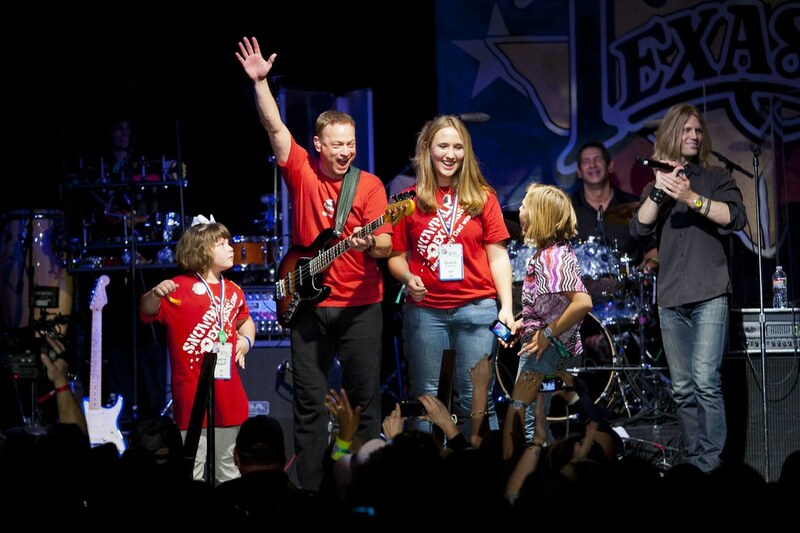 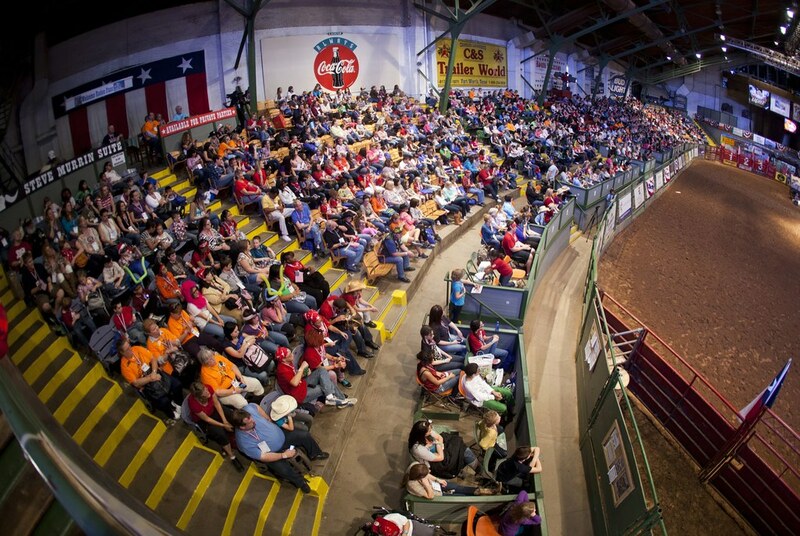 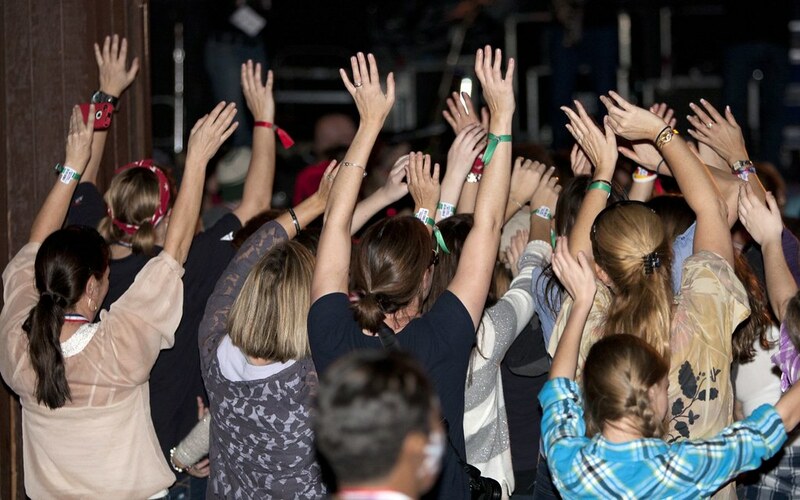 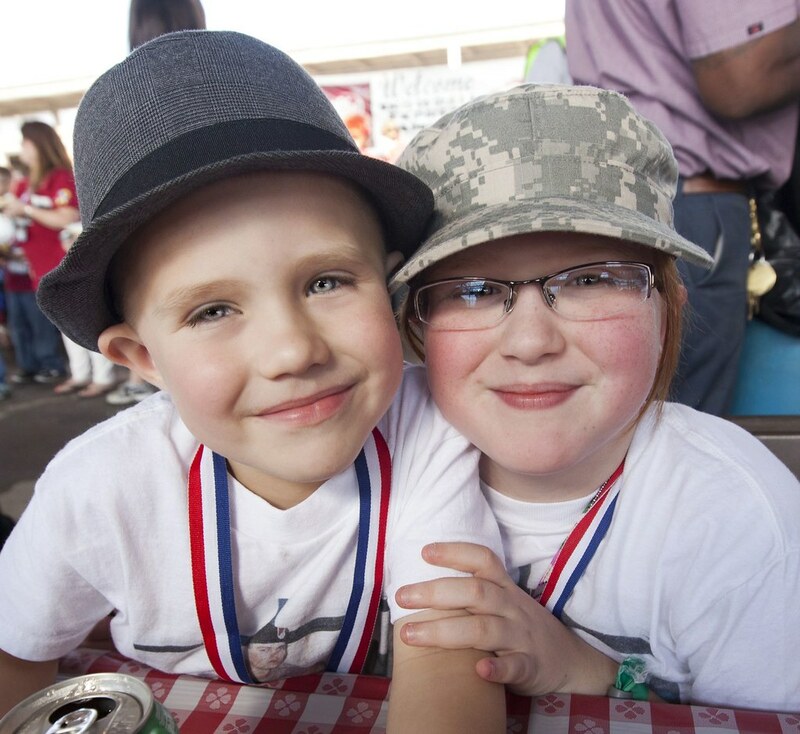 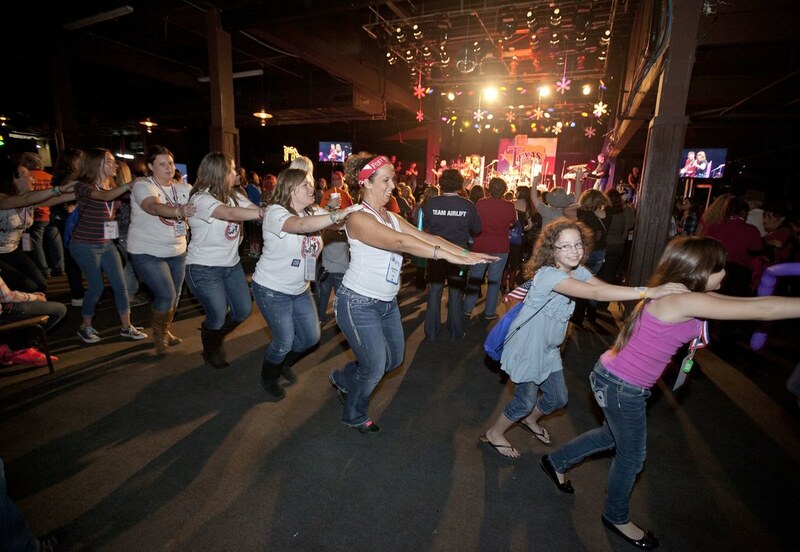 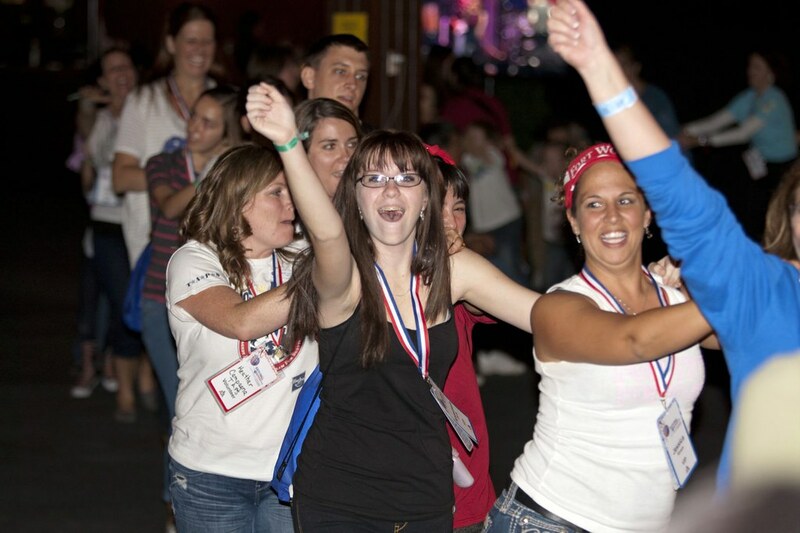 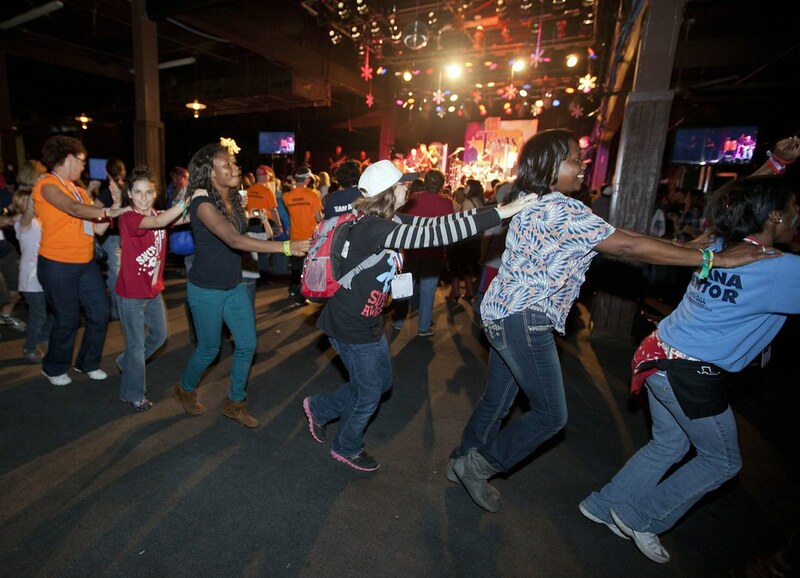 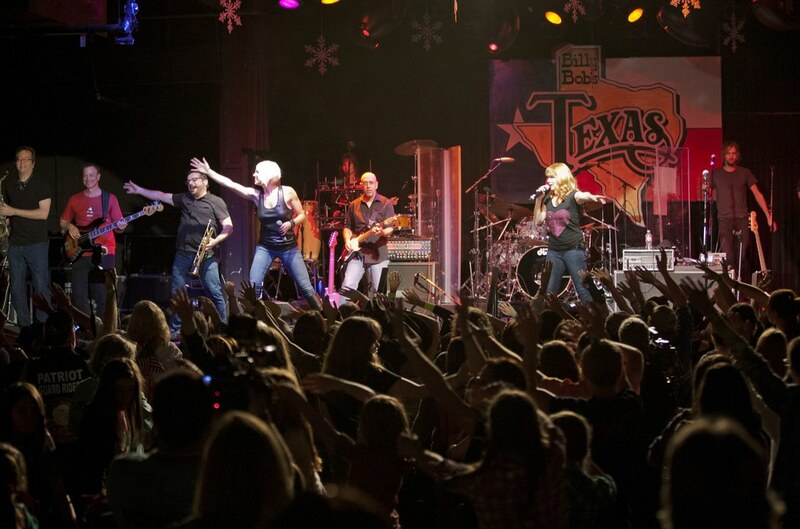 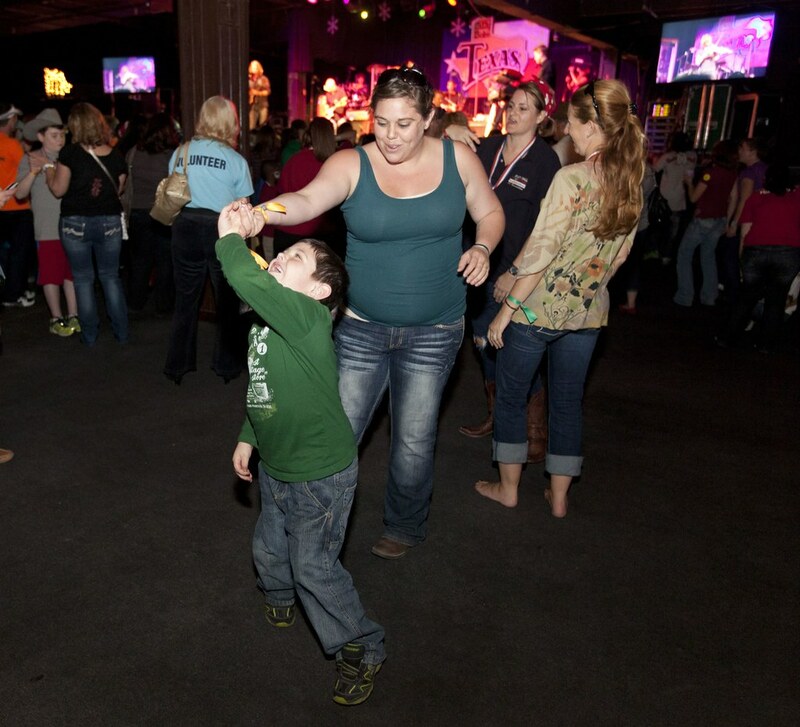 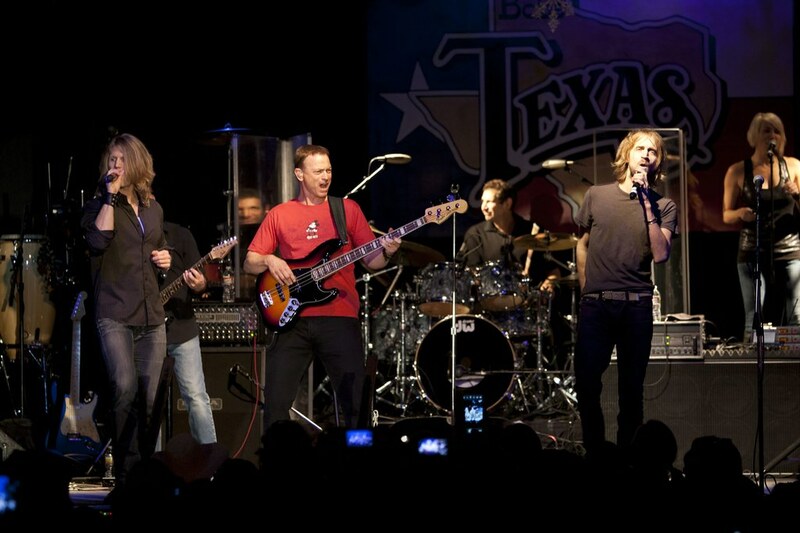 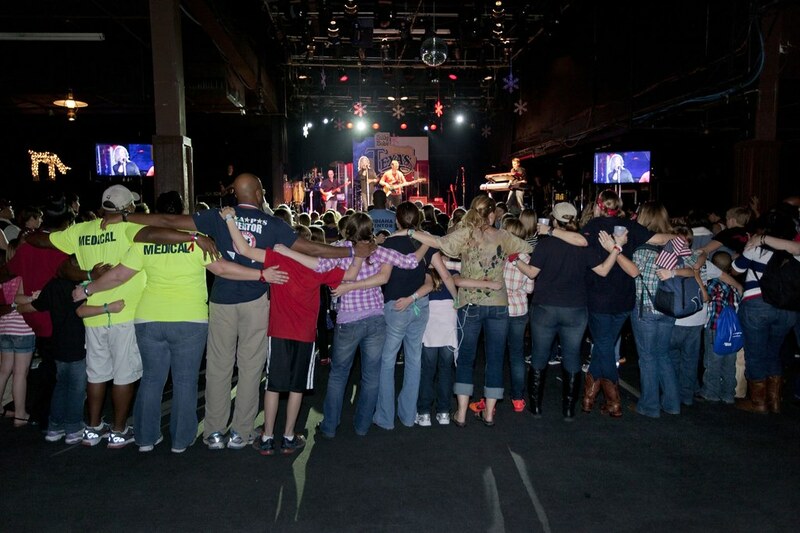 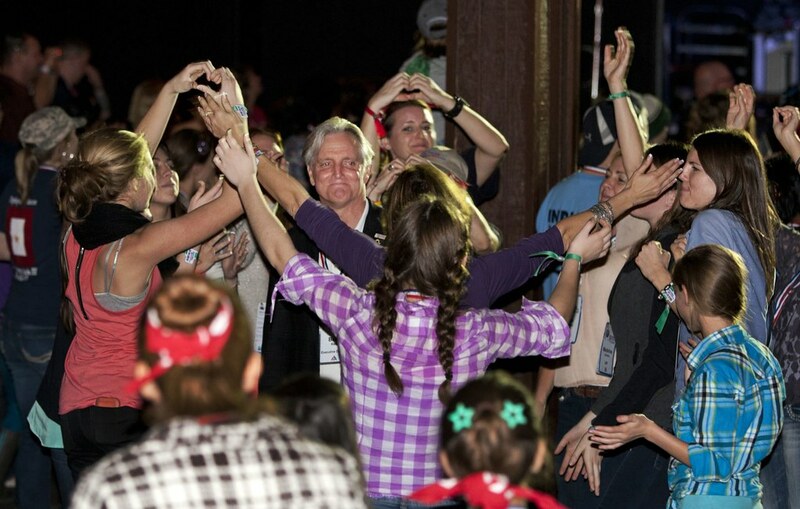 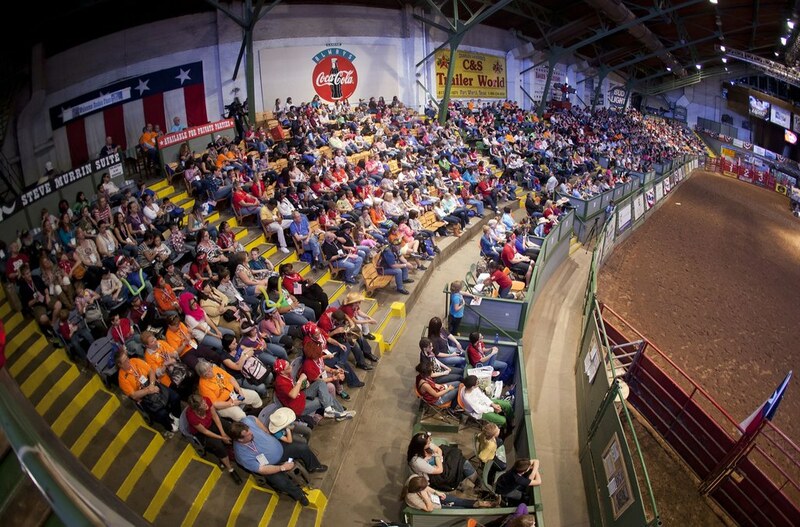 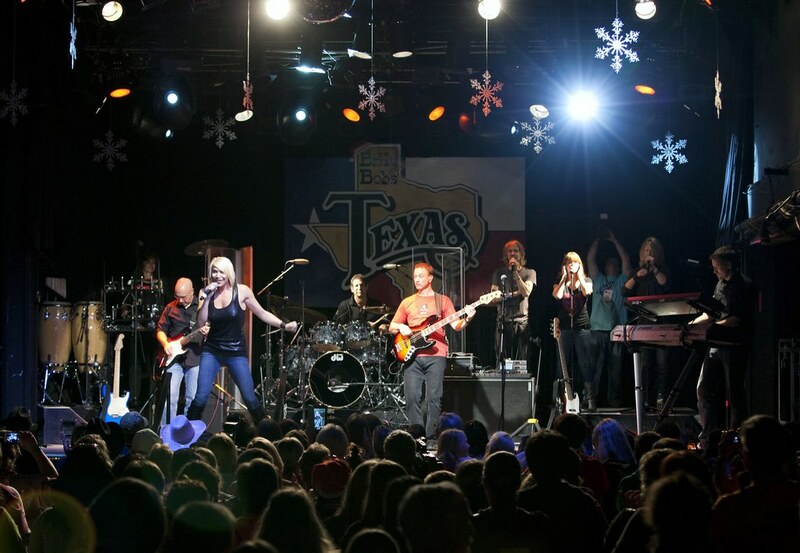 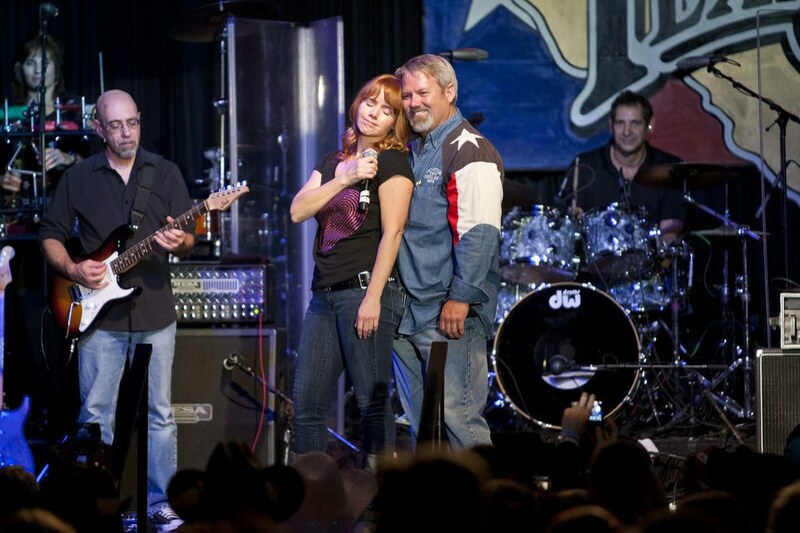 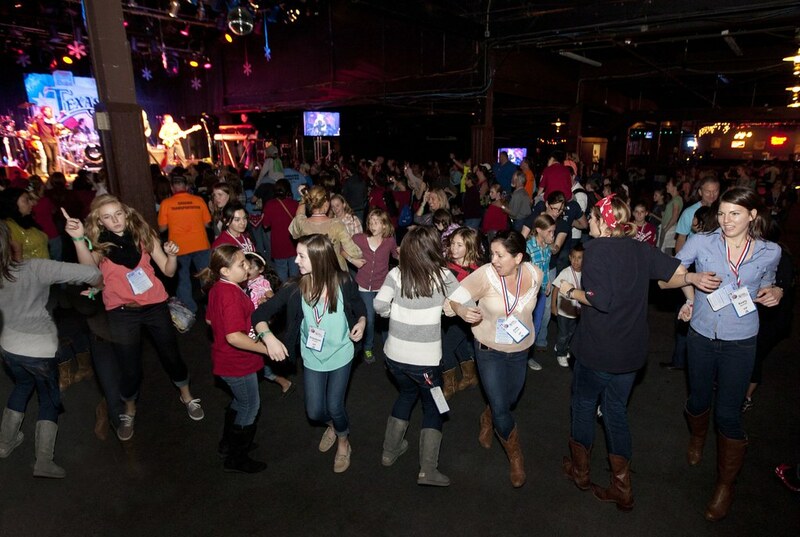 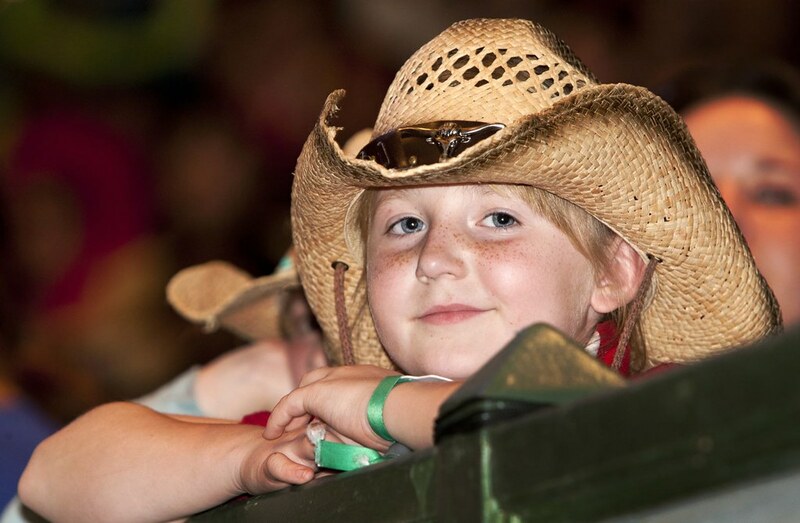 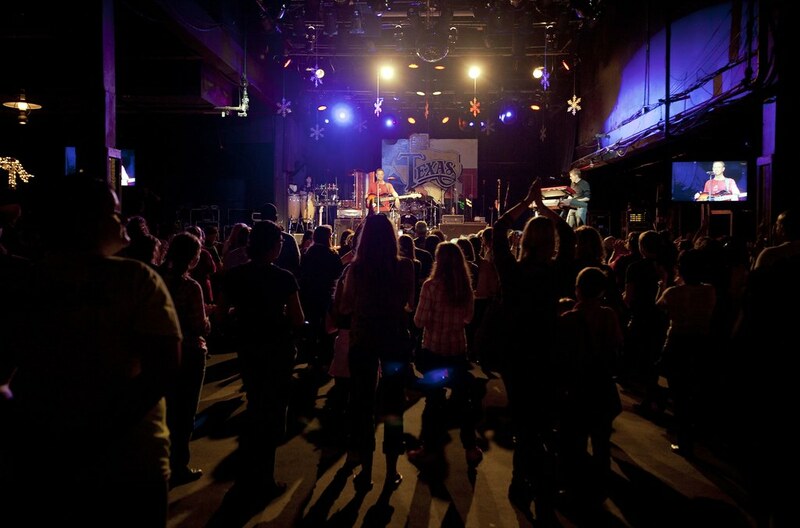 The evening was capped off by fun, food, and entertainment at Billy Bob’s Texas. 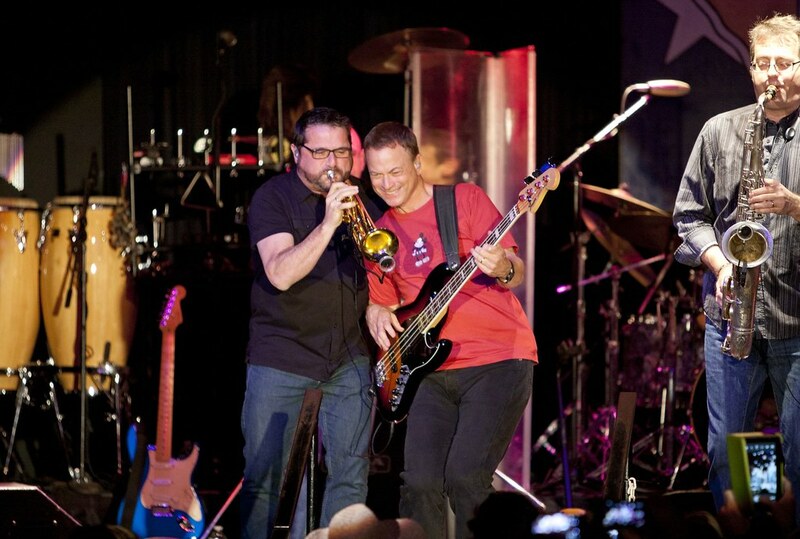 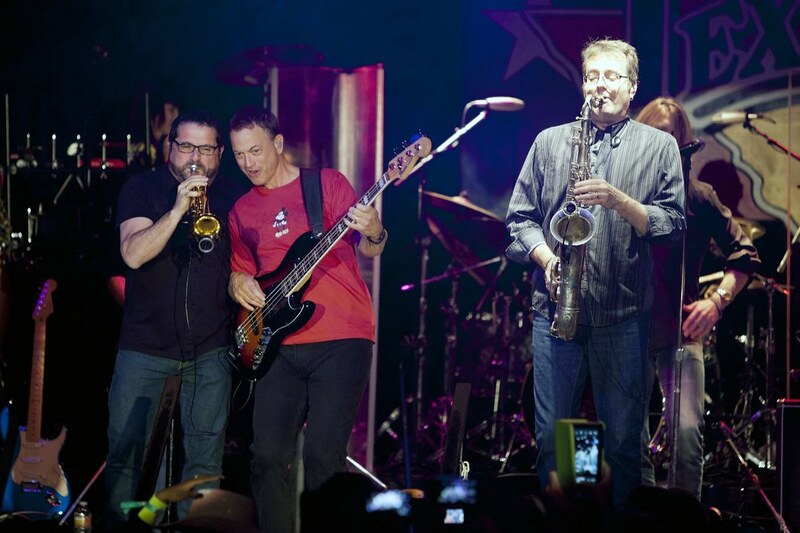 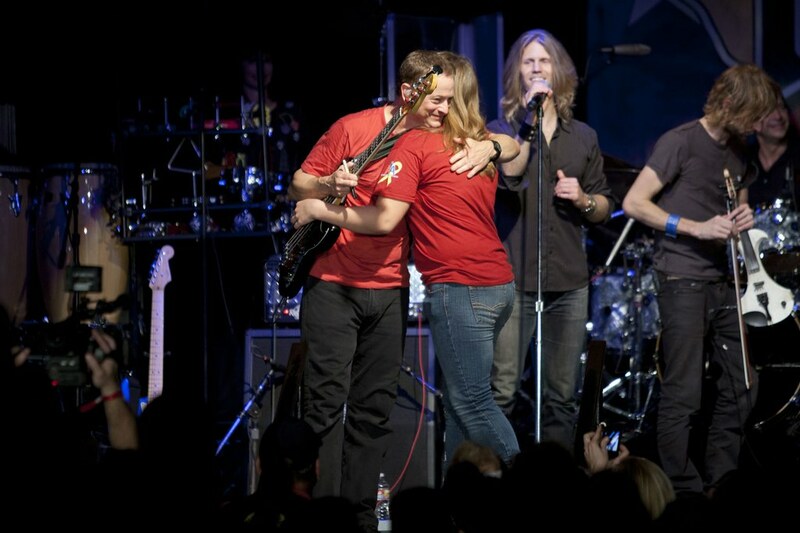 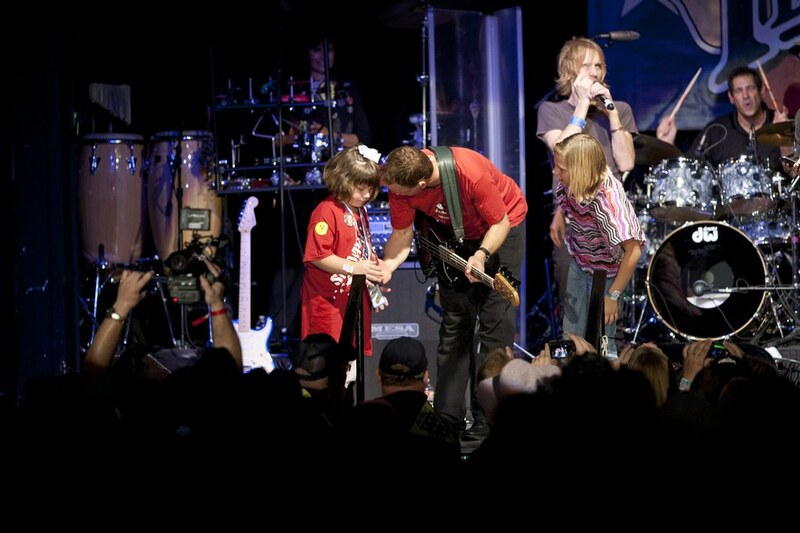 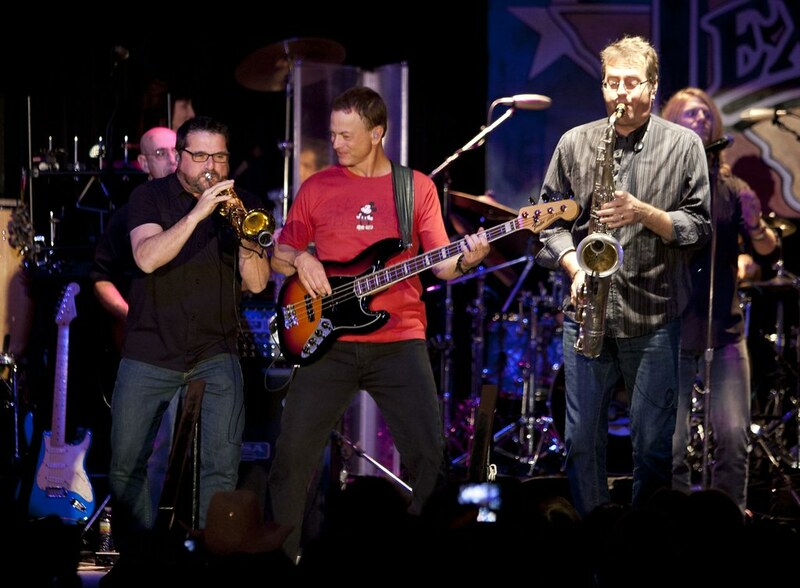 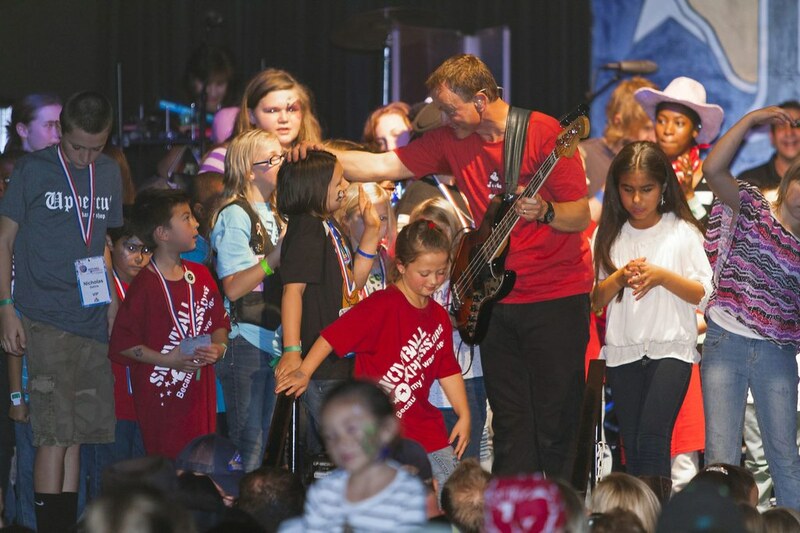 Gary Sinese and the Lt Dan Band put on their usual fabulous performance and show of gratitude for what these families have sacrificed for th rest of us. 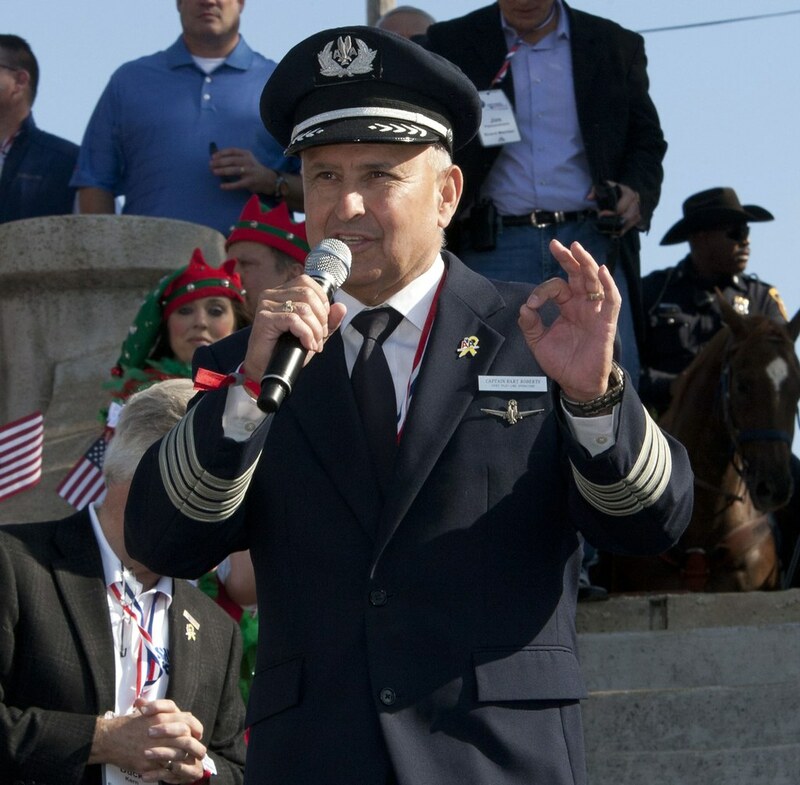 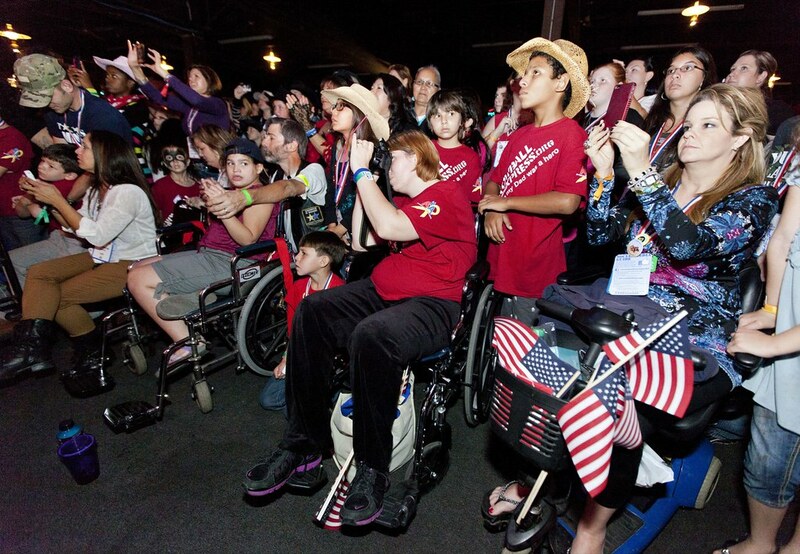 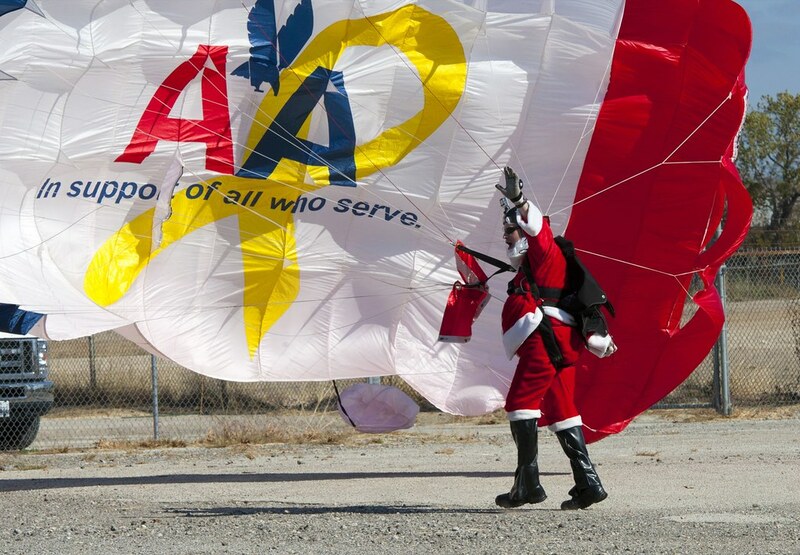 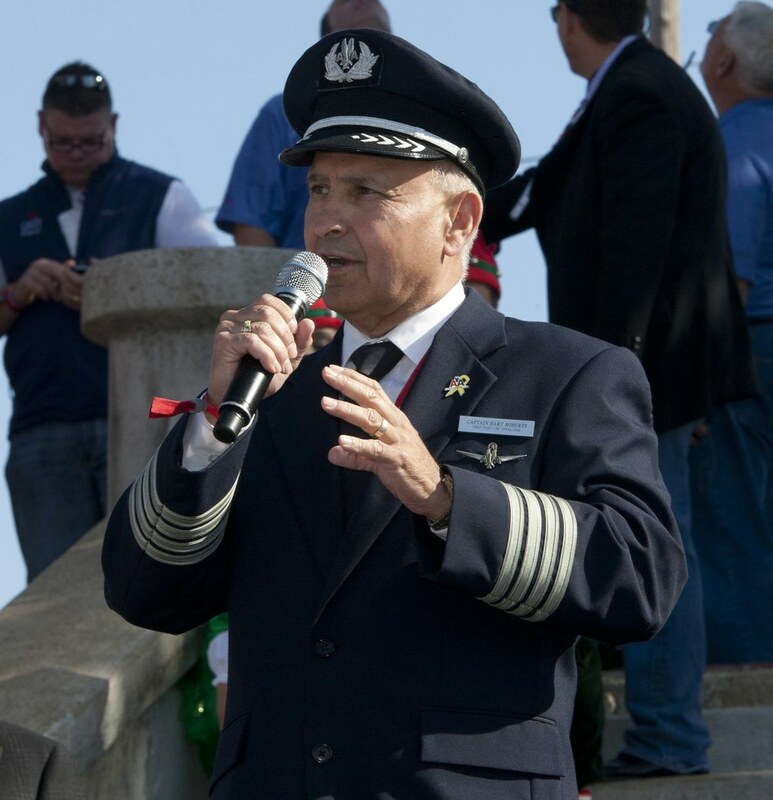 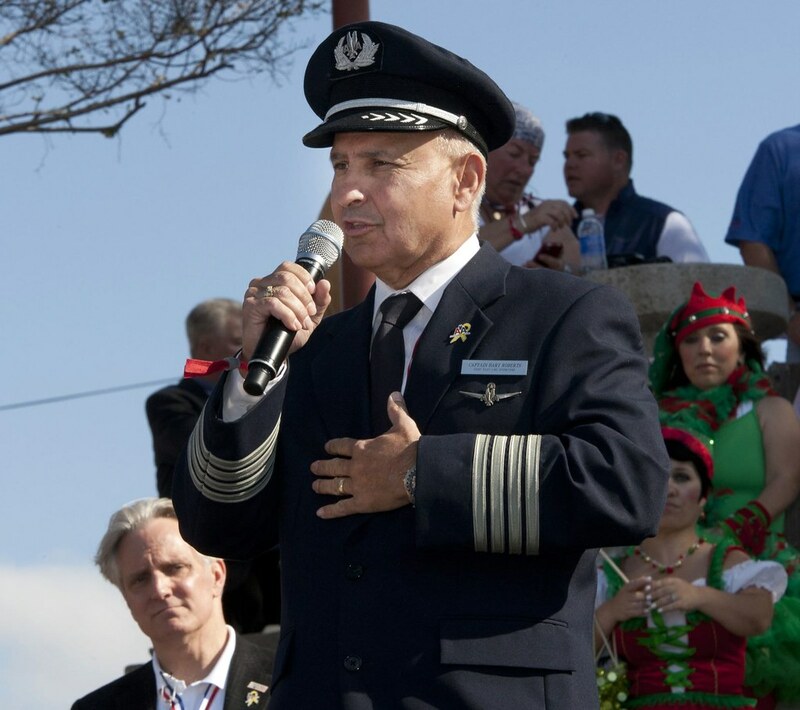 There are too many people and organizations to thank in this short space, but the invaluable contributions of American Airlines as the presenting sponsor in providing transportation for the Snowball families to attend must be recognized. 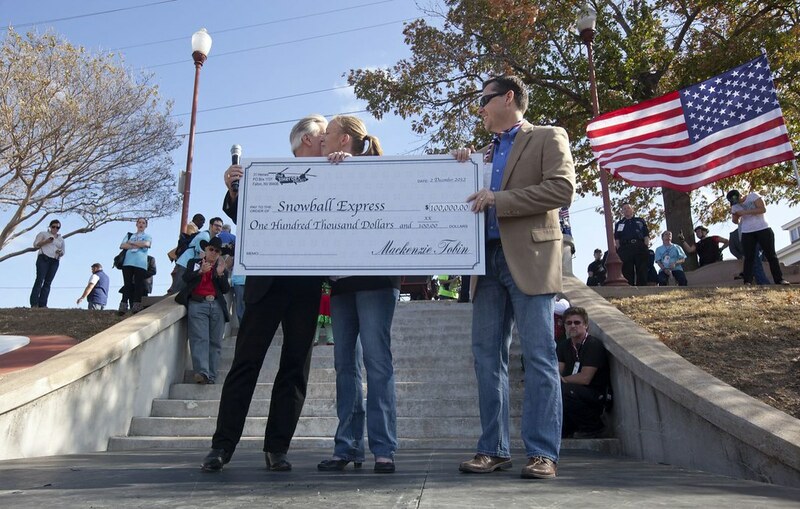 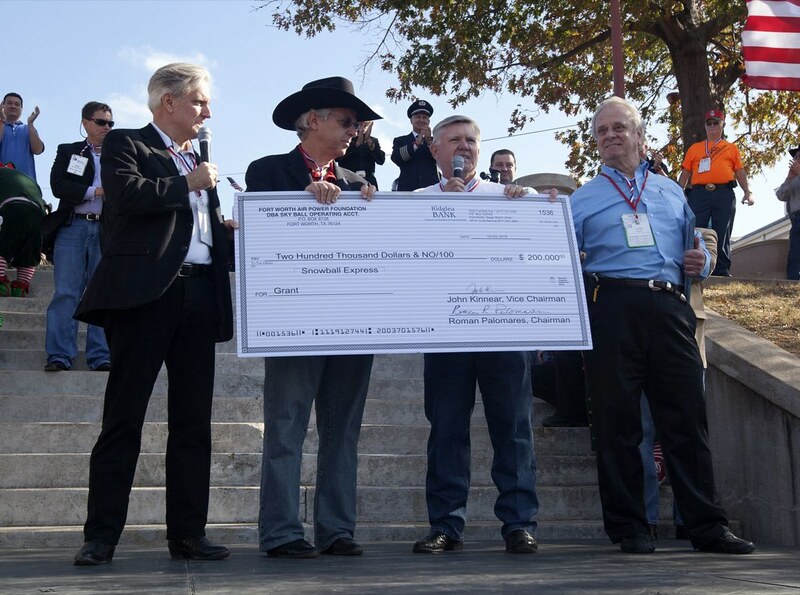 Since this is written for the Fort Worth Air Power Council and Foundation newsletter, I would be remiss in not recognizing the very generous monetary contribution the Foundation makes each year to Snowball Express, and to recognize the many Council members who volunteered to come out and help with the Snowball Express Fort Worth Day. 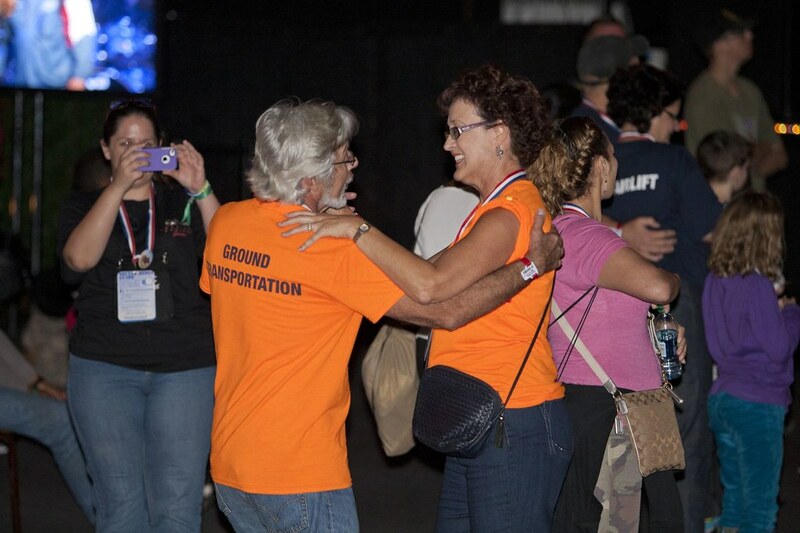 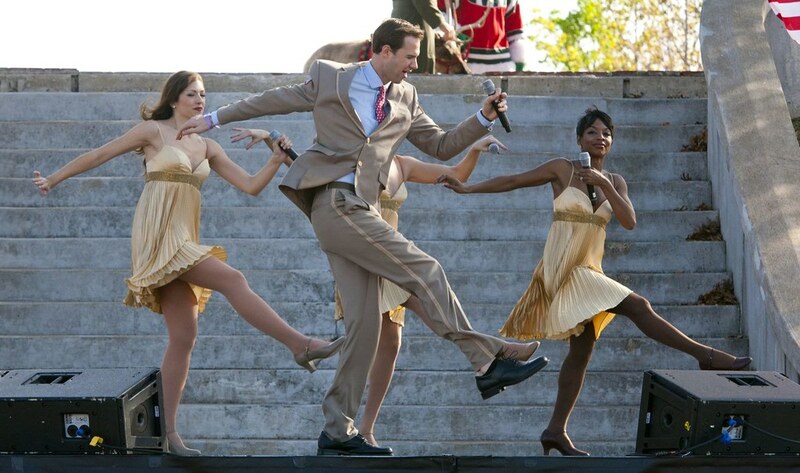 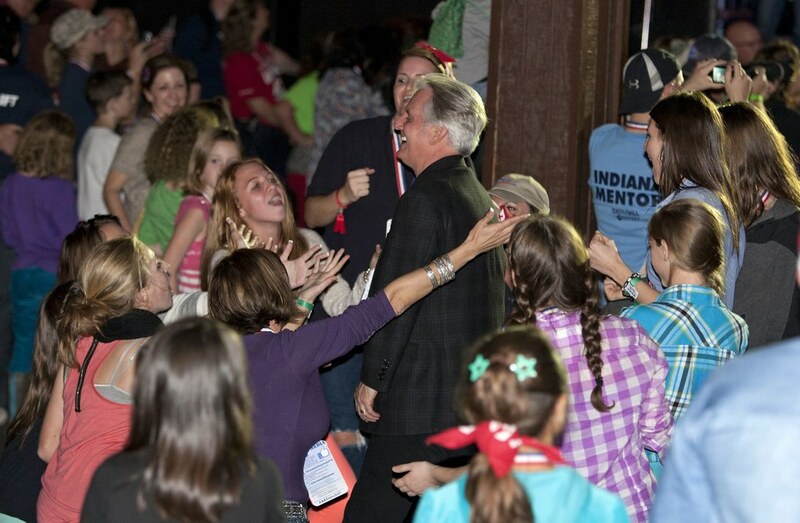 Your servant spirit was evident and appreciated.